It is well-known that a lens of a given focal length will deliver different angles of view when used with cameras having different sized sensors. For example, the above image was made with a Nikon D90 and a Nikkor 200-500mm f/5.6E telephoto zoom lens at 500mm. The D90 is a DX format camera having a 1.5x crop factor. 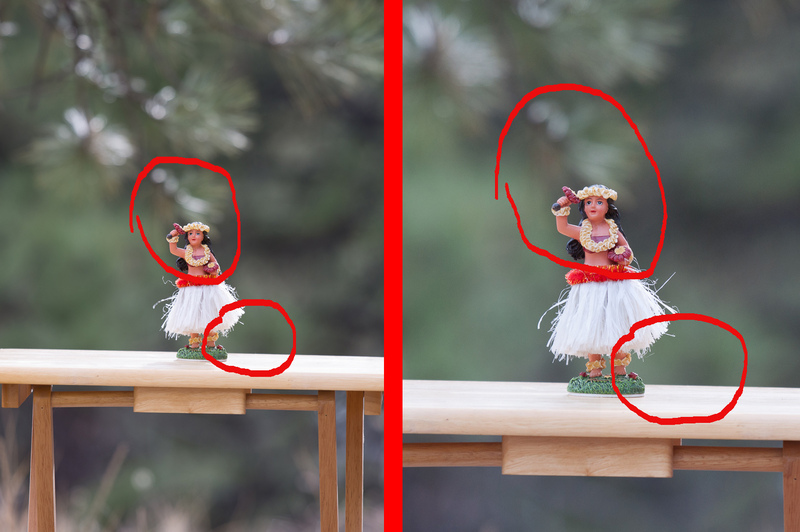 In other words, the DX sensor crops the outer portion of the image formed by the lens. As a result, photographs made with this camera will display an angle of view equivalent to that produced by a lens with 1.5x the actual focal length used. In the above image, the 200-500 is at 500mm but the angle of view matches that produced by a 750mm lens. It is often said that a crop sensor camera will also produce an image having a greater depth of field. In other words, the same lens at the same focal length will produce, not just a wider angle of view when paired with a full frame camera, but also a shallower depth of field. 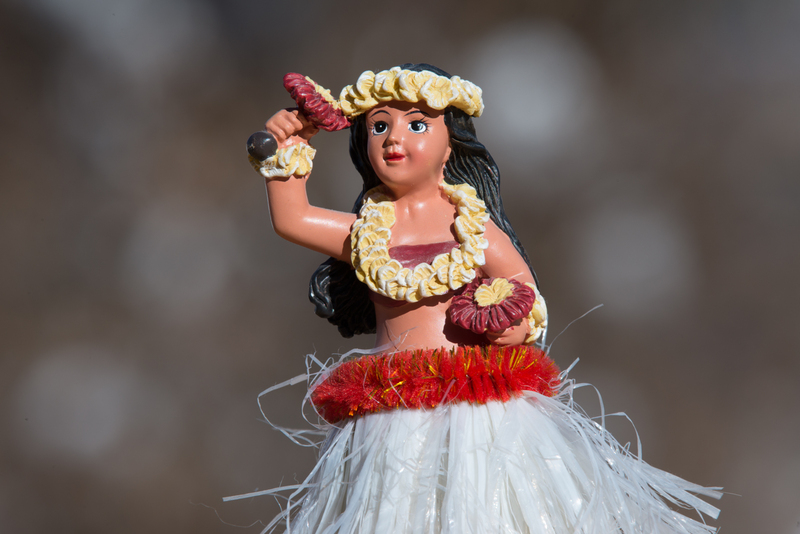 The claim is that the DX sensor not only crops the angle of view but forces a significant increase in depth of field. That assertion is just plain wrong. To isolate sensor size as the only variable, the comparison images were made with the lenses at the same focal length, focal ratio and at the same distance from a fixed position subject. The Nikkor 200-500mm f/5.6E and Tamron 70-200mm f/2.8 Di VC USD were mounted on a tripod in a fixed position. The Tamron 24-70mm f/2.8 Di VC USD has no tripod collar or foot. The cameras were mounted to the tripod with the tripod in the same position for each set of exposures. Each lens was used wide open at its smallest f-stop number. ISO and shutter speed were kept constant for exposures made at the same focal length with both cameras. 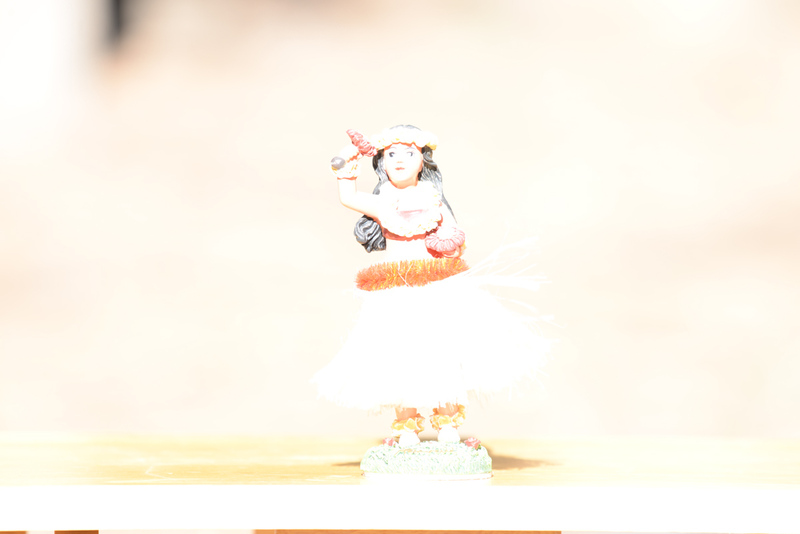 Why did I decide to test the notion that sensor size has a significant impact on depth of field? 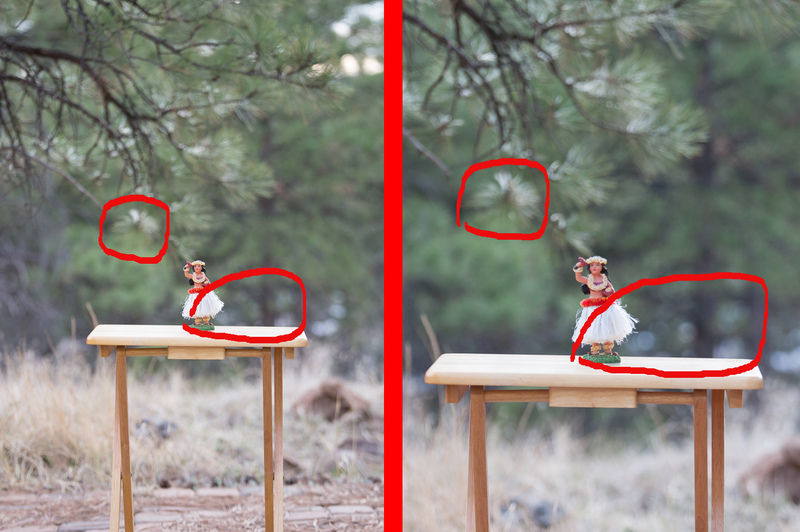 I performed this experiment to test my belief that that lens aperture and distance to subject are the two factors having the greatest impact on depth of field. In other words, if a lens is used at the same physical aperture and distance to make photographs of a fixed position subject with two cameras of different sensor size, the depth of field recorded in the two images should be identical or, at least, very nearly so. If I’m correct in this belief, the images should confirm it. If I’m wrong and if crop factor needs to be applied to depth of field as well as to focal length, photos made under the above conditions should exhibit obviously different depths of field with the photo made using the full frame camera consistently displaying an obviously shallower depth of field than the photo made using the crop sensor body. Keeping all this in mind, let’s go to the photos. Below, are ten composite images. The photo occupying the left half of each composite was made using the Nikon D610. The photo to the right of the divider was made using the Nikon D90. Since the same lens at the same focal length, f-stop and distance to subject was used to make each image in a composite, the image made with the crop sensor D90 (on the right) shows a narrower angle of view. In each composite, I’ve indicated similar sections of the two photos that, when compared, reveal both photos to have identical – or nearly so – depths of field. This conclusion is reached by comparing the relative size of the subject, a hula dancer toy, and the out of focus highlights and details in the background. Comparing the above ten photo sets, it’s clear the photographs capture equivalent depths of field despite the fact that they’re made with full frame and crop sensor cameras. As expected, the crop sensor camera captures a more narrow angle of view. 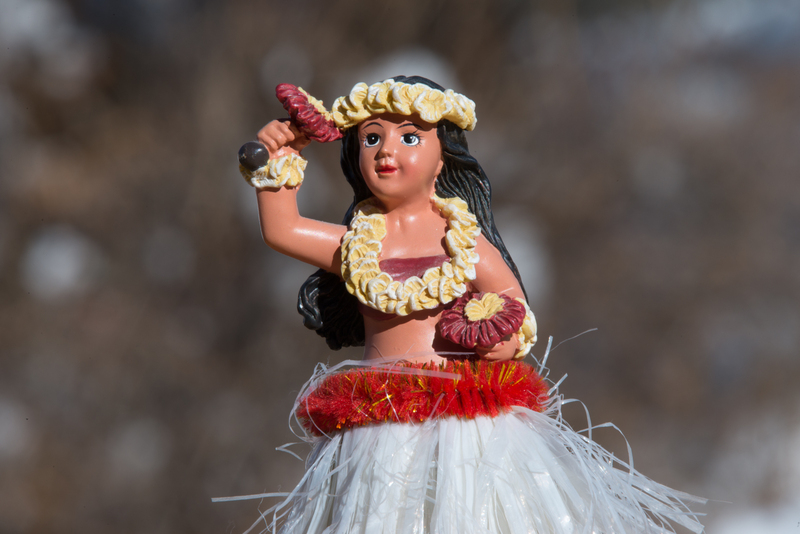 However, a comparison of the relative size of the hula dancer toy with the details of the out of focus background reveals that the DX format Nikon D90 captures the same depth of field as the FX format Nikon D610. This flies in the face of the common (but mistaken) belief that crop sensors significantly alter depth of field. To understand the performance of each camera as illustrated in the above photos, one need only understand that photographic depth of field is largely determined by two factors: distance to subject and lens aperture. Each lens was kept at a constant position and distance from the subject for the photos made with the two camera bodies. By keeping focal length and f-stop constant in each photographic set, lens aperture was kept constant. As you review the above list, notice the constant f-stop results in increasing lens aperture as focal length increases. By keeping subject distance constant and increasing the physical aperture of the lens, depth of field becomes more shallow. By definition, the reverse is also true. With subject distance kept constant, decreasing lens aperture would result in a deeper or increased depth of field. And as illustrated by the above comparisons, keeping both subject distance and lens aperture constant produces constant depth of field. This holds true regardless of sensor size. How is it, then, that so many photographers have come to accept the false assertion that crop sensor cameras make images having increased depth of field? The key to understanding this is the concept of equivalence. In simplest terms, equivalence describes two images made with different cameras and lens settings but having identical qualities. There are many factors that go into describing truly equivalent images. 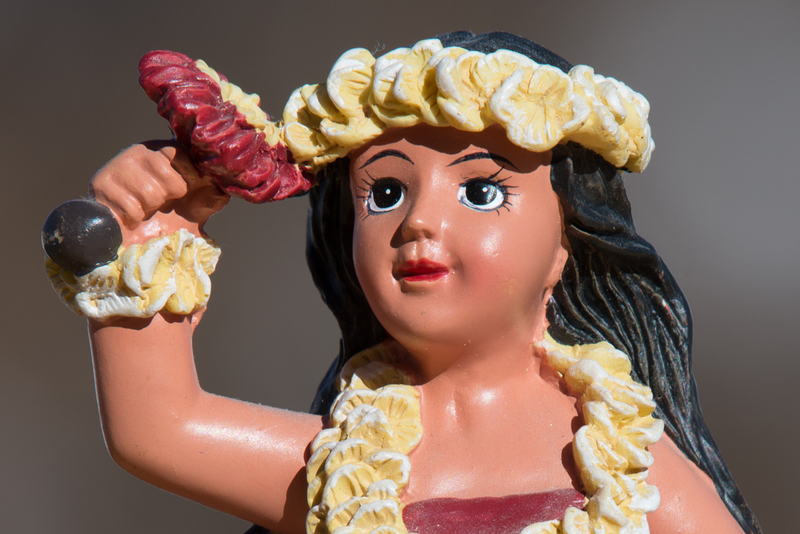 For the purposes of this discussion, we’ll focus on angle of the view and depth of field. Let’s consider the above image set made with the Tamron 70-200mm f/2.8 VC. Due to its smaller sensor, a photograph made with the D90 captures a more narrow angle of view in comparison with an image made with the D610 at the same focal length. To capture an equivalent angle of view at the same distance from the subject, the D610 needs to use a greater focal length. At that increased focal length, the FX format camera will capture an angle of view equivalent to that recorded by the D90. If both lenses are used at the same f-stop of f/2.8, their respective apertures will be about 46mm for the 130mm, f/2.8 lens on the D90 and 71mm for the 200mm, f/2.8 lens on the D610. Bear in mind, both cameras are at the same distance from the subject. Due to the larger physical aperture of the 200mm focal length lens, it records a shallower depth of field. 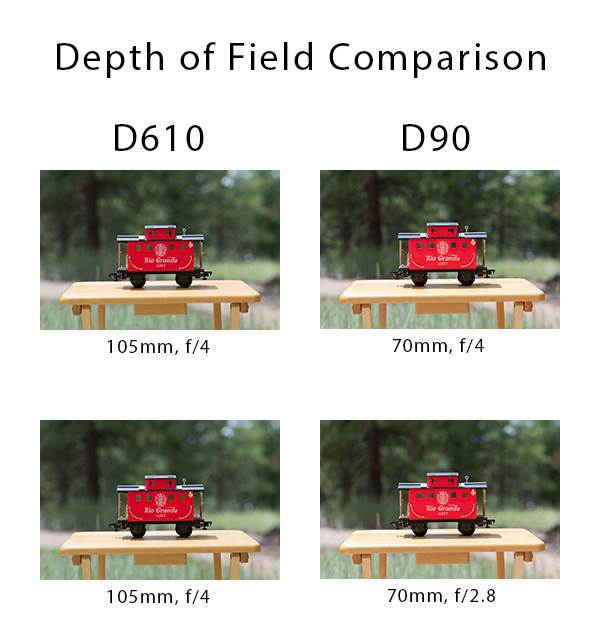 To match the depth of field of the D90, the D610 is closed down from f/2.8 to f/4. This closes the aperture from 71mm to 50mm, which roughly matches the depth of field recorded by the D90 and its 46mm aperture. 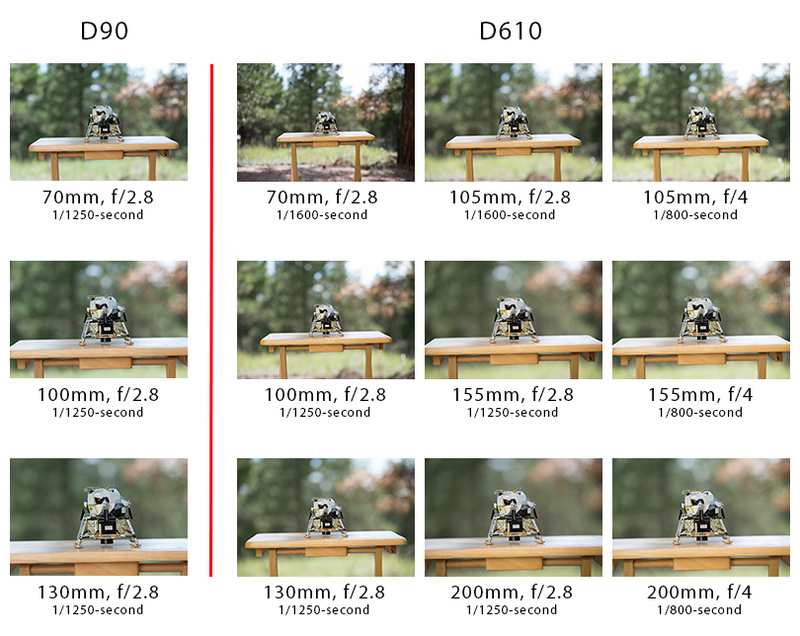 Also, compare the quality of the out of focus background detail in the photos made with the DX format D90 (left most column) with the same detail in the second set of photos made with the FX format D610 (middle of three columns). Pay particular attention to the grouping of four bokeh balls to the left of the lunar lander model. In the D90 photos and in the equivalent D610 photos (right most column), that grouping is well defined with clear separation. In the middle column of D610 photos, that grouping is more diffuse, less well defined and not as clearly separated from the background. This is what we would expect, considering that all the photos in that collection were made with the cameras and lenses at the same distance from the subject. The first and third column sets of images made with the D610 were made with the same lens aperture as the D90. 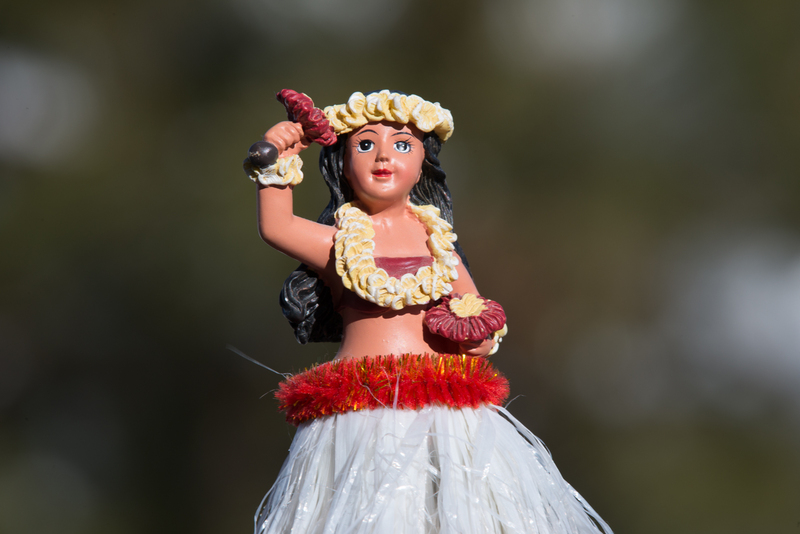 The third column set of D610 images were made at an equivalent focal length to the D90 images. 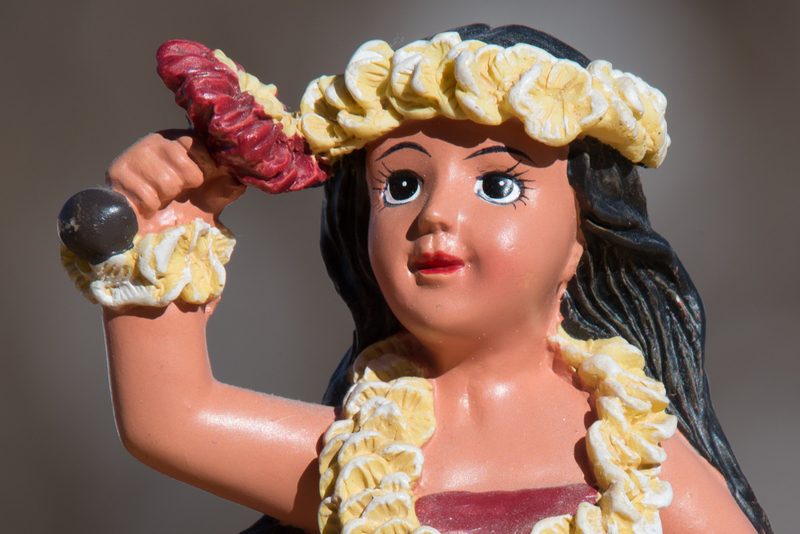 Both the angle of view and depth of field are equivalent. 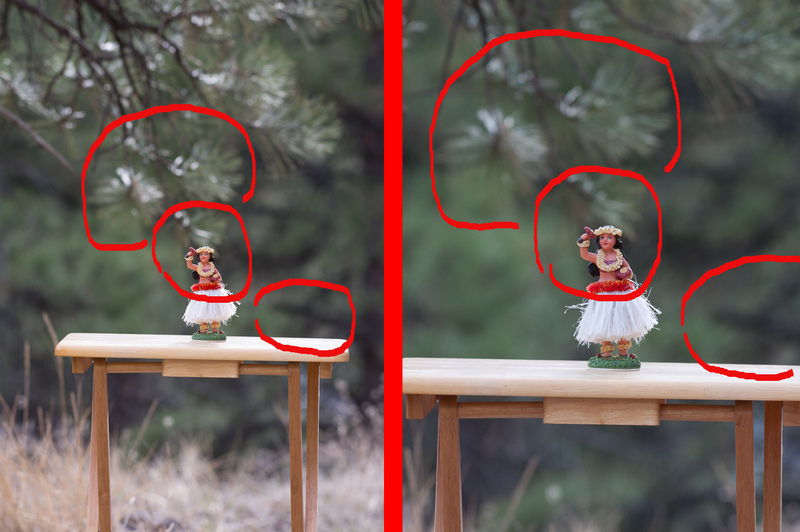 The first set (left column) of D610 images, while showing a wider angle of view, have equivalent depth of field as the D90 images. 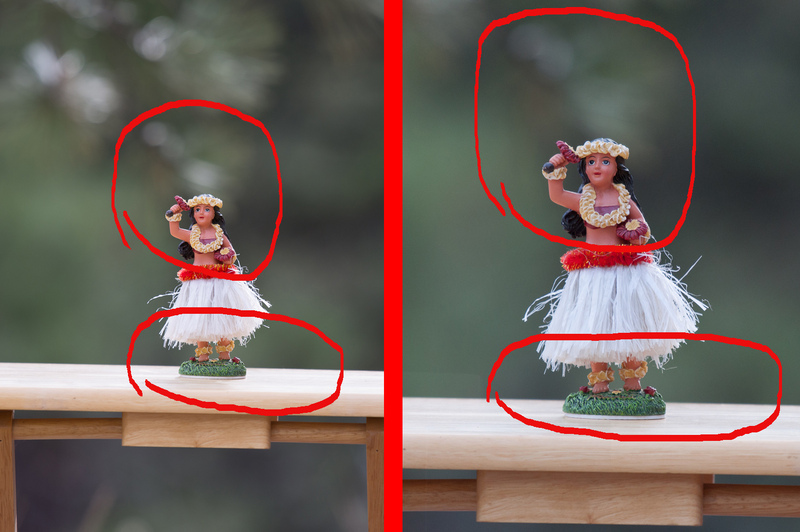 Again, this is exactly what one would expect given that the D90, and first and third set of D610 images were made at the same aperture, while the second set (middle column) of D610 photos were made at a larger aperture. Another approach to producing equivalent depths of field, would have been to increase the lens aperture on the D90. The D90 would need a 130mm f/1.8 lens, which would have a 72mm aperture. That’s very nearly identical to the 71mm aperture of the 200mm, f/2.8 lens on the D610. If equivalence is your objective, applying the crop factor to the f-stop allows you to calculate the aperture needed to make a photograph having an equivalent depth of field at a focal length delivering an equivalent angle of view. This adjustment can go either way. We can use a larger f-stop (multiply by the crop factor) to close down the aperture of the lens on the larger sensor camera or we can use a smaller f-stop (divide by the crop factor) to open the aperture of the lens on the smaller sensor camera. Either approach will produce equivalent apertures on the two cameras, which allows them to capture matching depths of field. 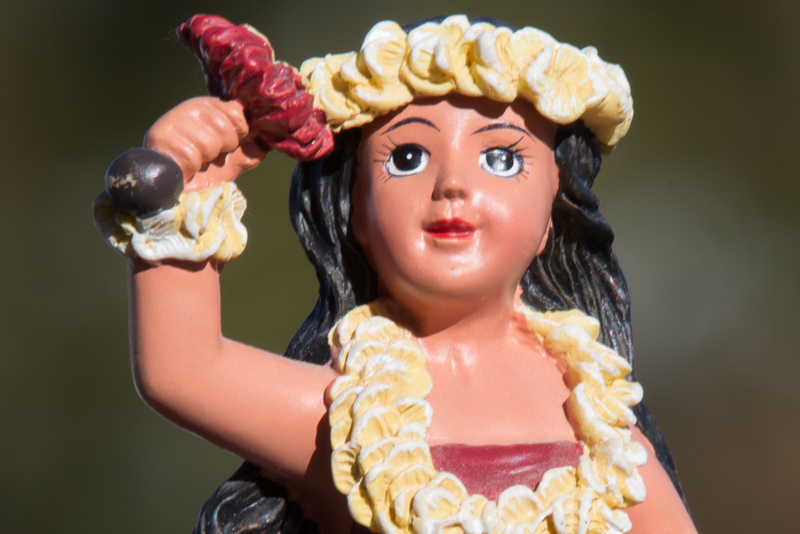 This is what has led so many photographers to mistakenly conclude that crop sensors significantly alter depth of field. What folks overlook is that the crop factor is applied to allow the lenses on the cameras to operate at the same physical aperture. Again, the key to understanding depth of field is recognizing that distance to subject and lens aperture are the critical factors. 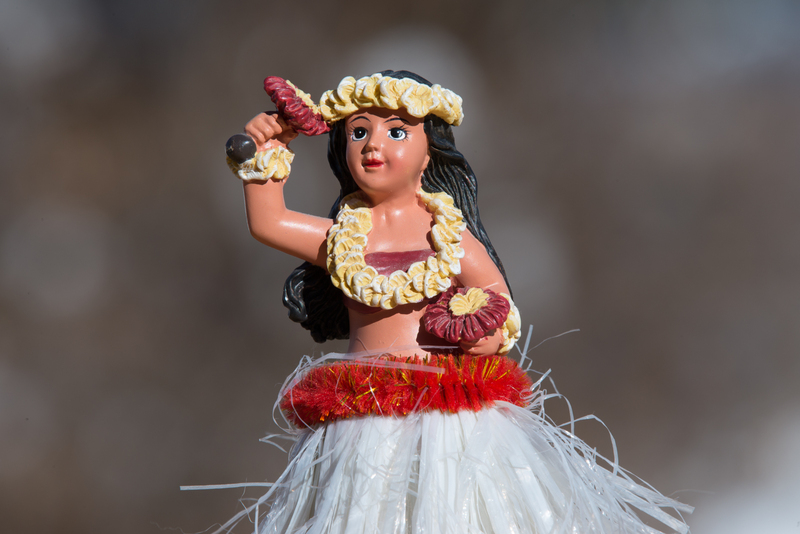 If you keep subject distance constant, keeping lens aperture constant will deliver equivalent depth of field. This holds true even if the lenses are used at focal length delivering non-equivalent angles of view. 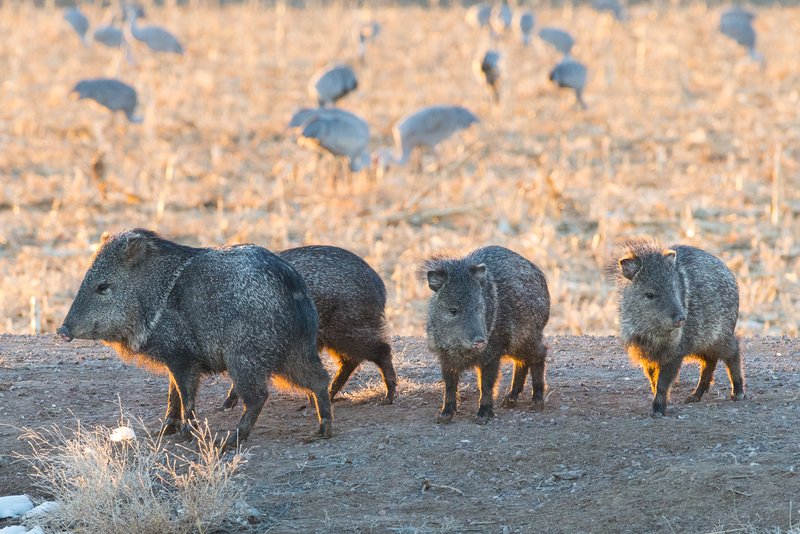 Wildlife photographers often choose to shoot with crop sensor cameras to effectively bring the animals closer. They want the narrower angle of view delivered by the crop sensor. Shooting at 500mm f/4 with a DX camera will not only produce a larger image of the subject (in comparison with a photograph made using the same lens at the same distance on an FX camera), the DX camera will also record the same shallow depth of field and beautiful, buttery bokeh. That’s a huge advantage and a big reason why crop sensor cameras are so popular with sports and wildlife photographers. Of course, the smaller sensor also captures less total light with each exposure and this has implications for image noise. But that’s another blog entry. In the meantime, armed with this new information and understanding of the role lens aperture plays in depth of field, let’s get out and shoot. 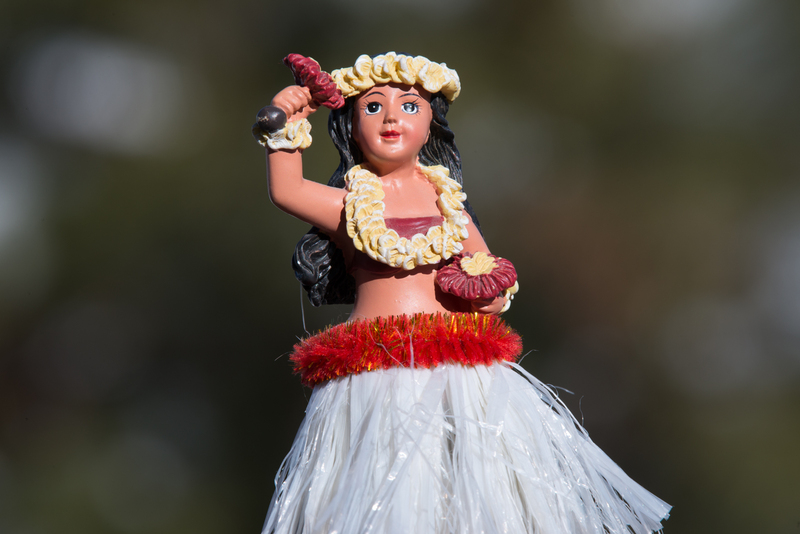 This entry was posted in DSLR, Lenses, Sports Photography, Techniques, Wildlife Photography and tagged 200-500, 200-500mm f/5.6, 24-70, 24-70mm f/2.8 vc, 70-200, 70-200mm f/2.8 vc, angle of view, aperture, bill ferris, bill ferris photography, bill ferris photography billferris.photoshelter.com, billferris.photo, camera, crop factor, crop sensor, d610, d90, depth of field, distance, distance to subject, dslr, dx, equivalance, f/5.6, f/9, full frame, FX, lens, nikkor, nikon, photo, photography, subject, tamron on 2016/03/11 by wdferris1@gmail.com. Teleconverters have a long and complex history in photography. In 1833 – six years before Louis Daguerre invented the daguerreotype process that launched a worldwide fascination with a new artistic medium, photography – Peter Barlow invented a negative lens that, when fitted to a telescopic eyepiece, extended the effective focal length of the telescope in which Mr. Barlow’s lens was used. In so doing, the magnification of the lens and the image scale of the subject were also increased. Known simply as the Barlow lens, this optical accessory is widely used by amateur astronomers. Commonly available in 2x and 3x versions, the modern Barlow is especially popular with lunar and planetary observers. Nearly sixty years later in 1891, Thomas Dallmeyer and Adophe Miethe simultaneously developed nearly identical optical designs for photographic telephoto lenses. Both designs featured a front achromat doublet lens system and a rear achromat triplet grouping. The rear lens grouping acted much as Barlow’s negative lens, increasing the effective focal length of the front imaging elements. Dallmeyer and Miethe had independently invented the first photographic teleconverters. Today’s modern teleconverters are also quite popular though not without their critics. 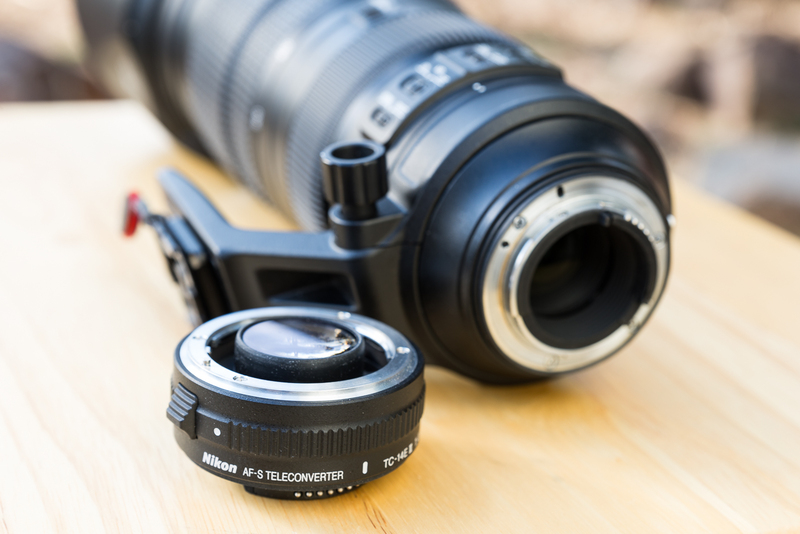 No optical lens system is perfect and the teleconverter is certainly no exception. In addition to magnifying the subject of a photograph, a teleconverter also magnifies optical aberrations, making them more readily apparent. Commonly found in 1.4x, 1.7x and 2.0x versions, teleconverters typically magnify by as little as 40% (1.4x) and as much as 200% (2x). The biggest cost of this increased magnification is a loss of image brightness. By increasing the effective focal length of the lens while keeping the lens’ physical aperture constant, the maximum focal ratio of the lens increases by an amount proportional to the increase in effective focal length. For example, a 1.4x teleconverter increases focal length and focal ratio by 40%. A 200mm f/4 lens becomes a 280mm, f/5.6 lens. The teleconverter results in a loss of one stop of light. This increase in focal ratio has a couple of potentially significant drawbacks. Compared to an f/4 lens, an f/5.6 lens will require an exposure twice as long to render a properly exposed image. Another option would be to increase the ISO (in-camera exposure brightening) or increase the brightness of the exposure during post-processing. Either approach will introduce some additional noise into the final image. Another potential issue that results from an increase in focal ratio, is that of compromised autofocus performance. The brighter the image falling on the sensor, the faster and more accurate the camera’s autofocus system tends to be. As the f-stop used to make an image increases and image brightness on the sensor decreases, the camera eventually will not have enough light for reliable autofocus performance. The main price to be paid for the extended reach achieved with a TC is an increase of the lens’s maximum f-stop. In the case of the 200-500mm f/5.6E, the focal ratio increases from f/5.6 to f/8. 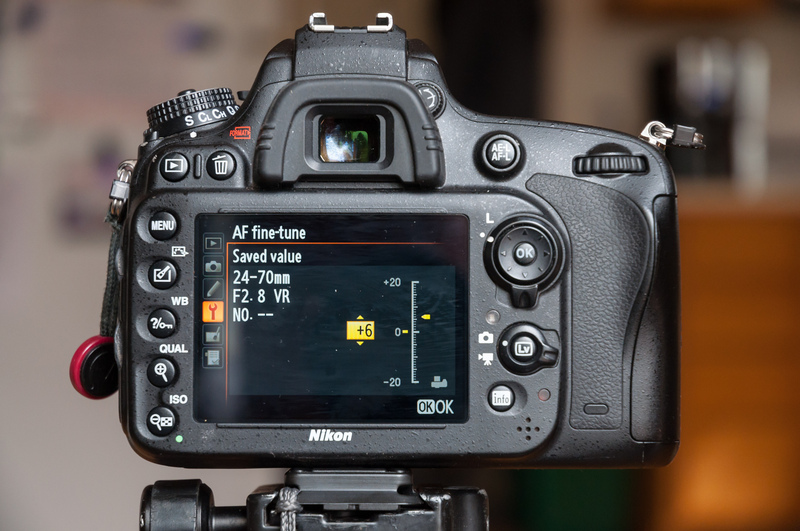 At f/8, the zoom would be operating at the very threshold of my Nikon D610’s ability to autofocus. This raised two issues of concern: would the lens be sharp at 700mm and would the f/8 maximum focal ratio allow for adequate autofocus performance? 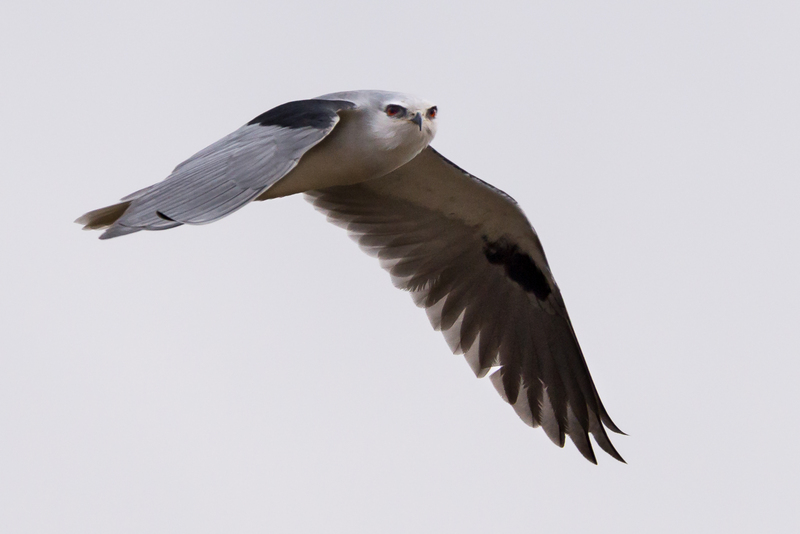 One of the biggest technical challenges of bird and wildlife photography is capturing birds in flight. It is this aspect that makes bird photography so appealing to me, the challenge of mastering my equipment and expanding my knowledge of the animals to make good photographs. Bird photography also gives me an excuse to get out in nature and to be near these magnificent creatures. When the TC-14E III arrived, I couldn’t wait to run it through its paces by photographing the eagles, hawks and other birds found during winter in northern Arizona. 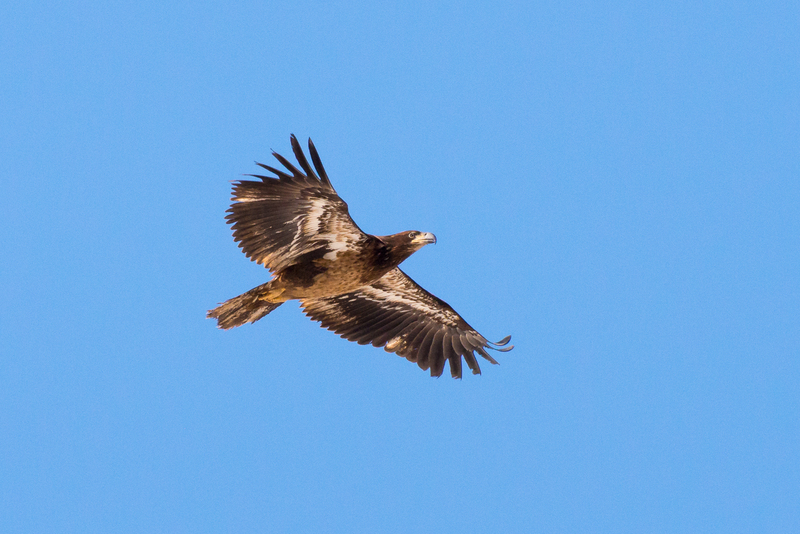 The above photograph of a juvenile bald eagle in flight illustrates the challenges I’ve been working to overcome. As you can see, the photo was made on a bright, sunny day. I used a shutter speed of 1/2000-second to freeze the action. The 200-500mm is at full zoom, which produces an effective focal length of 700mm with the 1.4x teleconverter attached. The maximum f-stop is f/8 but I chose to work at f/11 to produce an image with greater sharpness. In the photo’s caption, you’ll notice an ISO of 2500 for this exposure. That’s very high for a bright, sunny day. Now, if the above were a full 6,000 by 4,000 pixel image, the level of noise at that ISO would be quite acceptable. 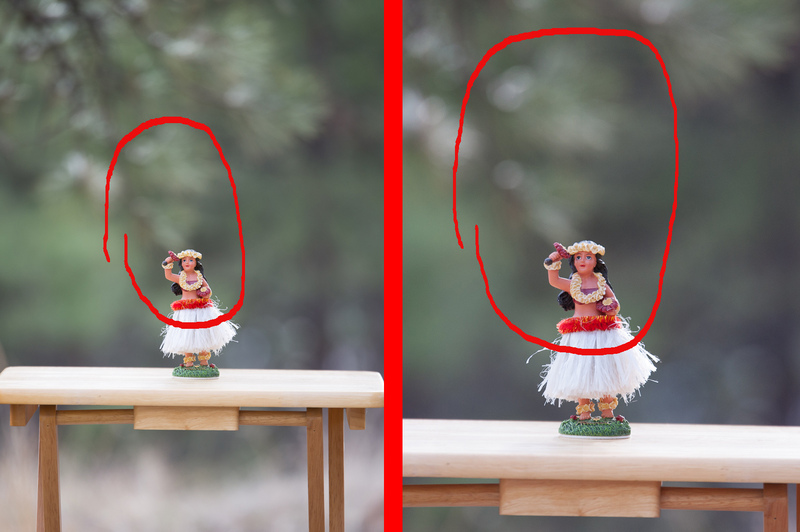 However, even at 700mm focal length, the raptor only covers about 1/5 the surface area of the D610’s sensor. The above image represents roughly a 2500 by 1700 pixel crop, which makes the noise more noticeable. In fact, I would judge the level of noise to be at the very threshold of what I consider, acceptable. The above photo of Canada geese flying through northern Arizona’s winter sky is a roughly 1500 by 1500 square aspect crop. Notice the shutter speed is the same 1/2000-second exposure as used to make the previous image of a bird in flight. Also, please note the f-stop and ISO. The f-stop is f/9 or 2/3-stop brighter than the first image. As a result, the ISO is much lower. This was another bright, sunny day in northern Arizona so, lower the f-stop (increasing the aperture) allowed me to make an image with much less post-exposure brightening. At ISO 720, I was able to do an even more significant crop but without the noise penalty of the first image. 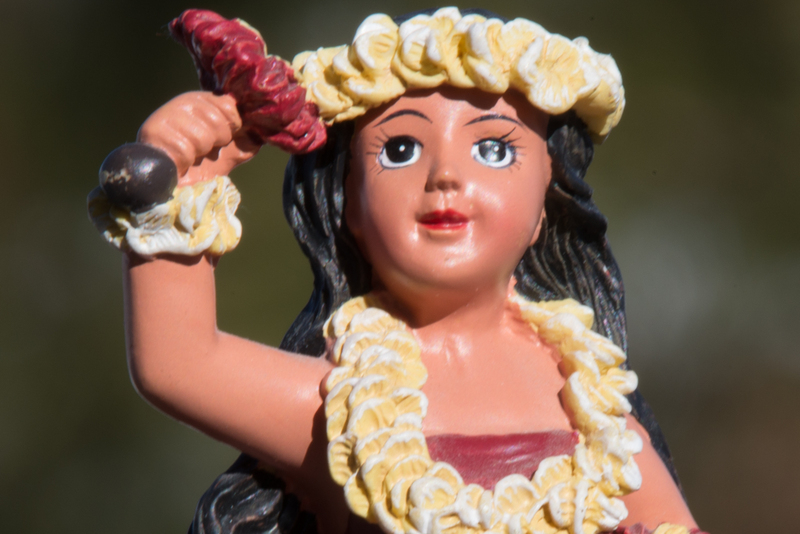 ISO, is the central issue when using a teleconverter with a moderately fast lens. Pro telephoto lenses offer maximum f-stops in the f/2.8 to f/4 range. The large apertures of these long lenses collect and deliver a lot of light to the sensor. As a result, even with a 1.4x TC in the mix, they still operate at f/4 or f/5.6, delivering enough light to the sensor to allow a camera’s AF system to be snappy and accurate. Using the TC-14E III with a lens such as the 200-500mm f/5.6E, a modestly slow zoom, immediately puts you right at the brink of acceptable performance. The 200-500’s maximum f-stop (with the TC) is f/8. At f/8, the optical system captures images with noticeable softness and chromatic aberration. Closing down the aperture just by 1/3-stop to f/9 largely compensates for these aberrations and allows the lens to deliver crisp, true color images to the sensor. At f/9, the lens is operating outside Nikon’s official boundary for full AF performance. At f/9, you’ll no longer be able to work in AF-C, 3D mode. That option isn’t even available in the D610’s menu at f/9. However, I’ve been able to get good AF performance in AF-C, 9-point mode, my preferred autofocus setting for dynamic bird and wildlife situations. The above photo illustrates the price one pays when losing focus even for a moment while doing photography with an f/5.6 (or slower) telephoto and a teleconverter. Again, this photo was made on a bright and sunny afternoon. I shot with the 200-500 and 1.4x TC combo wide open at f/8. Why? It was late in the afternoon. The sun was about an hour from setting, low on the western horizon and not quite as bright as during a midday exposure. Notice the shutter speed of 1/2000-second. That’s for a photo of a perched bird. OK, the bluebirds were flitting from plant-to-plant and not spending more than a few seconds on any one perch. 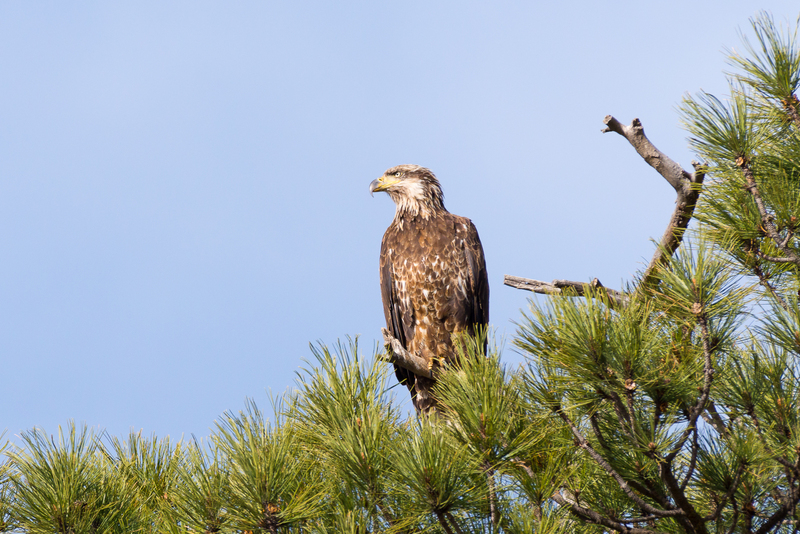 However, when they’re perched, the birds aren’t moving…at least, not nearly as much as when in flight. By shooting at 1/2000-second in late day light, the ISO was jacked up to 1600. I probably could have used a shutter speed of 1/800-to-1/1000-second, which would have cut the ISO to 800 or less. 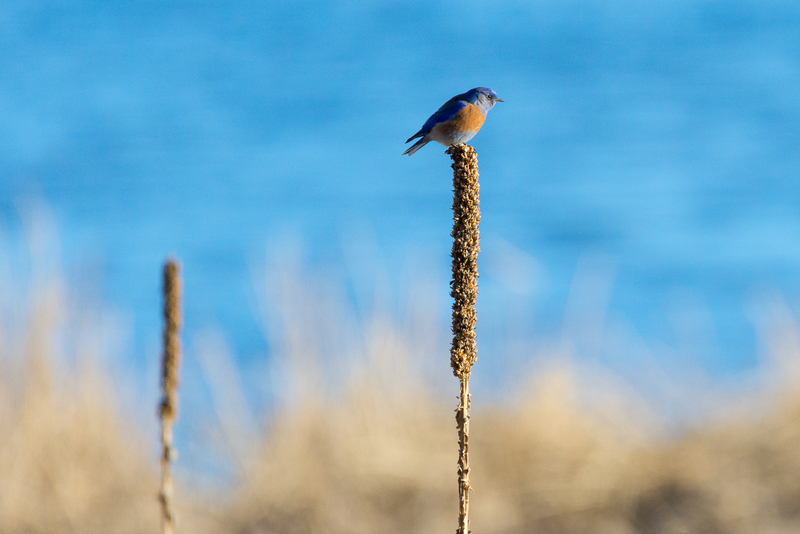 What saved this exposure was the fact that I’d noticed the western bluebirds flitting about from stalk to stalk and had pre-focused on this stalk, ahead of time. It’s still a cropped final image but at approximately 3350 by 2240 pixels, there’s enough real estate on the camera sensor to mitigate the noise. If this was shot with a 500mm f/4 telephoto and the Nikon 1.4x TC, I could have shot at f/5.6 and kept every other setting the same with the camera selecting and ISO of 800 or lower. Being a professional quality optic, the 500mm f/4 would probably be very sharp even wide open with a TC. 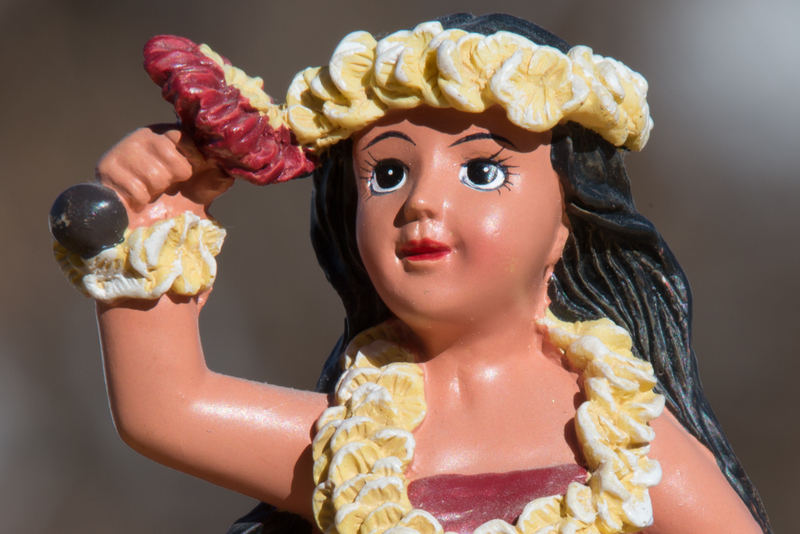 With a consumer, telephoto zoom such as the 200-500, the margin for error is much more narrow. You’ve got to pay attention to the details and look for every opportunity to balance that f-stop/shutter speed/ISO triangle in your favor. Here’s an image that’s a product of a collection of lessons learned during my first few weeks of ownership of the TC-14E III 1.4x teleconverter. It’s a photo that was made in good light on a clear day. 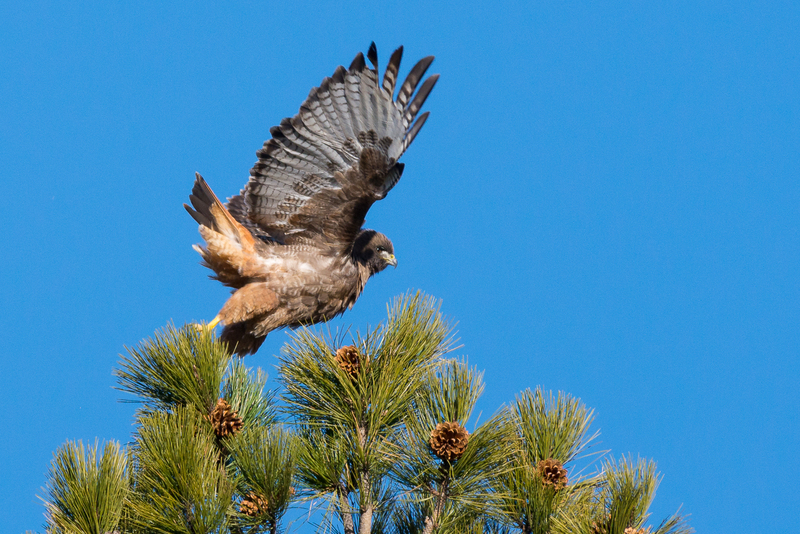 The red-tailed hawk was perched atop a Ponderosa pine scanning the nearby shallow water lake. Anticipating the bird would launch within a few minutes (at most) of my arrival, I had selected a shutter speed of 1/1600-second…fast enough to mostly freeze the action of wings flapping but slow enough to catch a bit of motion and convey a hint of the dynamic action. I chose an f-stop of f/9 to noticeably sharpen the resulting image while still putting a bright image on sensor. The combination of these choices resulted in an exposure where the D610 chose an ISO of 720. In my experience, keeping ISO at or below 1000 is essential to producing noise-free images in exposures that will likely be significantly cropped. The TC-14E III is sharp. Comparing exposures made with the bare 200-500 and exposures made with the combo of the 200-500 and TC at equivalent focal lengths, any differences in image quality are subtle, at most, and only discernible at the pixel level. When shooting at 700mm, I prefer to stop down the combo to f/9. Even the 1/3-stop closure is enough to noticeably improve image quality. Beyond that, IQ does improve up to about f/11. However, the gain is so marginal as to be not worth (in my opinion) the associated loss of quality that comes from using a higher ISO or (for BIF) a slower shutter speed. For best image quality when photographing BIF (a scenario where significant cropping of the resulting image is likely), I target a shutter speed of 1/2000-second but will slow the shutter shutter speed to 1/1000 in low light and will slow the shutter speed to 1/500 for perched birds. I need to continue experimenting with shutter speed. At 1/1000-to-1/1600, the wing motion blur helps convey the dynamic action of flight. It’s not unlike prop blur in photographs of piston engine planes in flight. The prop blur conveys the power of the plane. Wing blur with a sharply focused face communicates the dynamic nature of the bird. I’ll leave you with one last sample image. The 200-500/teleconverter combo is great for perched birds. In good light, I can close the aperture to ensure tack sharp detail, make exposures at relatively slow shutter speeds (under 1/1000-second), and still keep ISO under 1000. These settings deliver excellent detail in a properly focused image. With all that potential awaiting you, there’s no excuse. Get out and shoot. 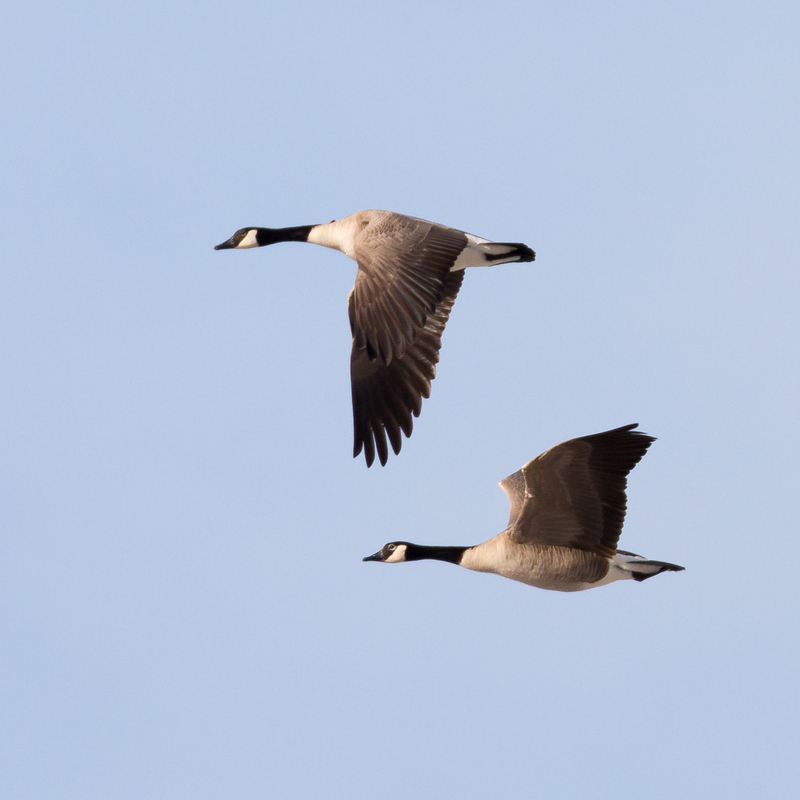 This entry was posted in DSLR, Lenses, Review, Techniques, Wildlife Photography and tagged 1.4x, 200-500mm, bald eagle, bif, bill ferris, billferris.photoshelter.com, bird, bird in flight, birds in flight, canada goose, d610, f-stop, f/5.6e, iso, nikon, photography, red-tailed hawk, shutter speed, tc, tc-14e iii, teleconverter on 2016/03/06 by wdferris1@gmail.com. When Nikon released the AF-S Nikkor 200-500mm f/5.6E ED VR telephoto zoom lens, one of the features which gained immediate attention was vibration reduction. I know, I was immediately impressed with both the immediacy and the effectiveness of this technology. Controls for vibration reduction (VR) are located, as shown in the above photo, on the left side of the lens. VR is activated with an on/off switch. There are two mode options, normal and sport. According to Nikon’s literature, normal mode is recommended when photographing stationary subjects and sport mode is recommended when photographing moving subjects, especially subjects moving erratically or quickly. In either normal or sport mode, the lens compensates only for vertical shake and does not compensate for panning motion. VR can be used when shooting from a tripod or monopod, although the literature Nikon provides with the lens does caution against using VR in certain scenarios involving tripods. Interestingly, Nikon offers no real explanation of what tripod types or shooting conditions may produce better results with VR off. In my experience shooting at 500mm (by far, my most used focal length with this lens) with vibration reduction engaged in normal mode, pushing the AE-L/AF-L button (assigned as AF-On for my Nikon D610) immediately stabilizes the image in the optical viewfinder. The same is true when the shutter release button is half-depressed. Used in sport mode, there is no loss of immediacy in the stabilization. The quality of the viewfinder image, however, is a bit more fluid. This is a reflection of the algorithms controlling VR in sport mode, which allow greater latitude in a photographer’s vertical motion. I’ve not been able to discern a difference in image quality between normal and sport mode. Nor have I noticed any image degradation when VR is engaged a shutter speeds of 1/1000-second and faster. I’ll often leave VR on, regardless of shutter speed, just to enjoy the benefits of a more stable viewfinder image. This makes it easier to track birds, athletes and other fast, sometimes erratic moving subjects. By far, the most discussed feature of the 200-500’s VR reduction, has been Nikon’s claim that it delivers up to 4.5 stops of stabilization. What does that mean? There is a longstanding truism in photography that, to produce an acceptably sharp image when shooting handheld, a photographer should use a shutter speed no slower than the inverse of the focal length. 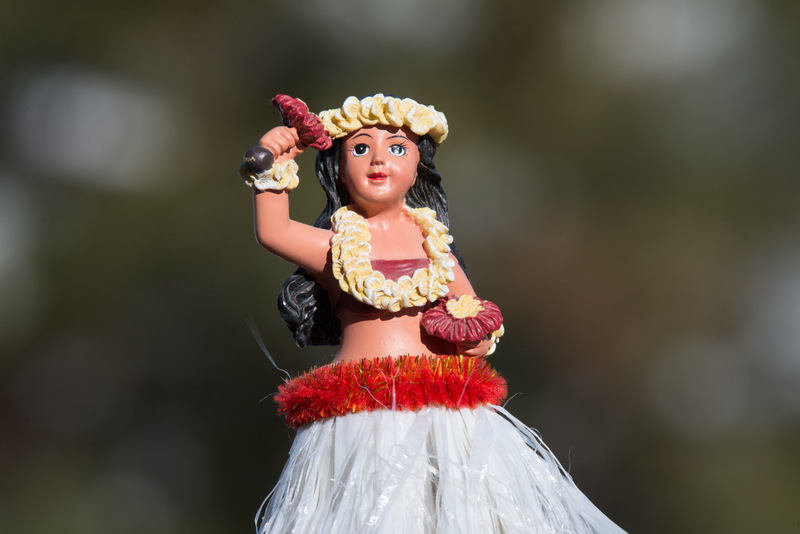 For example, if shooting handheld with a 50mm normal lens, use a shutter speed no slower than 1/50-second. If shooting handheld with a 200mm telephoto, your shutter speed should be 1/200-second or faster. Doing photography with the 200-500mm f/5.6E at full extension, your shutter speed should be 1/500-second or faster. The reasoning behind this guideline is that a fast enough shutter speed will effectively negate the inherent unsteadiness of handholding a camera. Experienced photographers who employ good technique are often able to exceed the “inverse of focal length” standard. In recent years, lens and in-body stabilization technology has evolved, considerably, making it easier for pros and novice photographers alike to make clear, detailed images at slow shutter speeds. I should note, that vibration reduction technology compensates for the inherent shakiness of the photographer but does nothing to freeze or hold motionless the subject. If your subject is moving, that motion will be be captured when you press the shutter release. Engaging VR to steady the image with the intent of using a slower (longer) shutter speed will enhance the subject’s motion. This intentional dragging of the shutter can produce some cool images. It can also be the source of frustration, if a photographer expected the VR would freeze the action happening within the frame. If we assume a photographer using a 500mm lens will be able to make a sharply detailed handheld photograph using an exposure of 1/500-second, a 1-stop improvement would be a halving of that shutter speed. In other words, 1-stop of VR improvement would allow a photographer to make sharp images at 1/250-second. Another halving of shutter speed (1/125-second) translates at a 2-stop VR advantage. If I’m able to make good, detailed handheld photos at 1/60-second, that would demonstrate a 3-stop VR enhancement. 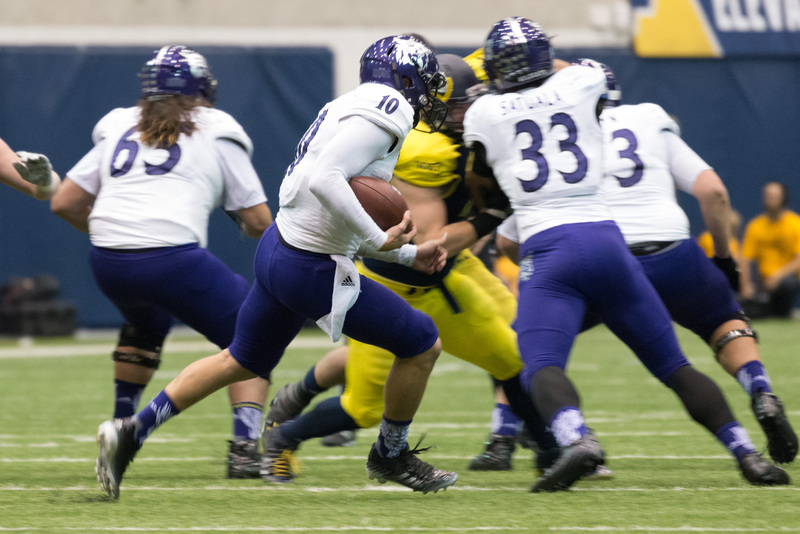 Shooting at 500mm, 1/30-second and getting acceptably sharp results translates to a 4-stop gain. Anything longer than 1/30-second delves into that area of approximately 4.5 stops of vibration reduction Nikon promotes for this lens. 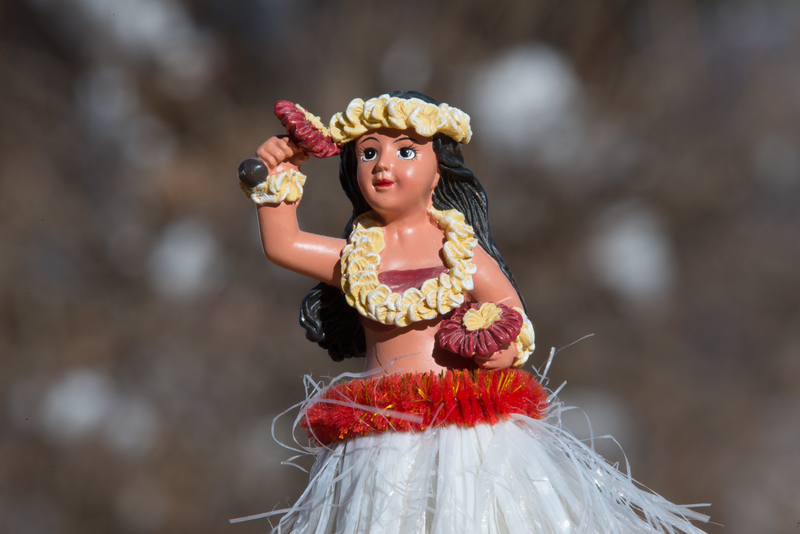 To demonstrate the effectiveness of Nikon’s vibration reduction technology, I set up a home test using my favorite model, a hula dancer toy. 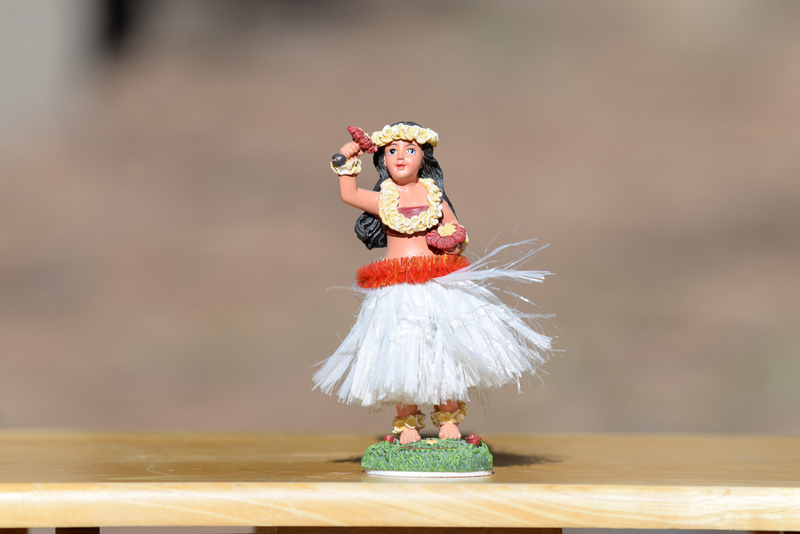 The dancer was set up on a folding tray table outside on a sunny day. Using the 200-500 on my D610, I took a several series of exposures. For all exposures, the focal length was held constant at 500mm. Sensitivity varied between ISO 125 and ISO 160 for all exposures. I used aperture (f-stop) to control the image brightness on the sensor. This, in turn, required longer exposures (slower shutter speeds) to create properly exposed images as each shot sequence progressed. I shot first with VR on in sport mode, then with VR off and then with VR on in normal mode. For each of these three sequences, I started with the lens at 500mm, f/5.6 making three exposures at 1/1000-second. I then made changes to the f-stop to close the aperture in 1-stop increments, making three exposures at each setting: f/8, f/11, f/16, f/22 and f/32. Shutter speeds were adjusted to compensate for the smaller apertures. 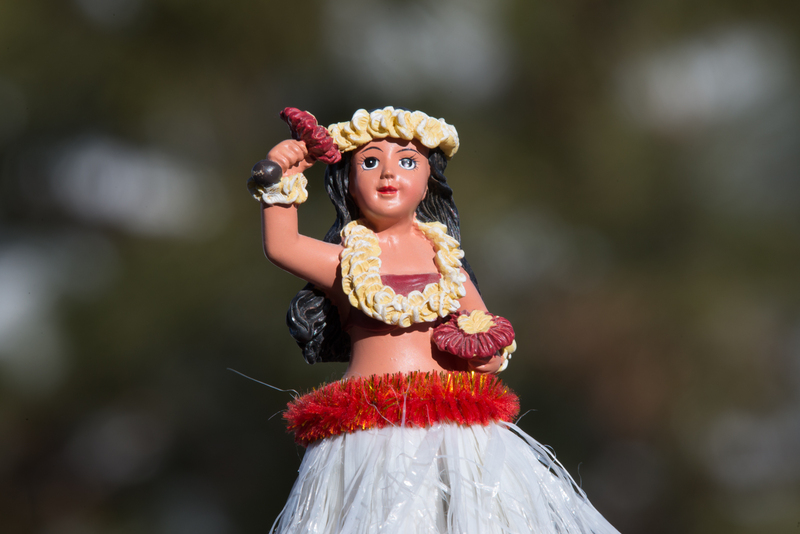 At f/8, I shot at 1/500-second; 1/250-second at f/11; 1/125-second at f/16; 1/60-second at f/22 and 1/30-second at f/32. I shot first with VR off, then with VR on in sport mode, then with VR on in normal mode. Here, are the resulting images. I selected the best exposure from each three-exposure set for display and am presenting full frame views followed by 100% crops. I’ll begin each sequence with the 1/250-second exposure as that is where the potential benefits of vibration reduction kick in. On a philosophical note, I will refrain from coloring your evaluation with my personal conclusions. Judge for yourself how good the VR performance of the AF-S Nikkor 200-500mm f/5.6E ED VR lens is. Well, there you have it. What are your thoughts? As I said, I’m not going to color your perceptions by offering detailed comments. I think images and VR performance speak for themselves. What I will offer is this, I was pleasantly surprised at the image quality that can be achieved when shooting handheld without VR from a seated position. I rested my elbows on my thighs to enhance the stability of my handhold and I think it paid off. The slower exposures are good enough for certain uses, such as low resolution display on a website. Let me know what you think. Share your comments, below. Then, get out and shoot. This entry was posted in DSLR, Lenses, Review, Techniques and tagged 200-500, 200-500mm, bill ferris, bill ferris photography, bill ferris photography billferris.photoshelter.com, billferris.photoshelter.com, billferrisphoto.com, dslr, f/5.6, f/5.6e, handheld, lens, nikkor, nikon, performance, photo, photography, review, service, steady, vibration reduction, vr on 2016/01/17 by wdferris1@gmail.com. I can clearly recall the exact moment when I realized there was a problem with my Nikon 200-500mm, f/5.6E telephoto zoom lens. It was on the afternoon of Wednesday, November 11, 2015. I had the day off from work and was setting up in the backyard to make some test photos demonstrating the effectiveness of the new lens’s vibration reduction (VR) feature. It was the above photo that caught my eye and started me down a challenging, sometimes frustrating road that would take nearly six weeks to complete. I’m some respects, I’m still on that road. The above image caught my attention because it is so obviously overexposed. It was also totally unexpected. 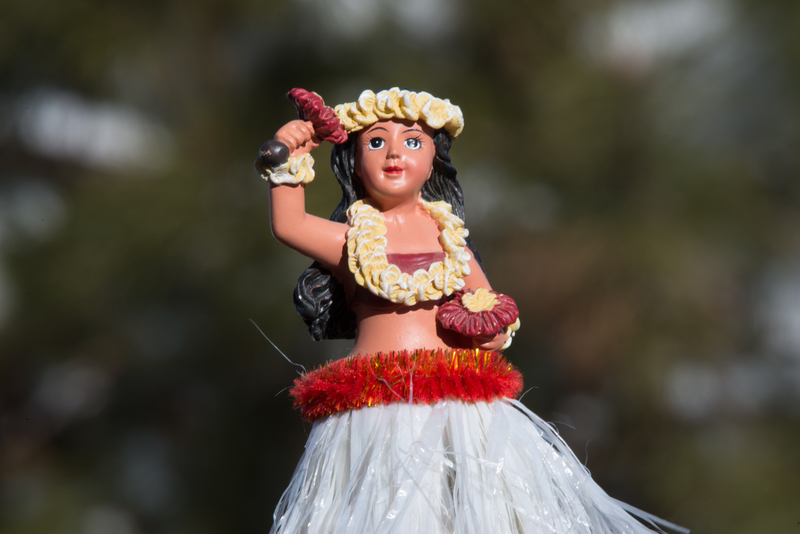 I had been using a hula dancer toy as a photographic subject to test the vibration VR of the 200-500mm lens. Reviewing the rest of the images in the sequence, the image shot at f/5.6 appeared to be properly exposed but the images made at f/8 and higher were overexposed. It also appeared that the degree of overexposure increased in proportion to the increase in f-stop setting used. The above image was made with a setting of f/16 and is about 2 stops overexposed. In a nutshell, what I had discovered was that my Nikon D610 camera body was not able to control the electromagnetic diaphragm of the 200-500mm lens. The diaphragm determines the aperture of the lens, which controls the amount of light hitting the sensor. Lens aperture (f-stop) along with ISO and shutter speed form what is commonly referred to as the exposure triangle. A compatible trio of settings produces a properly-exposed image. If one of the settings is off, the resulting image will look either over- or underexposed. That same day, I called Nikon USA’s service and support line and spoke with a call center agent. I described the problem and, ultimately, was advised to send in the lens for evaluation. Just a month earlier in October 2015, I had shipped the lens to Nikon for a firmware upgrade. The shipping and upgrade were covered under warranty for that service center visit. The UPS charge for this shipment would come out of my pocket. The upgrade was done and the lens shipped back at Nikon’s expense, arriving via UPS on November 23. It didn’t take more than a couple of minutes to confirm that the firmware upgrade had done nothing to correct the problem. To more fully document this issue, I made a series of exposures of my favorite test subject to demonstrate the increasing degree of overexposure at larger f-stop settings. 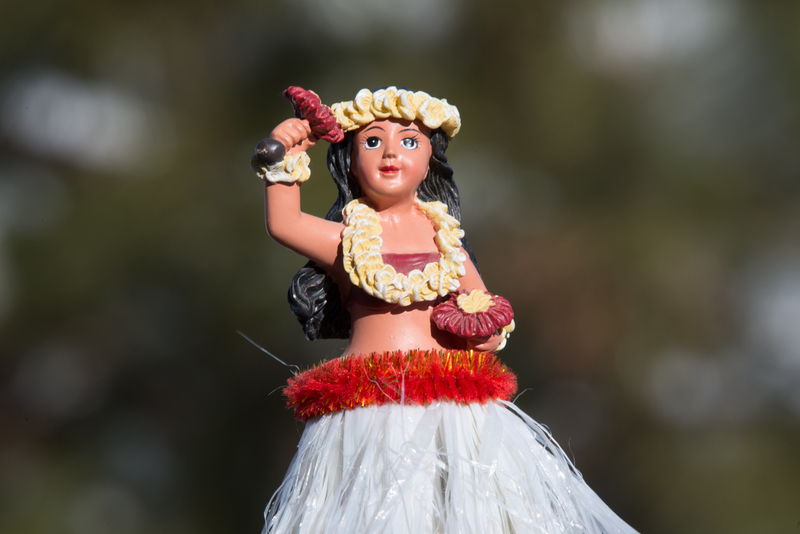 Below, are several of the images I uploaded to the Nikon USA service center site for a technician to review. Tuesday, November 24, I had another phone conversation with a call center agent. I again described the problem and explained that it appeared my Nikon D610 camera was unable to control the lens’s electromagnetic diaphragm. I also shared that I’d made test exposures with four other F-mount lenses: the Nikkor 16-35mm f/4, Tamron 24-70mm f/2.8 VC, Tamron 70-200mm f/2.8 VC and Nikkor 70-300mm f/4.5-5.6. There was no overexposure problem with these lenses and it appeared the problem was isolated just to the 200-500mm f/5.6E lens. The day before Thanksgiving, November 25, I received an email from a Nikon technician who’d reviewed the above images. In his message, the technician asked that I ship both the D610 camera and the 200-500mm lens for evaluation and possible service. A UPS shipping label was attached. As reluctant as I was to be without my primary camera and the new lens, I wanted to get the problem resolved as quickly as possible. So, I boxed up the D610 and lens, drove to the nearest UPS shipping center and sent my babies off to LA for some TLC. December was a long month. I had the privilege of serving on a jury for a criminal trial the first week of the month. Several major work projects were due for completion over the next two weeks and I would be traveling with family for the holidays, beginning December 22. Needless to say, I was anxious to have the camera and lens back, both in good working order, in time for the family trip to California. The month was further disrupted when I received news that a close high school friend had passed away. Travel to the Midwest for the funeral took out of town for several days. I arrived home the afternoon of Sunday, December 20 to find two packages from Nikon sitting on the dining room table. One, was my D610 camera. The other, was my 200-500mm lens. After unpacking my suitcase and getting settled, I fetched a cutting tool from our kitchen utility drawer and opened the packages. A few minutes later, the 200-500 was firmly affixed to the D610 and ready to make images. Checked focus and VR operation. My D610 camera body was also evaluated and found to be in good working order. It was checked and cleaned before return shipment. Since receiving the repaired lens back from Nikon and during trips to California and New Mexico, I’ve made nearly 3,500 exposures at a range of apertures from f/5.6 to f/16. All appear to be correctly exposed. Below, are a few samples. I am, of course, thrilled to have my lens back in good working order. Though some additional time is needed before I’ll have full confidence that the repair to the lens completely resolves the diaphragm-control problem, I have been extremely satisfied with the lens’s performance over the last several weeks. I also understand that equipment sometimes fails. That’s what warranties are for. I don’t fault Nikon for the mechanical failure to their product and am genuinely grateful that they addressed the problem in a forthright and timely manner. customers email updates about the status of their repair and estimated time of completion. customers access to a Nikon technician who can explain in plain language the problem being addressed. call center staff access to a customer database with detailed information about past and ongoing product service and repairs. While I am satisfied with the outcome of this service and repair experience, there were times during those six weeks when the lack of information and the inability to communicate with a technically-proficient Nikon employee added to my level of frustration. The experience could have been made less stressful if I’d been provided regular updates on the status of my repair, had the opportunity to communicate by phone or instant messaging with a technician about the symptoms I was experiencing, and if I had not needed to explain the problem to four different call center staff members, none of whom appeared to have access to a detailed history of this particular repair. I love using and doing photography with Nikon products and welcome the opportunity to remain a Nikon customer for many years to come. That said, their customer support could use some work. Whether you’re a Nikon employee, a fellow photographer or a friend, please take this blog entry in the spirit in which it is offered: an objective recounting of a recent customer service experience and an effort to provide constructive feedback to a company whose products I truly enjoy using. Well, I’ve been rambling on about this far too long. It’s time for me to get out and shoot! This entry was posted in DSLR, Review and tagged 200-500mm, aperture, bald eagle, bill ferris, bill ferris photo, bill ferris photography, control, customer, diaphragm, digital, eagle, electromagnetic, f/5.6, javelina, kite, lens, nikon, peccary, pergrine falcon, photo, repair, service, telephoto, white-tailed, zoom on 2016/01/09 by wdferris1@gmail.com. 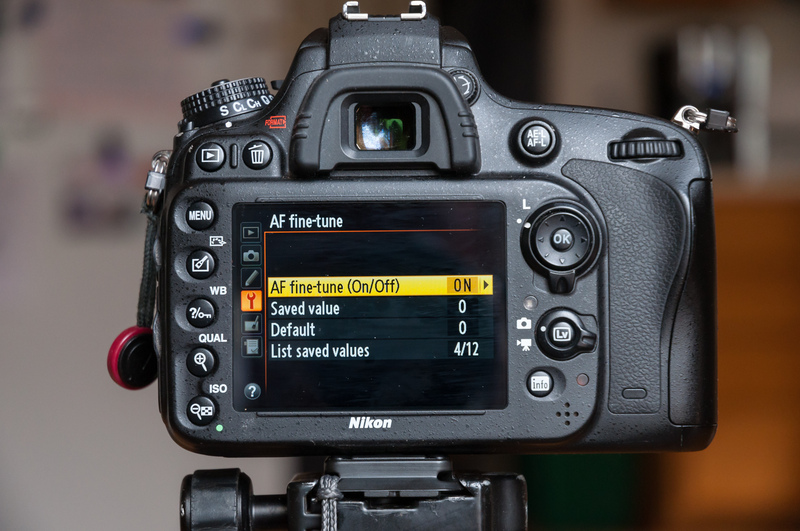 Choosing the right autofocus (AF) mode can be a real challenge. You could leave the driving to the camera and go with Auto-servo AF (AF-A) mode. If you go that route, don’t expect that dumb box of a camera to make the right choices. It will make choices but they’ll probably not be the same choices you would make. Being the risk-taker that you are, I’m sure you spend most of your time shooting in either Single-servo (AF-S) or Continuous-servo (AF-C) mode. These allow you greater control and, when good choices are made, a higher success rate making keeper images. Among those choices, is deciding which one or more AF points to use. 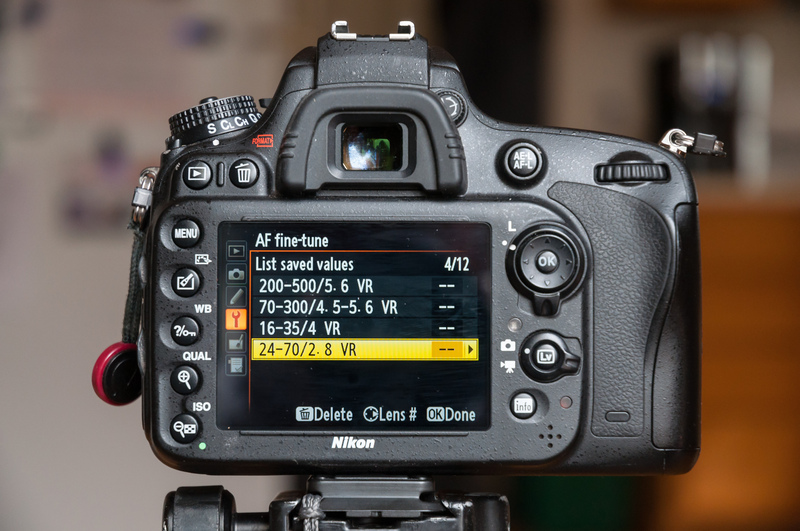 Do you use one, nine, twenty-one or all the AF points on your camera’s sensor? If just one, do you go with the center point or an outer point? If you choose a group of points, which group? Do you allow the camera to have a say in which AF points are used? So many choices. Let’s assume you’ve chosen an AF mode, and selected the number and location of the AF points that will be used. The next challenge is to successfully place at least one AF point over your subject and acquire focus. When it all comes together, it’s a beautiful moment. The shutter clicks open and the image swiftly, silently, gets encoded as a collection of 1’s and 0’s on an SD card. Later, when you look at the photograph in Lightroom and realize it’s still not in focus, that moment of joy becomes frustration. What happened? Why is the eye just ever so slightly soft? Of all the factors than have the potential to cause an out-of-focus image, arguably the most pernicious is a camera/lens combo that is ever so slightly miscalibrated. Despite your mastery of the camera’s AF system, your successful effort to track the subject and the presence of mind to make an exposure at the decisive moment, that slight miscalibration wreaks havoc. Focus is not set on the eye beneath the AF point. Instead, focus is slightly in front of or just behind the eye. The result is an out of focus image that ends up being deleted rather than marked as a keeper. Autofocus fine-tune is a tool offered by many professional and high end consumer cameras. It allows you to adjust where focus is set to compensate for a miscalibrated lens. How does it work? In the above images, the blue shaded portion of the semitransparent square overlay represents an out-of-focus area of the black and white image. The portion of the black and white photo visible within the blue shaded overlay represents the area of the face falling within the focus plane and appearing properly in-focus. TOP: This illustrates a properly focused image. The eyes, brow and mouth fall within the focus plane and appear in-focus. MIDDLE: This represents a back-focused image. The ears and temples are within the focus plane and appear sharp. However, the eyes are above the focus plane and look soft. BOTTOM: This represents a front-focused image. The tip of the nose and chin fall within the focus plane and appear sharp. However, the eyes are behind the focus plane and look soft. In the above illustration, the focus plane of the camera is represented by the semitransparent, blue square overlay. While all photographs have at least a minimal depth of field, for simplicity, I’m illustrating the focus plane as a two-dimensional, flat zone. With large aperture, small focal ratio lenses being popular for portraiture, the shallow depths of field produced by such lenses leave little margin for error when it comes to achieving accurate focus. If focus is not set on the eye or within a few millimeters of the eye, the resulting image will look “soft” and out-of-focus. There will be portions of the subject’s face that look sharp and in-focus, but if the eyes look soft, the overall impression will be that the photo is soft. A miscalibrated camera/lens combo may give every indication of making a properly focused exposure. However, despite the fact that the focus point may be directly over the subject’s eye, the camera will set focus slightly in front of or behind the eye. 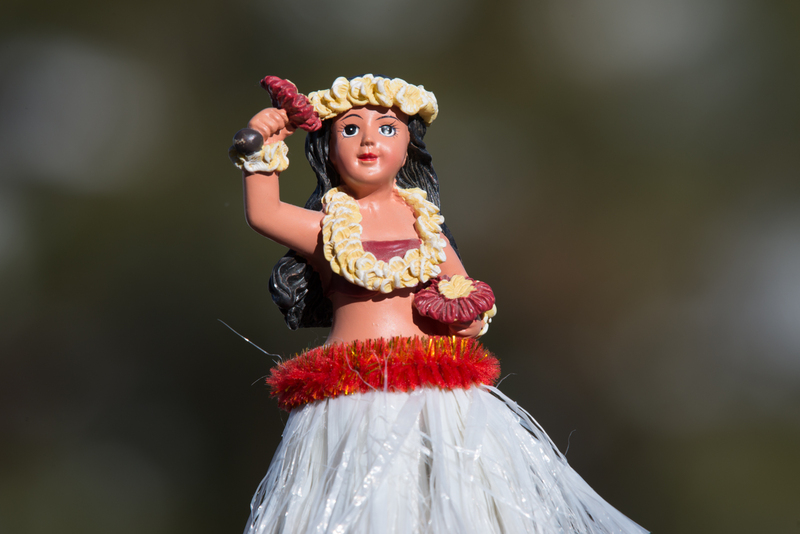 If you are shooting with a fast f-stop, that slight miscalibration can result in unacceptably soft images. 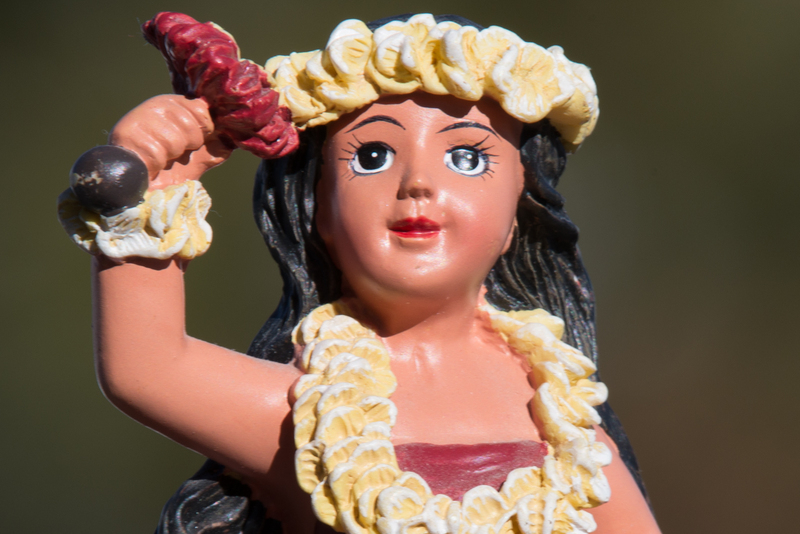 Autofocus fine-tune allows you to compensate for this problem. 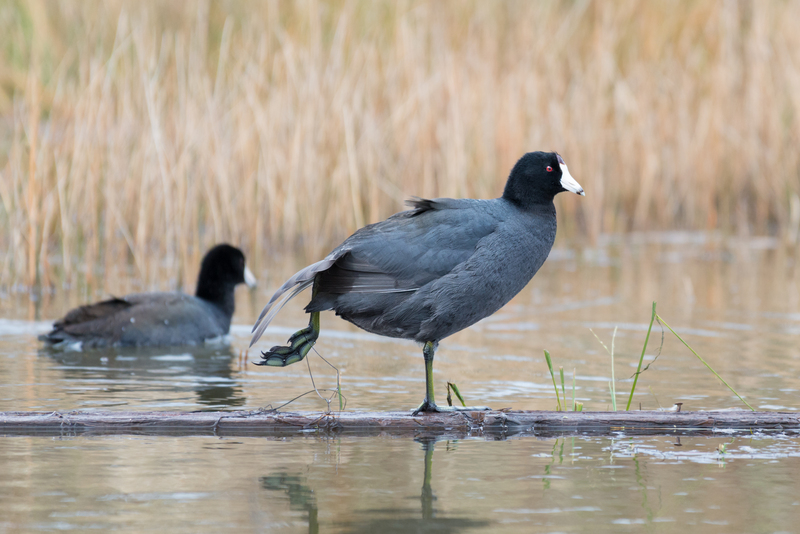 The above series of images illustrate how to use AF fine-tune to add an adjustment to compensate for a lens that consistently front-focuses or back-focuses when used with a specific camera body. AF fine-tune settings are not transferable. A setting on one camera may not be needed on a different but same model body. The setting is unique to that specific camera/lens combination. Also, Nikon bodies do not allow you to define multiple settings for the same lens. 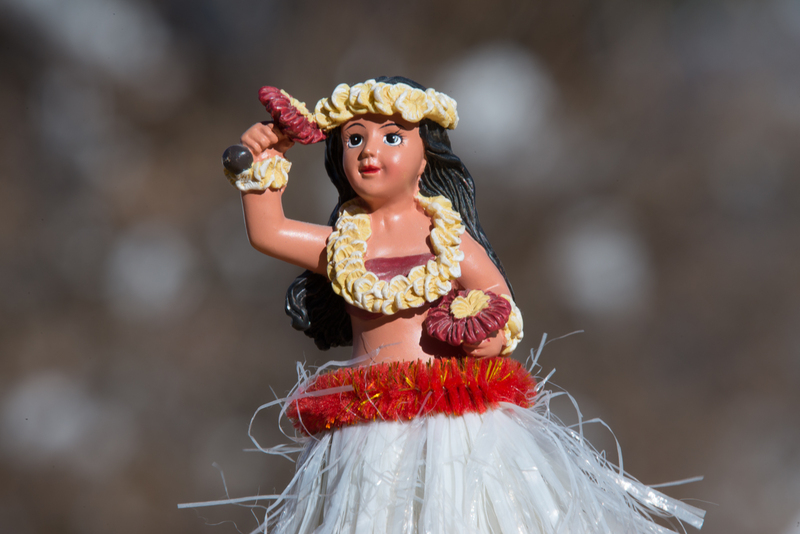 For example, when working with a zoom lens, you are limited to one setting for that lens. If AF fine-tune is engaged, the adjustment will be applied regardless of the focal length used. I recommend you test a zoom lens at the focal length at which it will most likely be used. The below series of images illustrate my approach to testing a lens to determine if an AF fine-tune adjustment is needed. Right click the below images to open a full-size JPEG in a new window. The above series of images is a real world test under real world conditions. When shooting portraiture with the D610 and Tamron 24-70 f/2.8 Di VC USD, I typically shoot wide open with a mix of ambient light and flash at 1/200-second. If you’re going to test a lens to determine an appropriate AF fine-tune setting, test the lens under the same conditions in which it will most likely be used. AF fine-tune is turned off for the first image in the series. The next ten images were taken with AF fine-tune turned on. A +2 adjustment is applied in the second image. Images three through six have adjustments of +4, +6, +8 and +10 applied, respectively. A -2 adjustment has been applied to image seven in the series. The next four images have adjustments of -4, -6, -8 and -10 applied, respectively. At each setting, I took five handheld exposures with vibration compensation (VC) engaged. The above series includes the second exposure in each five-exposure set. Reviewing the exposures at 1:1 in Lightroom, all five exposures with AF fine-tune turned off were acceptably sharp at the focus point. Two of the five in that set were a bit shallow in focus, displaying minimal in-focus depth of field in front of the focus point. The set which most consistently produced sharp images with good depth of field both in front of and behind the focus point is the set with an adjustment of -6 applied. Now, it gets complicated. Normally, I would choose the -6 setting for the Tamron 24-70mm f/2.8 VC and leave it at that. However, I also have a Tamron 70-200mm f/2.8 Di VC USD lens but the Nikon firmware does not distinguish between it and the 24-70mm f/2.8 VC. If I leave AF fine-tune turned on with a -6 setting for the 24-70mm f/2.8, the same adjustment will be applied when the 70-200mm f/2.8 is mounted on the D610. So, I’ve also tested the Tamron 70-200mm, using the same approach as with the shorter zoom. The results of the testing with the Tamron 70-200mm f/2.8 VC were fairly straightforward. The best set of images was taken with AF fine-tune turned off. The set taken with an AF fine-tune adjustment of -6 were among the worst of the lot. After testing both lenses, I’ve decided to store a -6 adjustment for the Tamron lenses but to leave AF fine-tune turned off. Both lenses make sharp, usable images without an AF fine-tune adjustment. If I remember to activate AF fine-tune when the 24-70 VC is mounted, so much the better. Now, it’s time to get out and shoot. This entry was posted in DSLR, Lenses, Techniques and tagged 24-70, 24-70mm, 70-200, 70-200mm, af, auto, auto focus, autofocus, bill ferris, bill ferris photo, bill ferris photography, billferris.photoshelter.com, blog, camera, d610, depth of field, di, digital, dslr, f/2.8, fine-tune, finetune, focal plane, focus, focus plane, lens, nikon, photo, photograph, photography, tamron, test, testing, tutorial, usd, vc, vibration compensation, zoom on 2015/11/15 by wdferris1@gmail.com. In August 2015, Nikon announced three new lenses that would soon be available to the photographic community. Introduced that summer day were the AF-S 24-70mm f/2.8E ED VR, the AF-S 24mm f/1.8G ED and the AF-S 200-500mm f/5.6E ED VR. The featured player of this trio was the eagerly anticipated refresh of Nikon’s well-regarded AF-S 24-70mm f/2.8G ED zoom lens. The 24-70 f/2.8G is a popular wide angle zoom among both professional and enthusiast photographers. It is considered by many wedding and portrait photographers to be among the Holy Trinity of fast Nikon zooms, including the 14-24mm f/2.8G ED and the 70-200mm f/2.8G ED VR II. The new lens, the AF-S 24-70mm f/2.8E ED VR features Nikon’s electronic aperture mechanism and also adds vibration reduction (VR) technology to the venerable optic. The biggest surprise of the day – in more ways than one – was Nikon’s introduction of the AF-S 200-500mm f/5.6E ED VR telephoto zoom lens. What made this lens so surprising were its focal length range and price. Nikon and Canon are known around the world as the leading manufacturers of telephoto lenses for professionals and serious amateurs. From the 200mm f2 to the 800mm f/5.6, Nikon’s line of fast long focal length primes are coveted by sports, wildlife and action photographers. Two professional grade zooms, the AF-S 80-400mm f/4.5-5.6G ED VR and AF-S 200-400mm f/4G ED VR II, bring zoom flexibility to the system. These are professional quality lenses and priced, accordingly. With a manufacturer’s suggested retail price of about $2,700 US, the 80-400mm f/4.5-5.6G is the least expensive of the bunch. The fast primes are priced at from $6,000 to $17,900 US. The 200-400mm f/4G weighs in at a hefty $7,000 US. By contrast, the new 200-500mm f/5.6E is priced to be accessible to the consumer: just under $1,400 US. The zoom range and constant aperture suggest this lens was designed and released to compete directly with consumer-priced zooms manufactured by Tamron and Sigma. Tamron introduced the 150-600mm f/5-6.3 Di VC USD in November 2013. Priced at about $1,100 US, the Tamron 150-600 brought quality long telephoto zoom performance squarely within reach of the enthusiast photographer. While sports shooters balked at the relatively slow aperture range, wildlife photographers lined up to add this new lens to their arsenals. 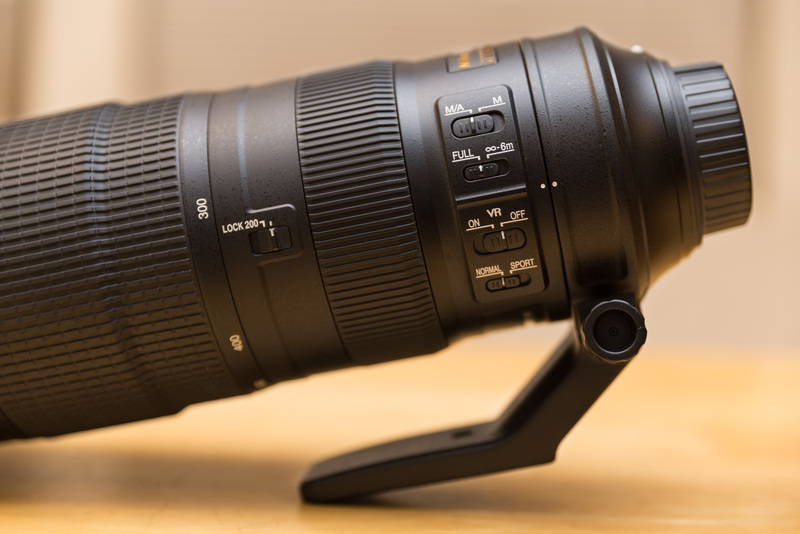 Less than a year later in September 2014, Sigma entered the fray introducing two 150-600mm f/5-6.3 telephoto zooms. They were labeled “Contemporary” and “Sports.” The 150-600mm f/5-6.3 DG OS HSM Contemporary was introduced at about $1,100 US and had the Tamron zoom squarely in its sites. 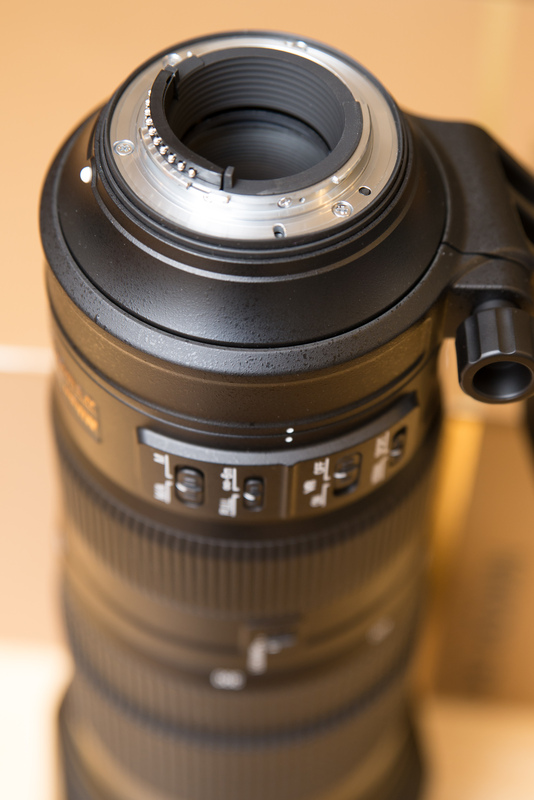 Though the highest priced of the trio at about $2,000 US, the Sigma 150-600 f/5-6.3 DG OS HSM Sports is still well under the entry level fee for a high end Nikon or Canon zoom. I spent the better part of a year contemplating whether or not I should add one of these three lenses to my collection. My growing interest in sports and wildlife photography had created a need for more reach in my lens collection. The Tamron and Sigma zooms certainly addressed that interest. However, their relatively slow focal ratios introduced just enough hesitation that I never pulled the trigger to place an order. Then, Nikon’s August 2015 announcement happened. Within 48-hours, I had done something that was a first for me: pre-ordered a lens. I’ve never been much of a first adopter of tech. Rather than live on the bleeding edge of consumer technologies, I generally prefer to stand back, observe and wait for good deals to emerge on established quality kit. The Nikon AF-S 200-500mm f/5.6E ED VR, however, is a different story. 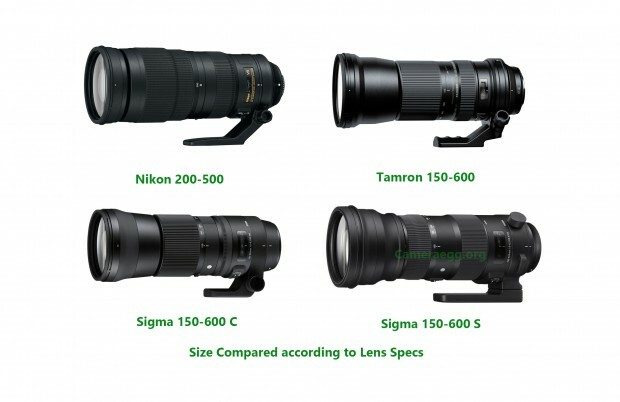 The Nikon 200-500mm f/5.6E, Tamron 150-600 f/5-6.3 Di VC USD, Sigma 150-600 f/5-6.3 DG OS HSM Contemporary and Sports lenses are shown above in their comparative sizes. I have to be honest, the Nikon name immediately intrigued me. I’m a Nikon shooter, having owned five Nikon camera bodies and numerous lenses over the last 25 years. 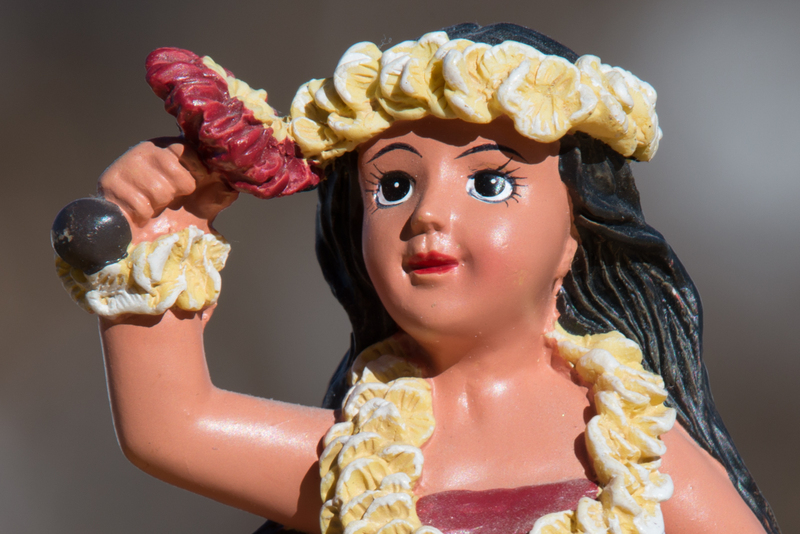 When I placed the pre-order, I did so trusting that Nikon would deliver a quality product. Time will tell if that is the case. Setting aside brand loyalty, there were several performance specifications that also caught my attention. 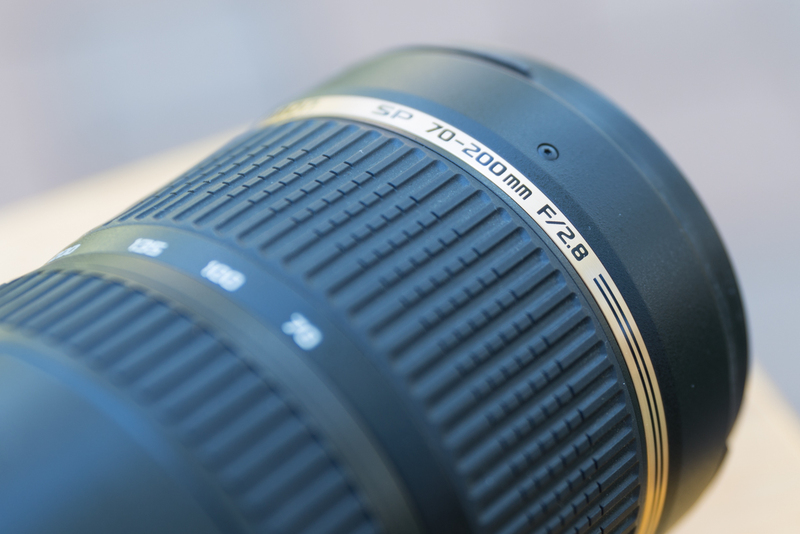 The first and most immediate was the 200mm to 500mm focal length zoom range. At the short end this lens picks up where the excellent Tamron 70-200mm f/2.8 Di VC USD leaves off. 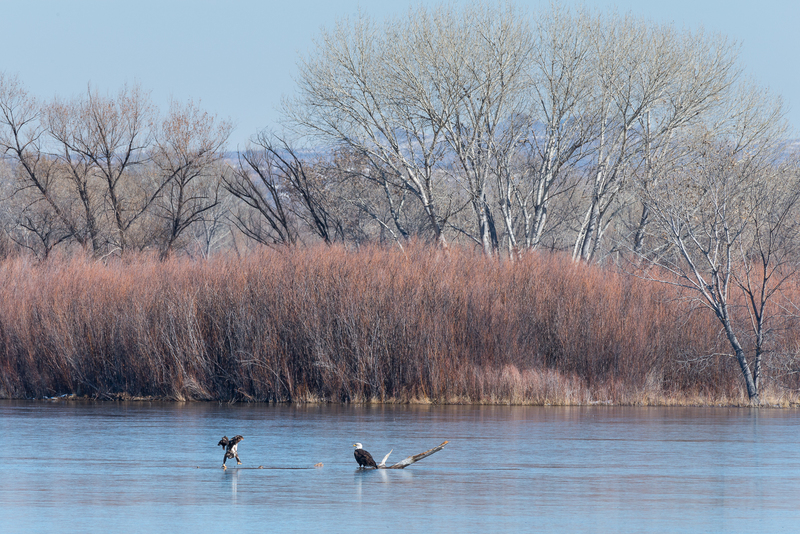 At the long end of 500mm, the lens offers more than enough reach for quality sports photography and also for wildlife. The constant f/5.6 aperture through the full zoom range makes this lens a half-stop faster than the Tamron and Sigma zooms. 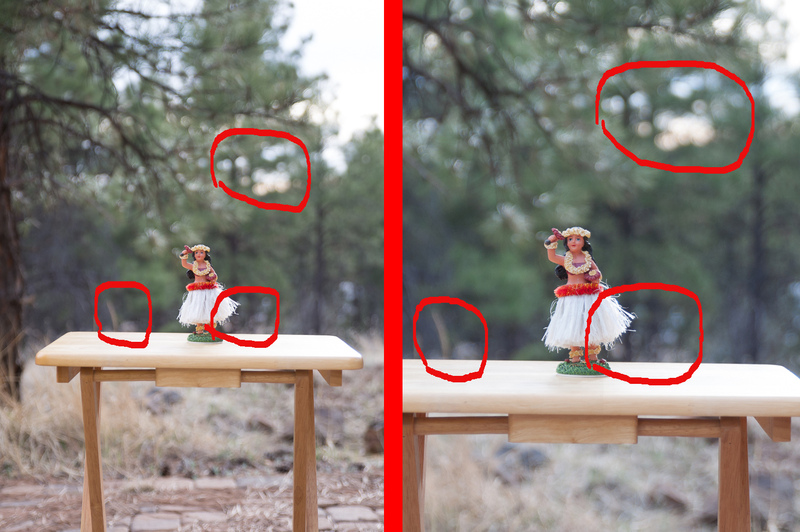 It may not seem like much but that difference in light-gathering means my Nikon D610 camera should be able to use all 39 autofocus points at any focal length. At f/6.3, the D610 starts dropping the outermost AF points. Another intriguing feature was the latest generation VR technology packaged with this lens. Nikon describes the 200-500 f/5.6E as being capable of delivering up to 4.5 stops of vibration reduction. The general rule of photography has, for generations, been that a photographer using good handholding technique should get sharp results using a shutter speed of 1/focal length. In the case of a 500mm lens, a 1/500-second exposure should not require VR. (This is not to say that VR would not aid a handheld exposure at that speed, merely that good handholding technique with a 500mm at 1/500-second should produce a sharp image.) A 4.5 stop improvement with VR translates to a minimum exposure time of between 1/20- and 1/30-second. That’s amazing! 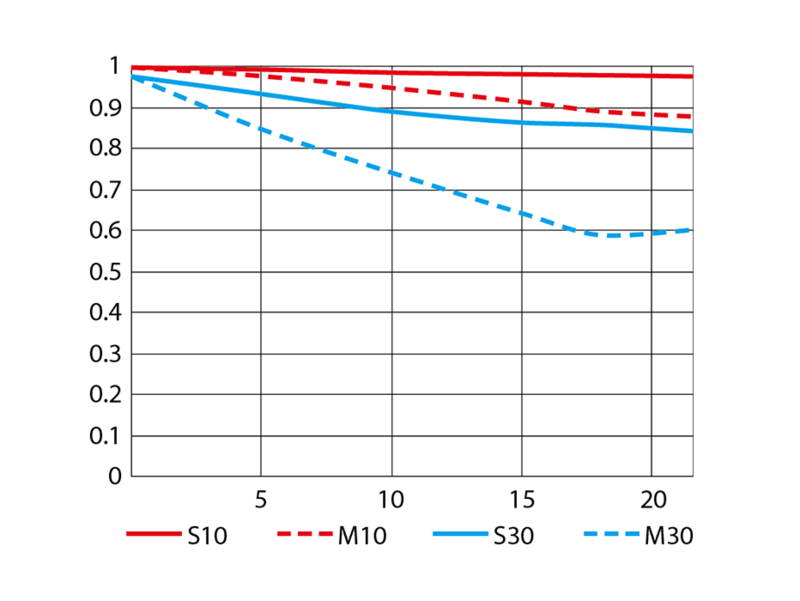 The red lines illustrate contrast performance while the blue lines illustrate resolution performance. The vertical scale measures performance in both areas with better performance being higher on the scale. 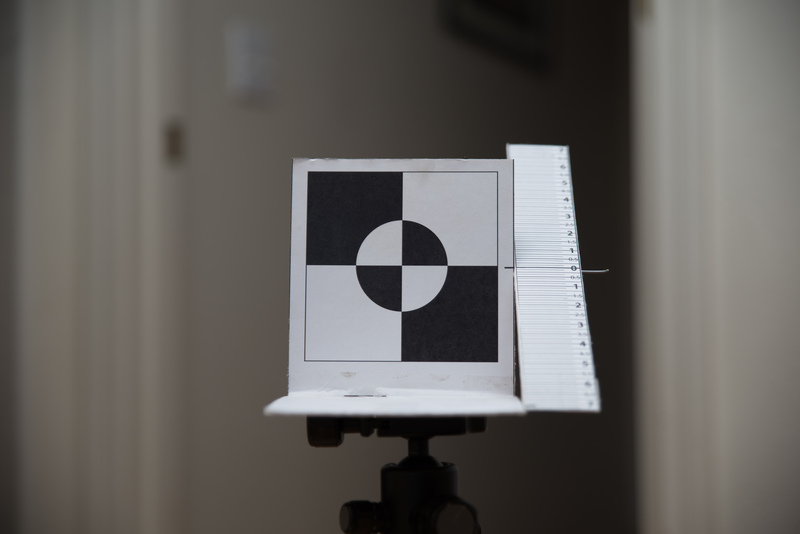 The horizontal scale measures distance from the center of the lens. 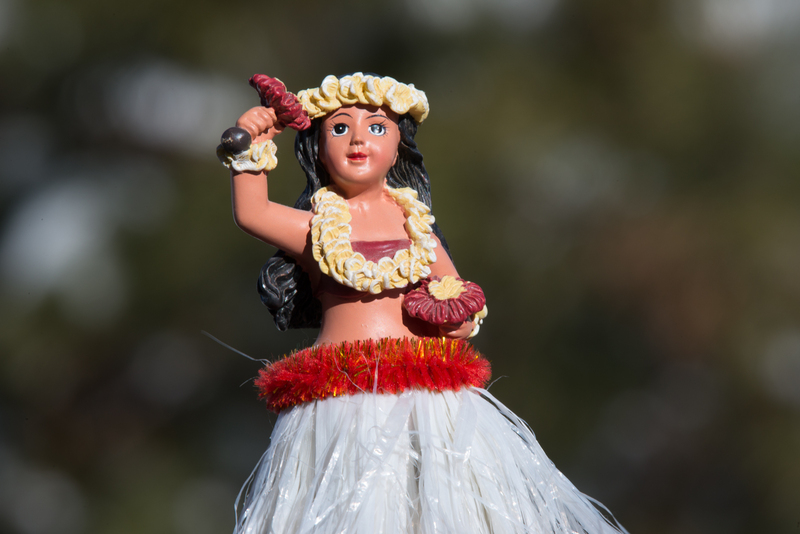 At 200mm f/5.6, the lens should deliver excellent contrast (0.9 or higher) across the entire angle of view. Resolution should also be excellent from the center to roughly two-thirds the distance to the edge of the angle of view. Very good resolution performance can be expected across much of the rest of the angle of view with good performance at the very edge. 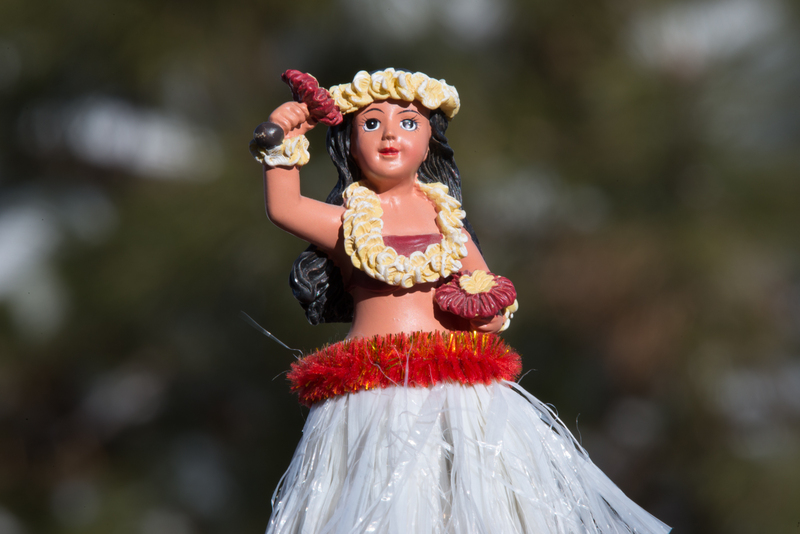 At 500mm, f/5.6, the lens continues to deliver excellent contrast performance across the full angle of view. The slight separation of the sagittal (solid) and meridional (dashed) lines suggests a subtle though largely imperceptible loss of contrast. Resolution performance continues to be excellent at 500mm, f/5.6 across half the angle of view and remains very good to the edge of the field. The separation of sagittal and meridional lines suggests a possible though subtle astigmatism. This lens should control for chromatic aberration, quite well. The excellent theoretical performance of the lens was the deal-maker for me, giving real confidence in the decision to pre-order. Then, the waiting began. 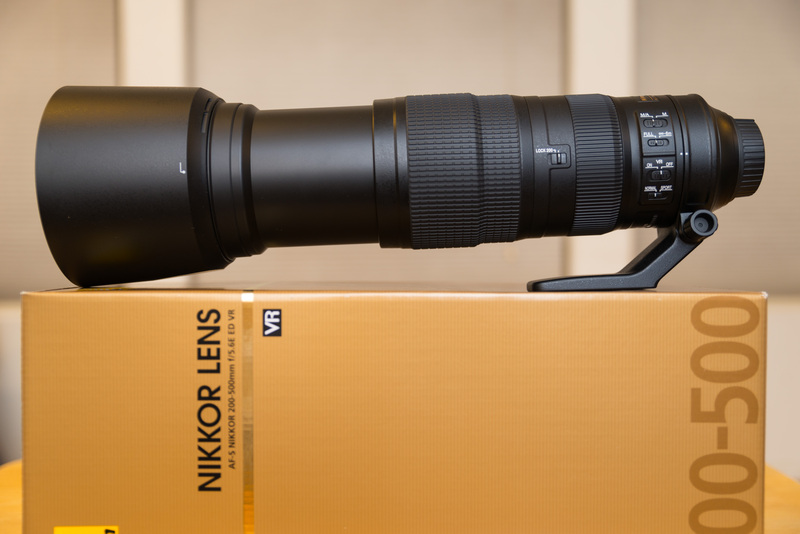 On the evening of September 23, UPS delivered my copy of the Nikon AF-S 200-500mm f/5.6E ED VR zoom lens. It was too late on that day to do much more than record an unboxing video for my YouTube channel and take a few photos of the new lens. A month has now passed during which time I have made a bit more than 2,600 exposures with the 200-500. What follows, is a Short Term Review based on the first month’s use. This isn’t a final review and, despite having formed some strong initial impressions, will not include any final conclusions. This review will include my initial observations about the performance of the lens and my own development as a photographer working at super telephoto ranges. Weight of tripod collar: 7.0 oz. Weight of lens hood: 4.0 oz. M/A – M: Autofocus switch. In M/A, lens autofocuses with instantaneous manual focus override as an available option. In M, the lens manually focuses, only. FULL / ∞ to 6m: When focusing on subjects nearer than 6 meters (20 feet) distant, set to FULL. When focusing on subjects at greater than 6 meters distance, set to ∞ to 6m. VR On / VR Off: Vibration Reduction (VR) On/Off switch. VR should not be turned on until camera body is on. VR should be turned off before camera body is turned off. NORMAL / SPORT: With VR on, you may choose either NORMAL or SPORT mode. In SPORTS mode, Nikon VR recognizes a panning motion and compensates for camera shake while preserving intended motion blue due to panning. Lock 200: This switch locks the lens at a 200mm focal length during transportation and storage. With the lock disengaged, the lens may be zoomed to any point in the focal length range. After shooting with this lens for a bit longer than one month, I would describe the construction and controls as of good to very good quality. The collapsed lens feels hefty and solid in the hands. There is plenty of plastic in the external shell but the lens does not feel, cheap. There are no odd internal sounds when shaking the lens, and not clicking or grinding sounds when rotating either zoom or focus. The tripod collar is sturdy with the mounting foot serving perfectly as a handle when carrying just the lens. The zoom ring, located near the end of the lens, is rubberized and has smooth motion with just the right degree of tension. I would describe the sound made by the rotating zoom ring as smooth zippy. The throw (angle of rotation through the complete zoom range) is fairly long at approximately 155 degrees and this makes it difficult to quickly zoom from one end of the range to the opposite. The focus ring, located near the back of the lens just in front of the control cluster has a hard plastic feel and loose rotation action. It makes a whispery sound when rotated and has a throw of about 190 degrees. I typically shoot with the lens focus control set to M/A (Auto with instantaneous manual override) and have not had any instances where I unintentionally brushed against or rotated the focus ring to lose focus. The 200-500mm f/5.6E ships with a lens hood and soft case. These are, quite frankly, fairly cheap low quality items. The lens hood locks in place with a quarter turn. It is not a firm, confident lock. Rather, the hood issues a soft click when locked in position and can be easily rotated to unlock. There have been a couple of occasions when I’ve inadvertently bumped the lens hood enough to either rotate it or flex it just enough to loosen the connection. The soft case is just that. The only padding is a thin sheet at the bottom of the case. Just a couple of weeks after the lens started shipping, Nikon Europe announced a firmware upgrade to address and correct a bug in the lens’ autofocus performance. In summary, when simultaneously engaging autofocus while zooming, autofocus will occasionally shift to manual mode. Autofocus can be restored by releasing the shutter, AF-ON or AE-L/AF-L button and then re-engaging so, this is not a catastrophic issue. I would describe it as an annoyance. 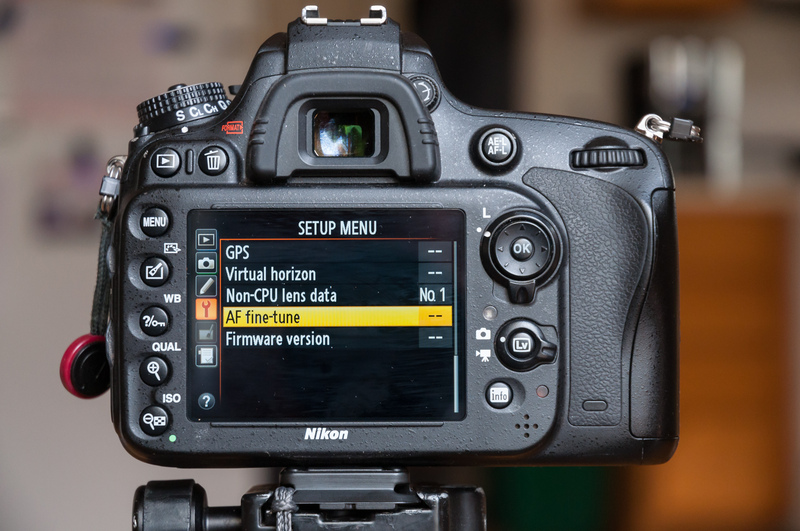 In online discussion forums, some photographers have questioned the value of the firmware upgrade saying they never simultaneously zoom while engaging autofocus. Others, myself among them, say the technique is one they employ on a more or less regular basis. When photographing sports or wildlife, I will often adjust zoom and focus, simultaneously, in order to maintain both good composition and focus while tracking a fast-moving subject. Rather than wait for Nikon to send me a personalized invitation, I visited the Nikon USA website and found their statement about the firmware upgrade. Nikon treats this, not as a service under warranty issue, but rather as an optional upgrade which is available to their US customers. Nikon paid for expedited 2nd day shipping to and from their Los Angeles facility. The lens was in their possession for two business days and Nikon kept me informed via email of the status of the work being done. 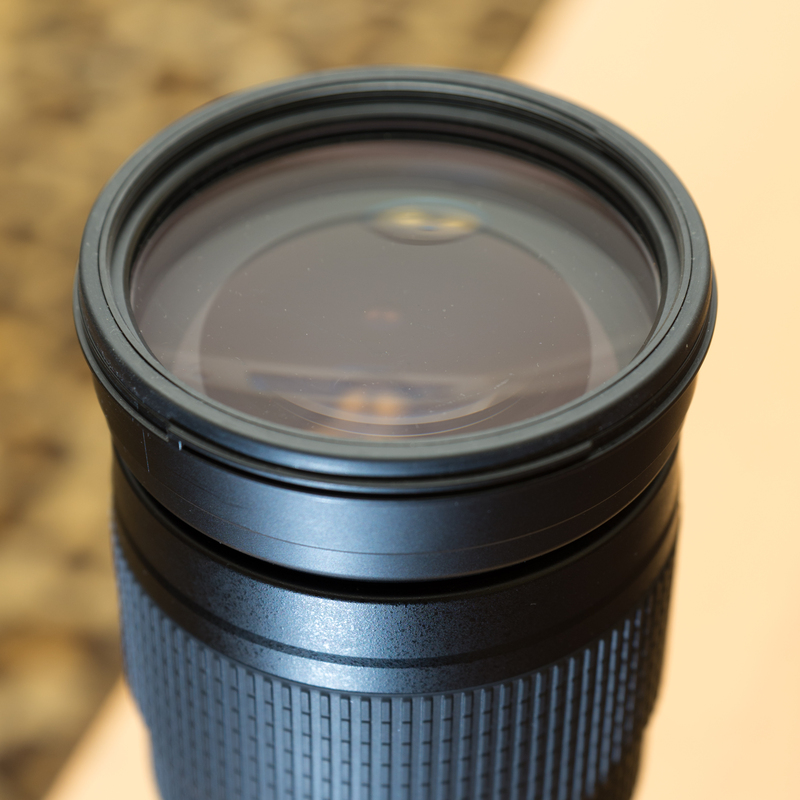 UPS delivered the upgraded lens on October 15. 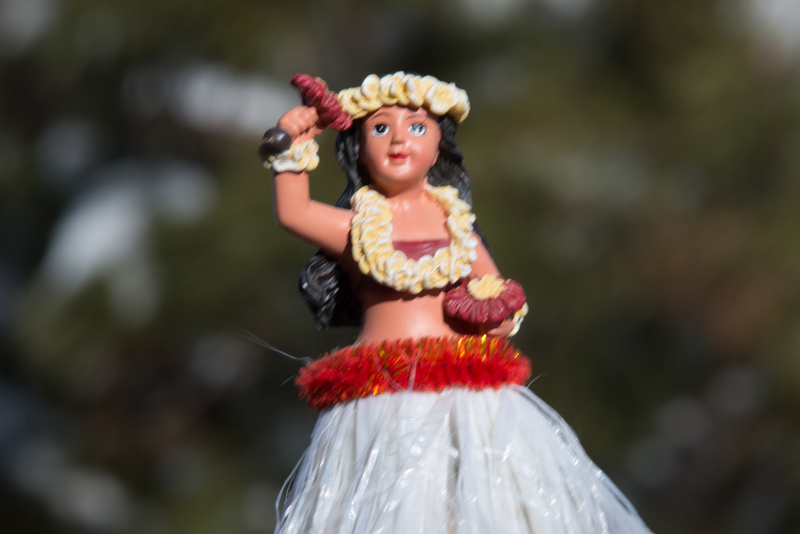 The following morning, I tested the autofocus performance by using back button focus to keep AF engaged while simultaneously panning and zooming between two trees in my backyard. Autofocus continued to work while I panned and zoomed from one tree to another more distant tree, repeating this motion twenty times. 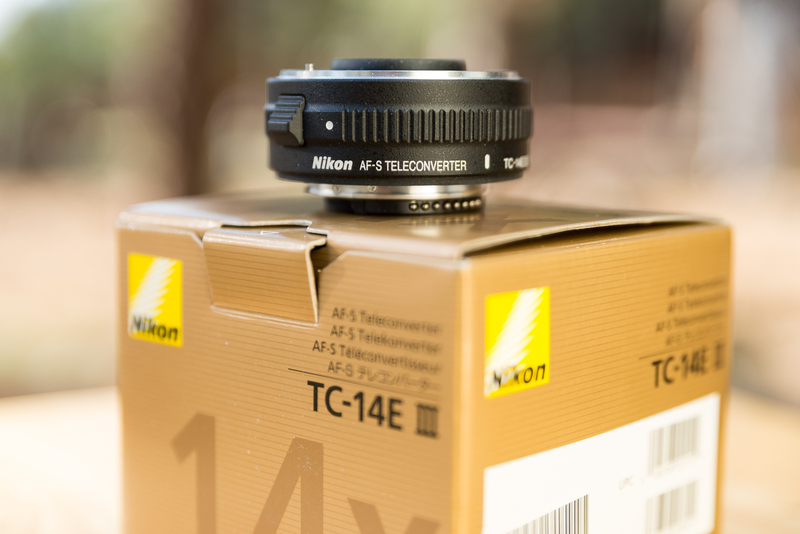 The autofocus bug continues a trend for Nikon of shipping new products with performance issues. It is a problem that dates back at least to 2012, including the D800/D800E camera bodies (2012-left side autofocus), D600 body (2012- dust and oil on sensor), D750 body (2014-dark banding when shooting backlit subjects), D810 body (2014-bright spots in image during long exposures), 24-70mm f/2.8E ED VR zoom lens (2015-shipping date delayed) and now the 200-500mm f/5.6E. It is an annoying and disturbing development for a company that used to be known for producing and delivering high quality products. Nikon has now developed a reputation of poor quality control during product development and of using early adopting customers as beta testers. If there is a silver lining in this, it is that Nikon has been more proactive and acknowledging and responding to problems with new products over the last year or so. If you are unfamiliar with Nikon tripod collars, figuring out how to remove the collar from the tripod can be a bit confusing. The collar is not hinged and does not open fully for removal. Rather, when the locking mechanism is loosened, the collar open just enough to slide over the back of the lens. However, the collar features an interior channel which slides over four locking screws on the lens. To align the locking screws with openings in the collar channel, rotate the loosened collar until the indicator with the carrot is aligned both with the F-mount indicator dot and with the collar alignment indicator on the camera. With the collar rotated as shown in the above photo, it should slide easily off the back of the lens. Well, now that the housekeeping is taken care of, let’s focus on the central question: is the AF-S 200-500mm f/5.6E ED VR lens a quality optic? Does it, for want of a better metaphor, punch above its weight class to deliver performance exceeding what one typically gets when shooting with a sub-$1,500 telephoto zoom? Let’s look at some sample photos. Full-sized JPEG’s of the below images are available for viewing by right-clicking on the image. After my first month shooting with the AF-S 200-500mm f/5.6E ED VR telephoto zoom, I find the lens to be very sharp, delivering crisp detailed images of nature and wildlife. 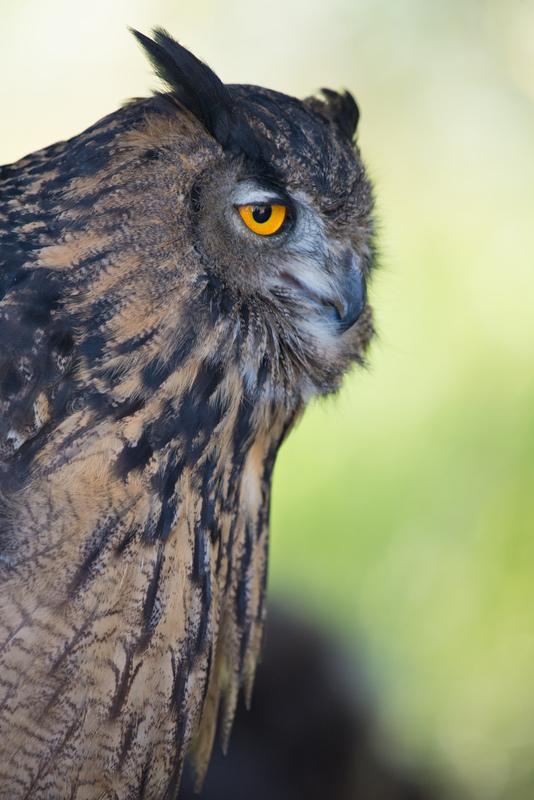 If you open the above image of the Eurasian eagle owl (the last in the sequence) in a new tab and zoom in, you’ll see my silhouetted form clearly defined in the owl’s pupil. You’ll see similar results in the full-size JPEG images of the peregrine falcon and in the first photograph of the Eurasian eagle owl. The detail in the lunar photos is very sharp. At 500mm, the lens easily resolves craters of approximately 10 kilometers diameter and partially resolves 1 kilometer wide craters on the Moon’s surface. Details such as bright ejecta rays and dark maria are also easily discerned. Chromatic aberration along the lunar limb is negligible and quite easily eliminated with the click of a button in Lightroom. 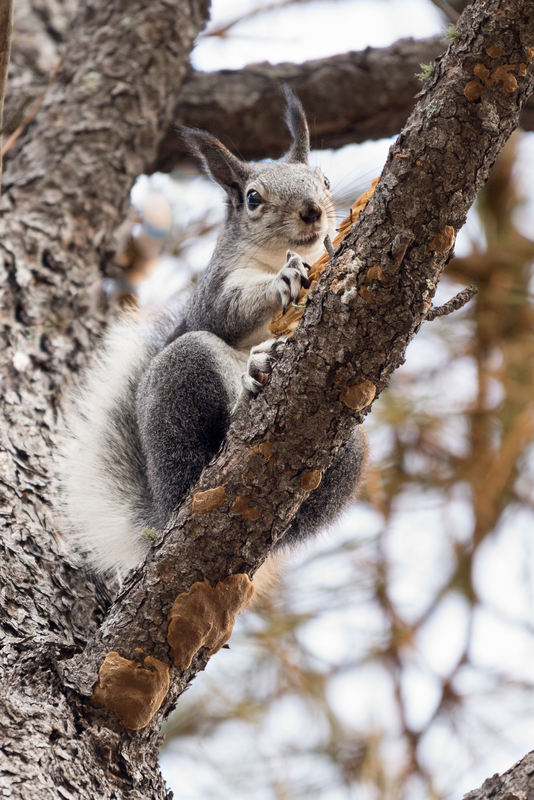 Check out the detail in the Abert’s squirrel photo. I shot this from a forest path with the squirrel about 30 feet up in a tree. Focus is on the squirrel’s hind leg but, at f/5.6, there is enough depth of field that the eye is acceptably sharp. The best detail in this image is in that hind leg, in the toes, claws and padding on the bottom of the foot. And check out the small bit of green – a freshly sprouted branch – on the bark below the squirrel’s bushy tail. 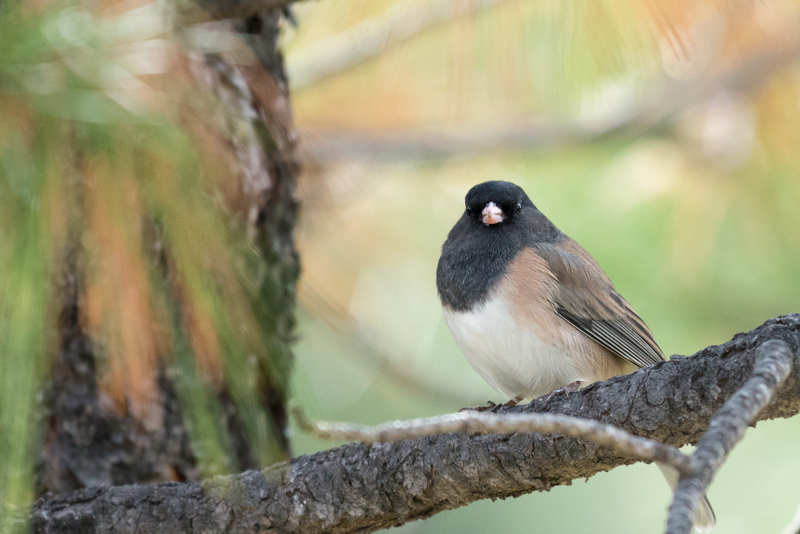 The photos of the dark-eyed junco show good focus on the eye, fine detail in the feathers and a very pleasing creamy bokeh. This lens handles background blur in a wonderful manner. The bokeh is smooth and soft, and more than adequate to create the desired separation between the subject and background. 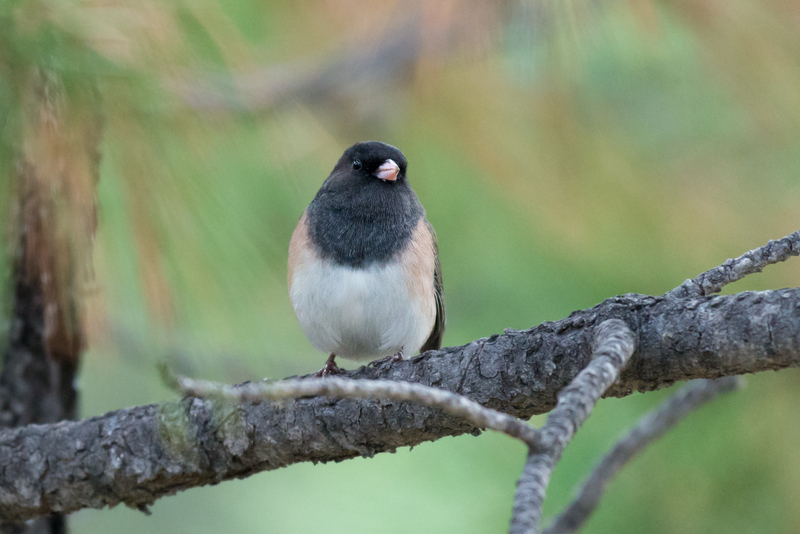 The junco photos were made from a distance of about 50 feet. 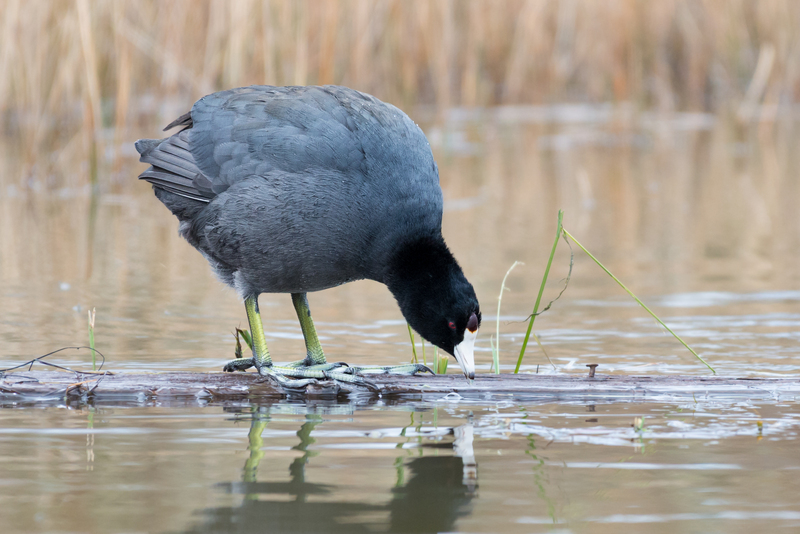 The photos of the American coots were made at various distances, ranging from about 20 feet to a greatest distance of nearly 80 feet. The eyes and water droplets are crisp and well-defined. The feathers show good detail and texture. When you consider this high level of performance is made available in a lens priced thousands less than the Nikon telephotos that most closely compete with it in terms of sharpness, contrast and general image quality, the 200-500mm f/5.6E is truly an astounding value. If you can’t make outstanding images with this lens, it’s not the lens’ fault. 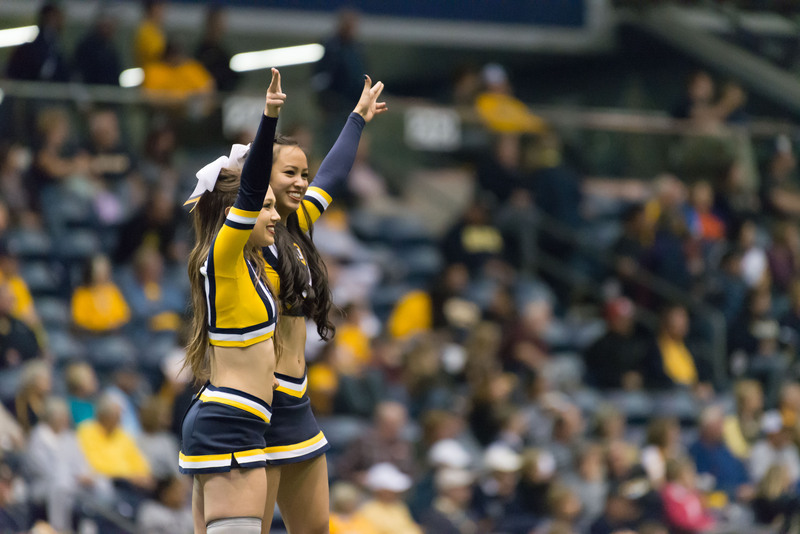 The photos from the football game illustrate the most significant limitations of the lens. Those are its limited – in comparison with high end professional telephoto primes and zooms – light gathering ability and less-than-nimble autofocus performance. 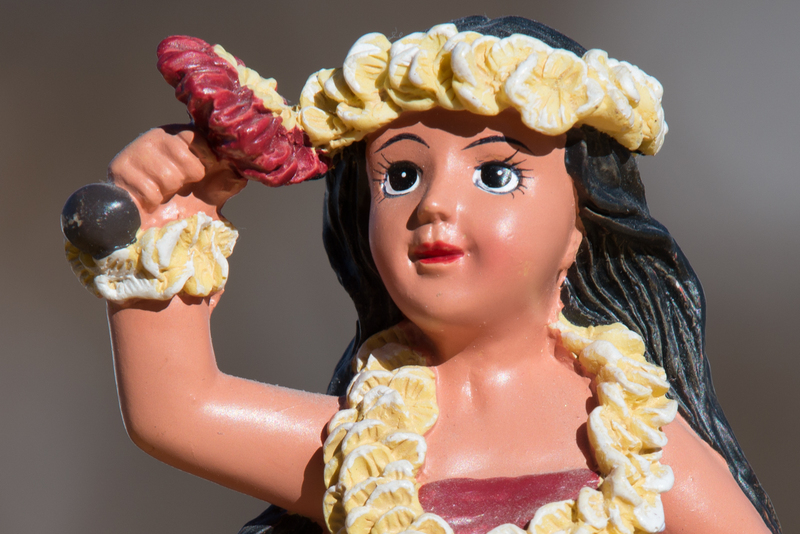 Let’s talk first about the light-gathering ability of the 200-500mm f/5.6E lens. 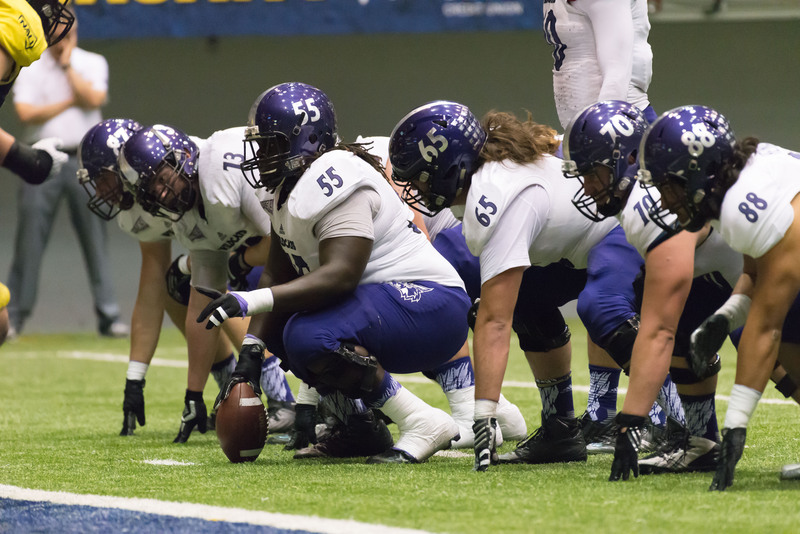 The game was played in the J. L. Walkup Skydome on the campus of Northern Arizona University. This is not a well-lit venue. 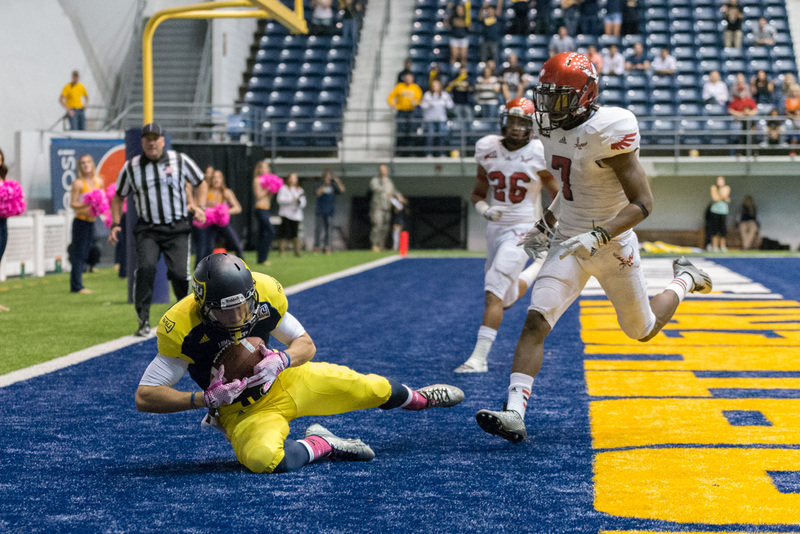 The above photo of a game-winning touchdown reception was taken during a 2014 game in the Skydome. Shooting with a Tamron 70-200mm f/2.8 Di VC USD lens at 70mm f/2.8, my Nikon D610 camera body used ISO 8063 (Hi 0.3) to make a properly exposed image at 1/1000-second. This should give you an idea of the generally dim light level (for photography) in this venue. The 200-500mm f/5.6E delivers a constant f/5.6 focal ratio, which is two full stops slower than an f/2.8 lens. To manage the ISO and retain a minimal degree of noise-free clarity, I chose to use exposures ranging from 1/200-second to 1/500-second. 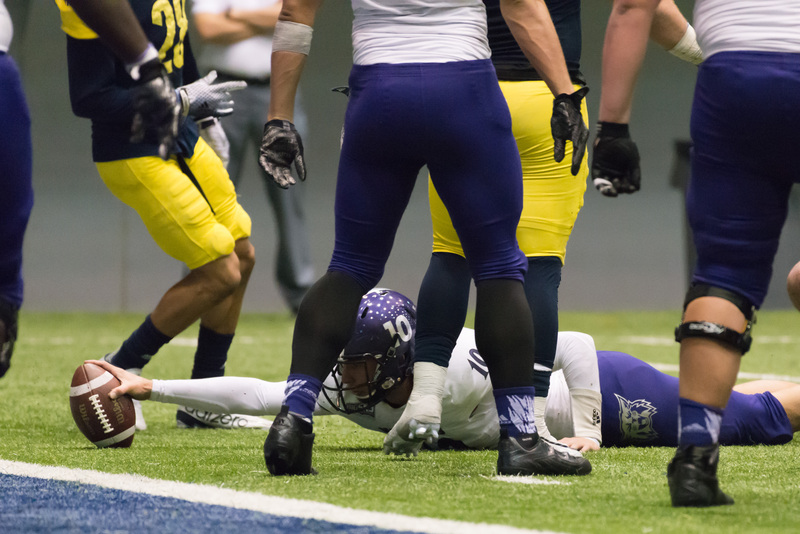 Shooting at 1/200 to 1/500-second won’t come close to freezing the action of a college football game. 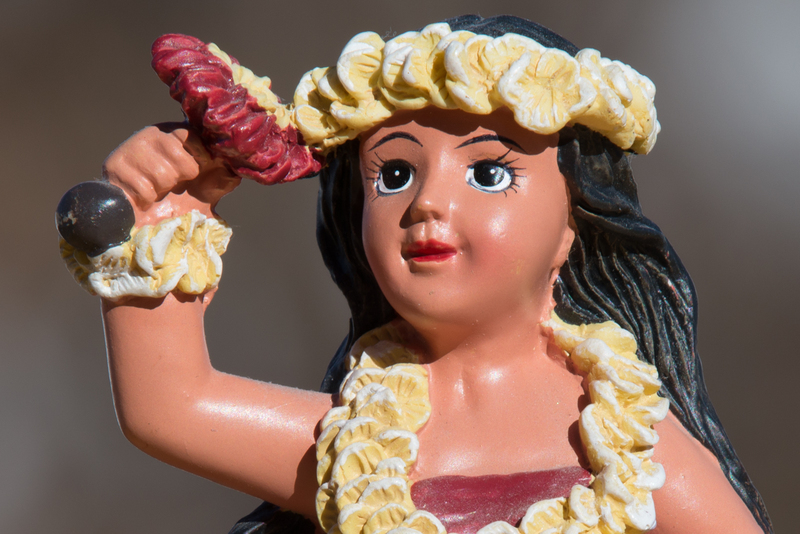 The ISO’s chosen by the D610 at these exposure lengths generally ranged from ISO 6400 to ISO 8063 (Hi 0.3). Starting about midway into the 3rd quarter, I shot with the 200-500 from the north end zone and photographed the action until midway through the 4th quarter. I would describe the autofocus performance as good but not impressive. This is not a lightning fast focusing lens. I also need to acknowledge that my long telephoto lens skills are still in development. 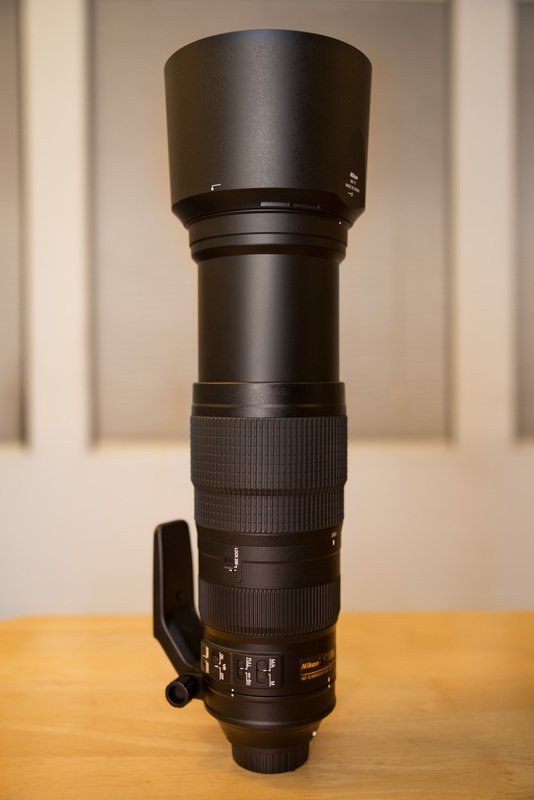 Prior to getting the 200-500, my longest lens had been the Nikon AF-S 70-300 f/4.5-5.6 ED VR. This is a consumer quality telephoto zoom. It is not impressively sharp but does offer good reach at a reasonable price. It’s also nicely portable and lightweight. In July 2015, I used the 70-300 to photograph a battle between two bison bulls for herd dominance on the North Rim of Grand Canyon. It was an exhilarating moment and the lens performed, well. However, it was that experience that got me seriously thinking about adding a long telephoto zoom to my kit. The 300mm maximum reach just wasn’t enough for that moment. Anticipating the size, weight and magnification of the 200-500 would exceed my capacity for handholdable comfort, I purchased an Oben model CTM-2500 carbon fiber monopod to support the lens. 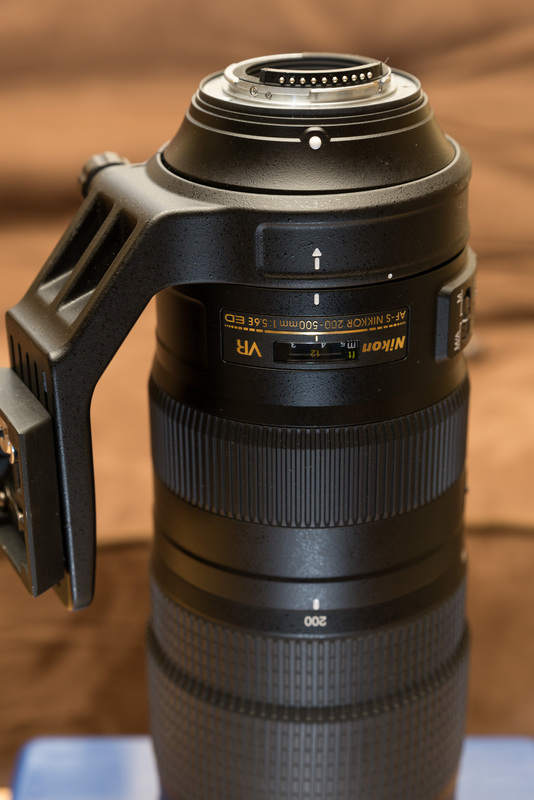 Pictured above, is the Nikon lens mounted to the Oben monopod and VH-R2 monopod tilt head. I’ve used this combination extensively during this first month of ownership and I have to admit the monopod was a great investment. 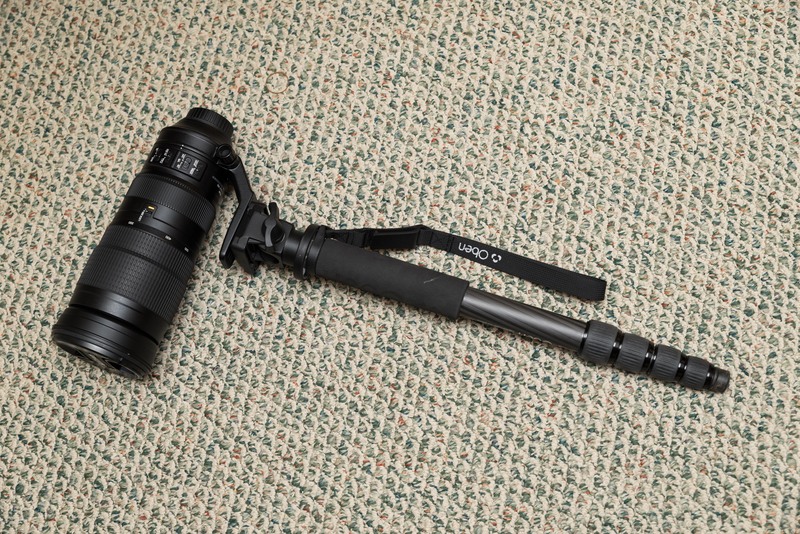 It’s carbon fiber construction makes the monopod very light, weighing in at just 1 lb. 10 oz with the attached VH-R2 head. It is a five-section design which collapses to a respectable and compact 19 3/4″ length including the tilt head. Every photo in this article taken with the 200-500 was made with the lens mounted to the Oben monopod. There is one major criticism I have of the Oben CTM-2500 monopod. I don’t like the mounting plate that comes with the VH-R2 tilt head. It is not a standard size plate. As a result, I can’t attach a Peak Design mounting plate to the 200-500’s tripod collar foot. Also, the Oben mounting plate has a spring-loaded second pin that doesn’t have a matching companion hole in most tripod collar feet. The bottom of the 200-500’s tripod collar foot is lined with channels that provide some degree of purchase for the Oben pin. However, after a few days, the Oben plate inevitably becomes loose enough that I have to tighten the primary 1/4×20 threaded bolt to establish a secure connection. One significant area of personal development over the first month of ownership of this lens has very little to do with photography. It is simply the challenge of becoming comfortable handling a lens of this size and weight. It’s only been in the last week or so that I’ve started feeling at ease carrying and handling the lens. It is much larger and heavier than any other lens I’ve owned or used. During the first few weeks of ownership, I was constantly worried about banging it against a wall, into a door frame or even hitting a person. I’m also developing the ability to get close to wildlife. The challenge is to get as close to your subject as possible without encroaching such that your presence causes unnatural behaviors in the animal. Getting close is as much an art form as a skill. It requires a knowledge and skill set that has nothing, per se, to do with photography. It has everything to do with being invisible and/or perceived as a non-threat to the animal. Once in position, achieving good results comes down to your skill in employing basic and advanced techniques of doing photography at super telephoto ranges. While the 500mm reach of the new lens has allowed me to achieve images I could previously only have imagined, I am not yet fully comfortable working at such a long focal length. This lens challenges my ability to anticipate and follow action, maintain good composition and employ good focusing technique. 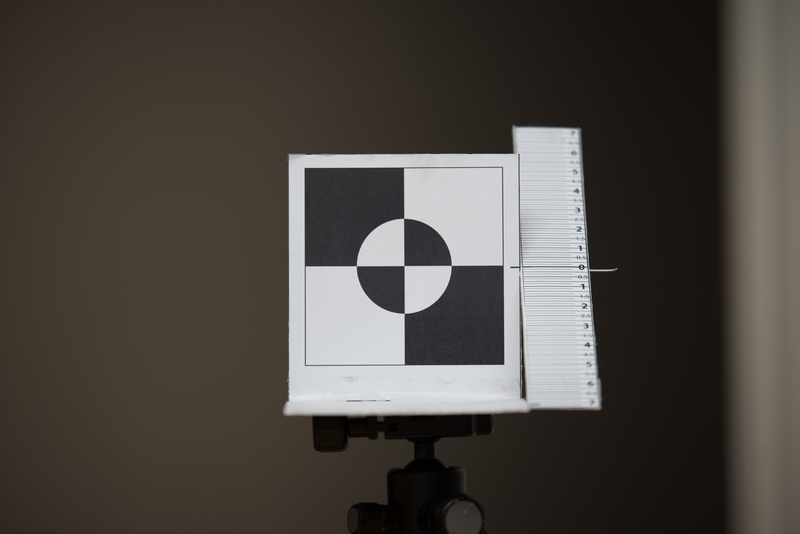 The margin of error in these areas is much wider when using shorter focal lengths. When working at 300mm, 400mm or more, precision in composition, tracking and technique is essential. While my skill and comfort working with this zoom range is improving, I am not yet where I want to be. One photographic skill that is critical to successful photography at super telephoto lengths, is autofocus technique. I have experimented with a variety of modes available on the D610 body. I always use AF-C mode when photographing moving subjects and have been hopping about between single-point, 9-point and 3D modes. Depending on the situation, each offers its own advantages. I’m also experimenting with AF settings defining the length of time the lens will hold focus before resetting. This brings me to a comment about the most-cited weakness of Nikon’s newest super telephoto zoom; its “poor” autofocus performance. This is, according to experts in online fora, the biggest weakness of the lens. 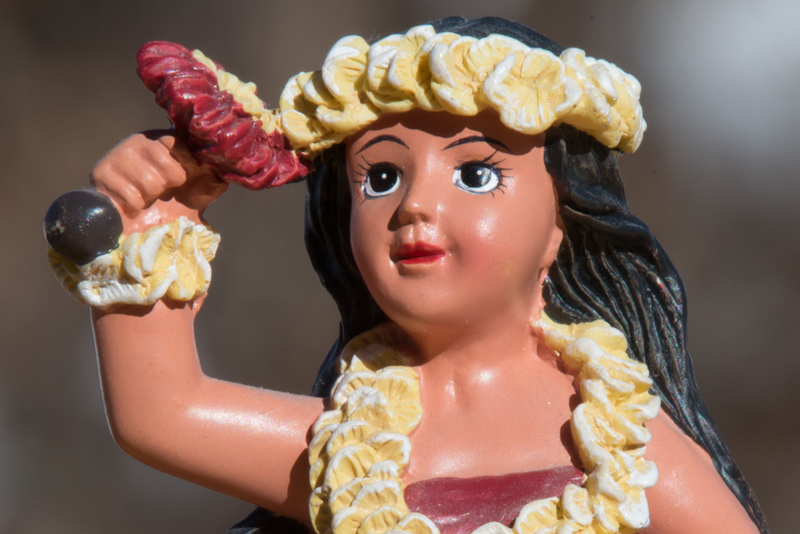 Many of the self-appointed experts haven’t shot with the 200-500 and are relying on the comments of their favorite expert photographer…typically, a photographer who expresses a view they’ve predetermined to be correct. As mentioned previously in this review, the 200-500 does not have lightning fast autofocus. Nonetheless for many photographers, the biggest limitation impeding the quality of results achieved with this lens will be their own lack of experience working at such long focal lengths. Before blaming the lens, be sure it isn’t your own poor technique that costs you the cover of National Geographic. Since I’ve only been using the lens a month and am still learning to master the challenges that come with shooting at super telephoto range, I’m going to suspend my final judgement on the AF performance of the 200-500 until I’ve eliminated user error as a significant contributing factor. I know for a fact that my own poor technique has cost me potentially good shots. When those instances have been eliminated – or at least, nearly so – I’ll be in a better position to comment with some degree of expertise on the inherent AF performance of this lens. The 200-500mm f/5.6E is fantastically sharp, wide open at 500mm and delivers outstanding VR performance. Priced at just under $1,400 US, this lens does not have the equivalent build quality or autofocus performance of the top professional Nikon telephoto primes and zooms. That said, this lens is an incredible value and can be a tool helping to elevate your wildlife, nature and outdoor sports photography to new levels. 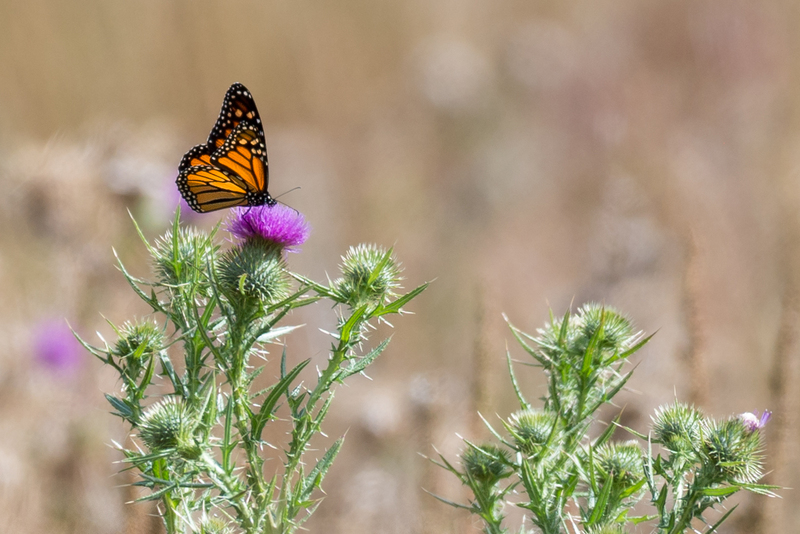 This entry was posted in DSLR, Lenses, Nature Photography, Review, Sports Photography, Techniques, Wildlife Photography and tagged 200-500, 200-500mm, abert, abert's, American coot, bill ferris, billferris.photoshelter.com, butterfly, camera, college, ctm-2500, dark eyed, digital, dslr, ed, Eurasian eagle owl, f/5.6e, football, full frame, junco, lens, monopod, moon, nikon, oben, owl, pergrine falcon, photo, photography, review, squirrel, super, telephoto, tilt head, vh-r2, vibration reduction, vr, zoom on 2015/11/01 by wdferris1@gmail.com. 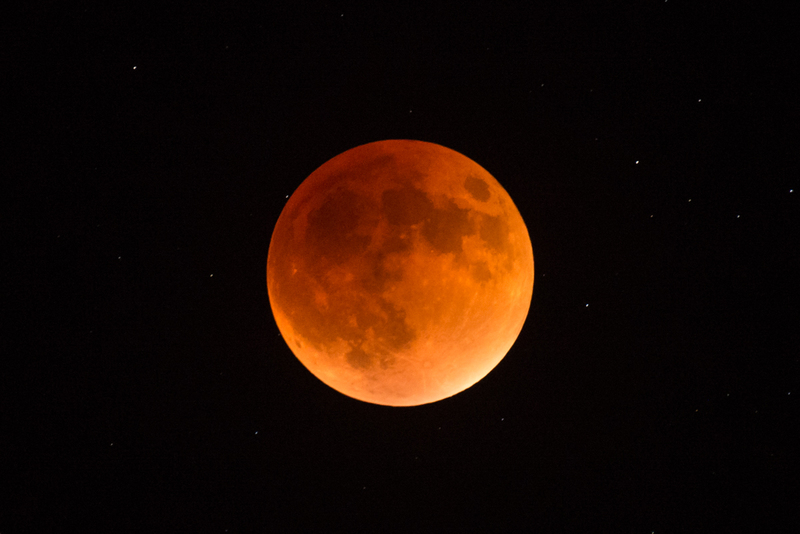 On the night of September 27-28, 2015, the Moon passed through the densest, darkest portion of Earth’s shadow, an event known as a lunar eclipse. Normally, I wouldn’t publish or share a photo like this. It’s just a tad soft, not rich in fine detail. I tried to make a sharp, detailed photo at mid-eclipse but the forces of nature intervened. How is it that we’re able to see the Moon? Well most of the time, the Moon is exposed to the Sun. Despite being a relatively dark object, enough sunlight reflects off the lunar surface to make Earth’s largest natural satellite the brightest object in the night sky…when it’s up and when the side of the Moon that faces Earth also happens to be facing the Sun. 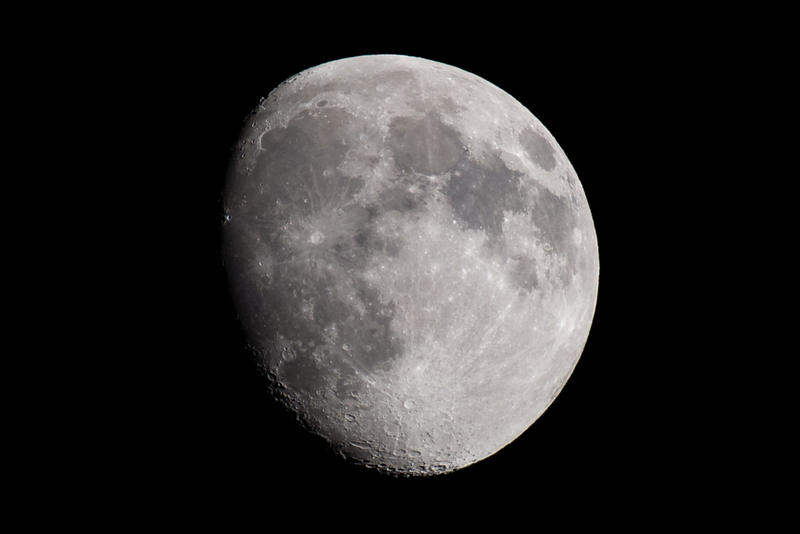 When photographing the Moon, you can use a normal daylight white balance setting (reflected sunlight) a reasonably large aperture (f/5.6), a not-too-high ISO (400) and make a proper exposure at about 1/500-second. That’s when the Moon is near its fully-illuminated best. During a lunar eclipse, the Moon is not directly exposed to the Sun. It’s hiding in the Earth’s shadow…but not totally dark. You see, Earth’s atmosphere acts like a lens. It scatters and refracts sunlight. Short wavelengths (blue light) are scattered in all directions by the atmosphere. Longer wavelengths (red light) are refracted so that this light passes through the atmosphere, travels through space and falls on the Moon. This is why the Moon looks red during an eclipse. Only the red light which passes through Earth’s atmosphere falls on and illuminates la Luna. If you saw the September 2015 eclipse, you probably noticed how dark the Moon looked. Earth was blocking most of the sunlight that normally paints the lunar surface. The rest was mostly scattered. What little passed through Earth’s atmosphere to fall on Luna’s surface was the long wavelength red stuff. As a result, the Moon looked dark or blood red. Two of those three options have nasty consequences for your photos. A few days before the eclipse, I shared the above Moon photo taken at 500mm, f/5.6, ISO 400 and 1/800-second. The Moon is a moving object. It orbits Earth, moving west-to-east about 13 degrees (1/2-degree per hour) through the sky, each day. Much of its motion through the sky is the result of the fact that Earth rotates about an axis. 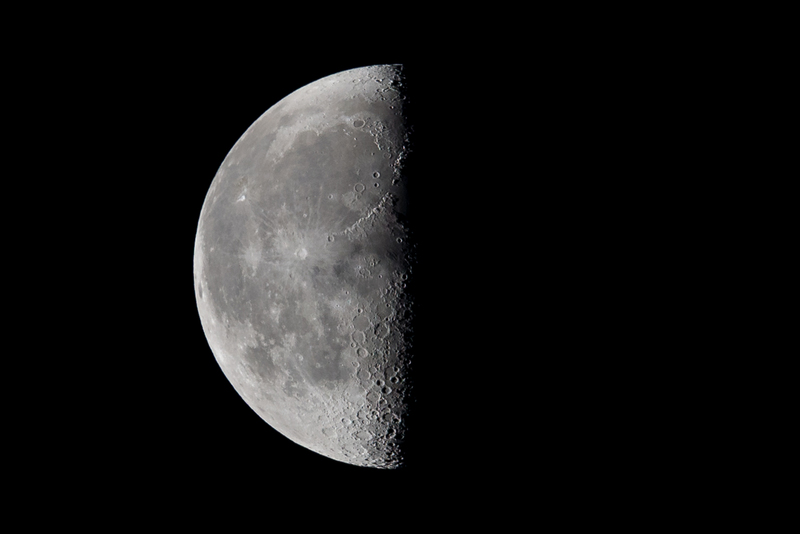 Due to that rotation, the Moon moves east-to-west covering about 15-degrees per hour. If you take a picture of the Moon using an exposure of 1/500-second, your photo will record the Moon and its motion over a distance of about 0.03 arcsecond. The full Moon is about 30 arcminutes in size. There are 60 seconds of arc in each arcminute so, that gives the Moon an angular diameter of 1,800 arcseconds. 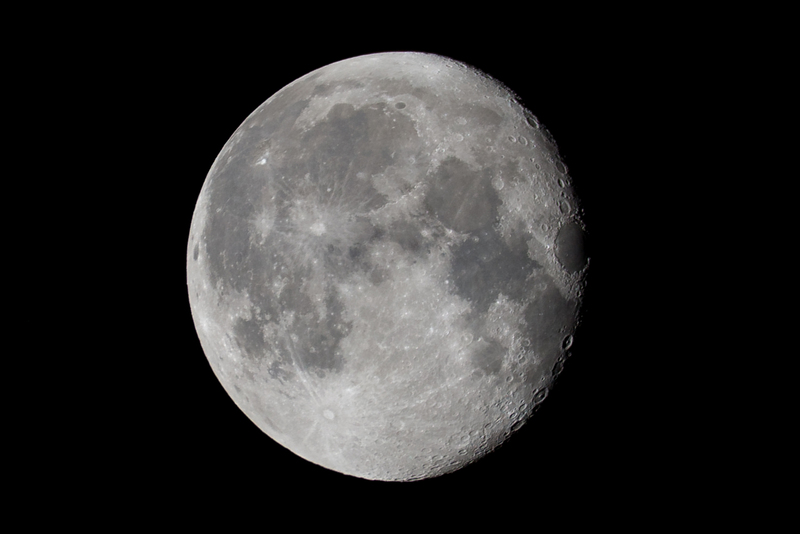 Divided by 0.03, that 1/500-second exposure records motion spanning 1/60,000th the diameter of the Moon. Yes, that is incredibly tiny and is imperceptible to the eye. If you take a picture of the Moon during mid-eclipse using a the same focal length and aperture, and an ISO of 3200, you’ll need about a 1-second exposure to make a proper image. That’s 500-times longer than an exposure when the Moon is illuminated directly by the Sun. Your exposure will record the Moon and its motion across a distance of 15 arcseconds. Now, 15 arcseconds is also a small distance. But it is large enough that the exposure you make will look slightly soft. If your goal is to achieve critical focus on the Moon shooting at 500mm, you’ll need to open the aperture or increase the ISO to use an exposure of 1/2-second or faster. Modern digital cameras are certainly capable of working at ISO 6400 and higher. But unless you’re using a really long lens, you’ll end up cropping the resulting image significantly just to make the Moon fill the frame. This not only makes the Moon look bigger but also emphasizes the digital noise in the photo. The resulting image will look grainy and, as a result, even more soft. The one sure way to make a sharp photo of the Moon during an eclipse such as the one we enjoyed in September 2015, is to attach your camera to an astronomical mount. The mount will need a motor drive that rotates one axis to effectively move the camera opposite Earth’s rotation during the exposure. This rotation cancels the east-west motion of the Moon through the sky so, in essence, you’re photographing a static object. Among the many benefits will be that you can use longer exposures (2-3 seconds) at lower ISO’s (under 1000) to make properly exposed images that are sharp and detailed. Now, get out and shoot. This entry was posted in DSLR, Lenses, Techniques and tagged 200-500, bill ferris, bill ferris photography, billferris.photoshelter.com, blood moon, d610, eclipse, exposure, f/5.6, focal ratio, iso, lens, light, lunar eclipes, moon, motion, nikon, photo, photograph, photography, settings, technique on 2015/09/29 by wdferris1@gmail.com. Let’s nerd out with some tech talk. Let’s chat about focal ratio. Focal ratio is a rarely seen or heard phrase in online photography blogs and forums, which is surprising when you consider the important role focal ratio plays in photography. Focal ratio describes the size of a lens’s focal length relative to its aperture. It is typically expressed as an f-number, such as f/2.8. Ironically, when photographers start talking about lens aperture, it’s more than likely they’re actually discussing focal ratio. Let’s see if we can sort all this out. We’ll begin at the beginning. Focal length is typically the first number mentioned when describing a lens. 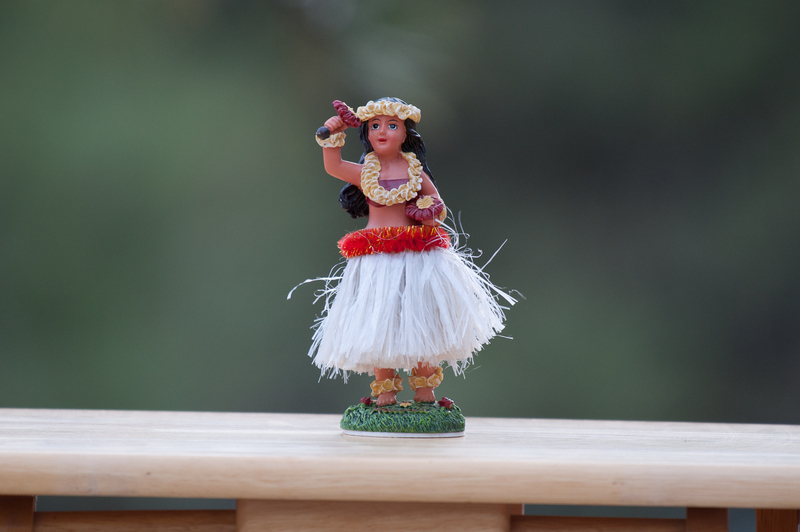 A 50mm lens has a focal length of, wait for it…50mm or roughly two inches. One may be inclined to think focal length is the distance from the front of the lens to the back, but it’s not. Focal length is the distance from the optical center of the lens to the image plane (film or sensor) where the image is formed. The optical center is usually inside the lens and is sometimes referred to as the point of convergence; the point where two light rays converge and cross. The above diagram shows a cross section of the Nikkor 50mm f/1.4 lens. The focal length of the lens is 50mm, which is measured from the optical center of the lens to the image plane at the sensor. Focal length determines how much the image is magnified. This is typically described as the angle of view produced by the lens. A 50mm lens produces a 47° (on a diagonal) angle of view at the image plane of a 35mm camera body. A 24mm lens delivers an 84° angle of view and a 200mm lens presents a 12° angle of view. Since the angle of view produced by a 50mm lens is similar to that of normal vision, it is known in 35mm photography as a normal lens. 24mm is a wide angle focal length and a 200mm is a telephoto lens. Of course, 35mm is just one of many photographic formats. A photographic format is defined by the physical size of the medium used to record the image. In film photography, 35mm describes the length of the long side of a slide or film negative. 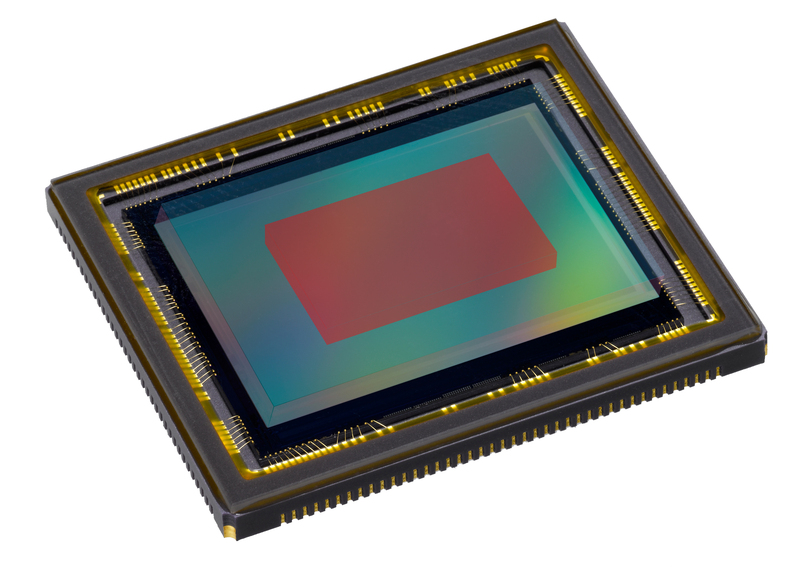 Today’s digital cameras use light-sensitive CMOS sensors to record images. In full frame digital cameras, the sensor measures 36mm on the longest side. APS-C digital cameras have sensors that are about 23mm on the longest side. The camera in your smartphone or tablet is probably built around a sensor no larger than about 10 millimeters. What does sensor size have to do with this topic? A lot. 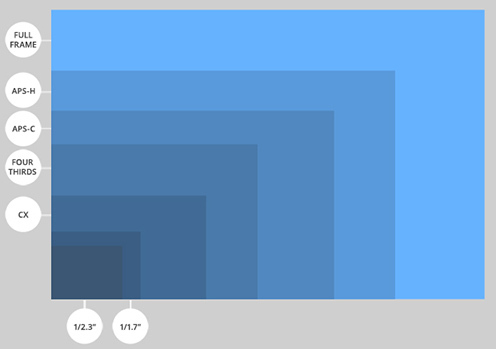 The above diagram illustrates the relative sizes of common digital camera sensor formats. The largest shown is a full frame (35mm equivalent) sensor. The smallest (lower left corner) is representative of a smartphone (1/2.3″) sensor. The smaller the sensor or film medium, the farther you need to be from your subject to match the field of view delivered by a given focal length lens. Imagine standing 10 feet from your subject with a full-frame DSLR camera and framing your subject head-to-toe using a normal 50mm lens. 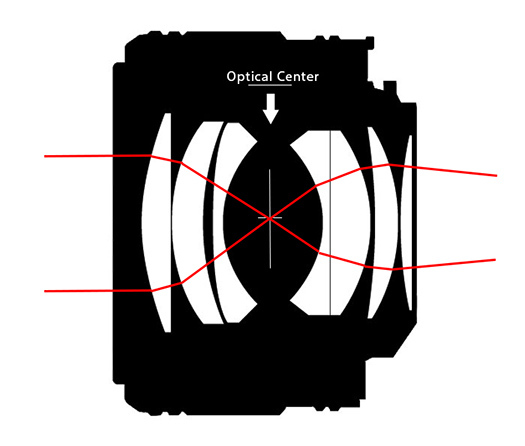 If you were to mount the same lens on an APS-C camera body, that camera’s smaller sensor would cut off or crop a portion of the image produced by the lens. You would need to step back to a distance of about 15 feet to reproduce the angle of view you had with the full frame camera body. 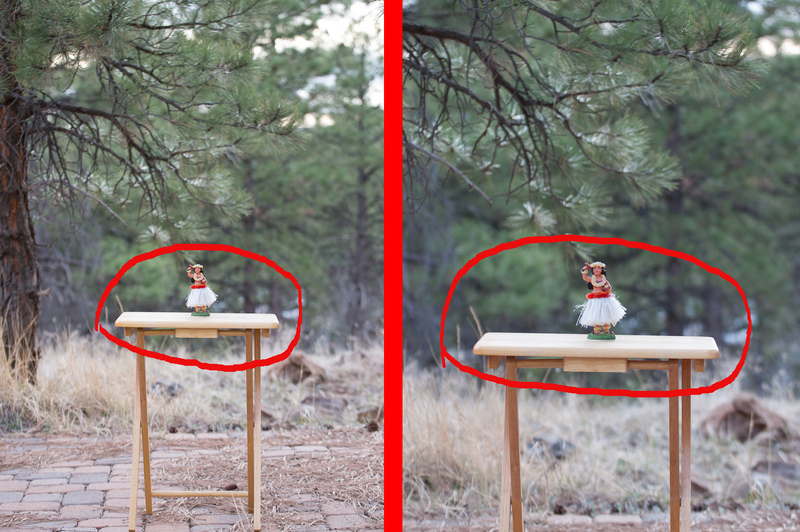 Another factor to consider when shooting with a “crop sensor” body is the effect of sensor size on depth of field. 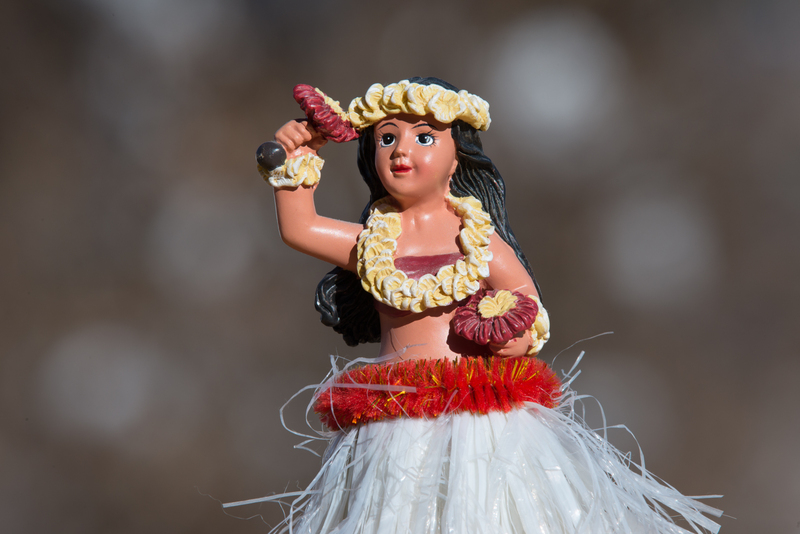 Depth of field (DOF) is the range of distances – nearest to farthest – in an image that appear acceptably sharp and in-focus. DOF is determined by magnification (lens focal length) and by the lens focal ratio or f-number. In a nutshell, bringing the subject closer decreases depth of field. 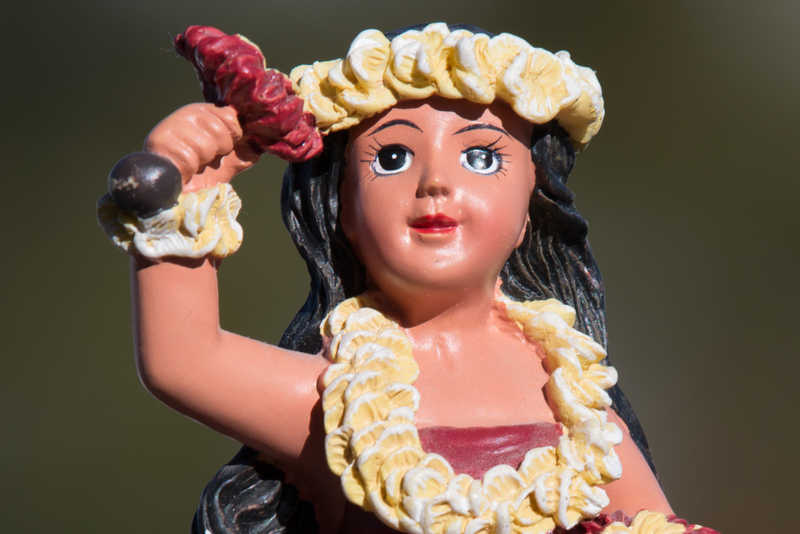 Moving the subject farther away increases depth of field. 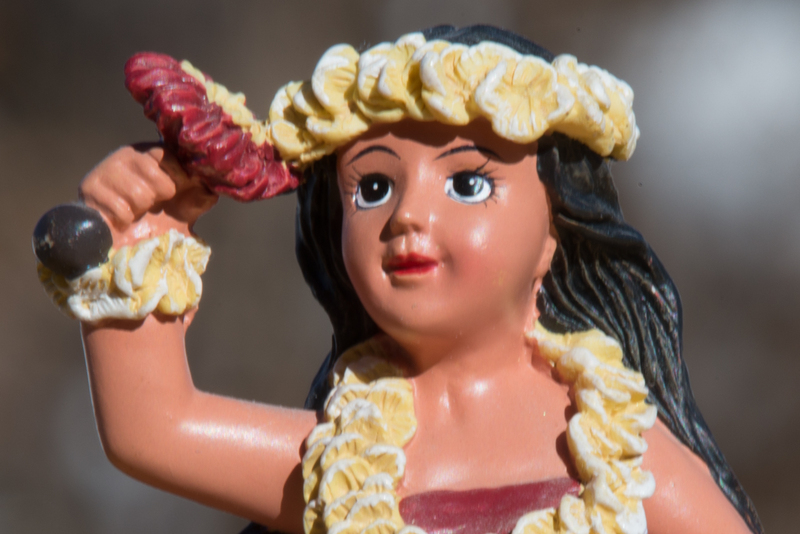 As depth of field increases, a deeper portion of the image appears in focus. 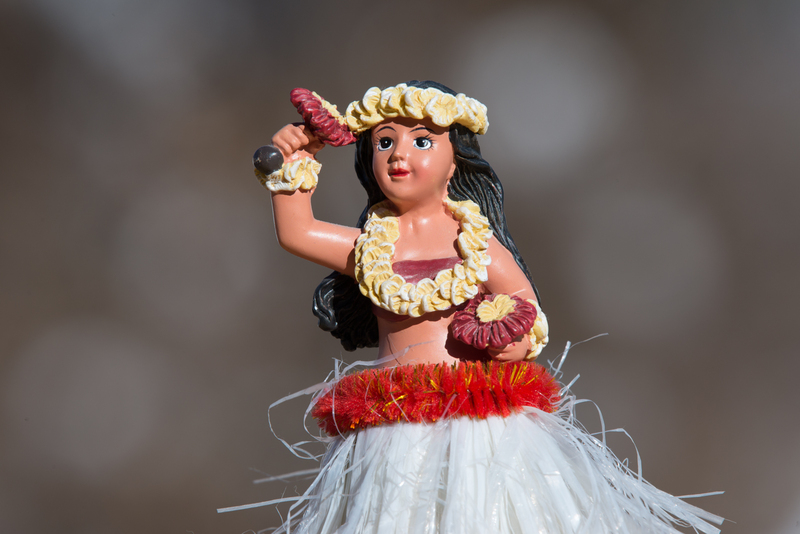 As depth of field decreases, only a narrow or shallow range looks sharp and in focus. The above photographs were made using a Nikon D610 and Tamron 70-200mm f/2.8 Di VC USD zoom lens at 125mm. 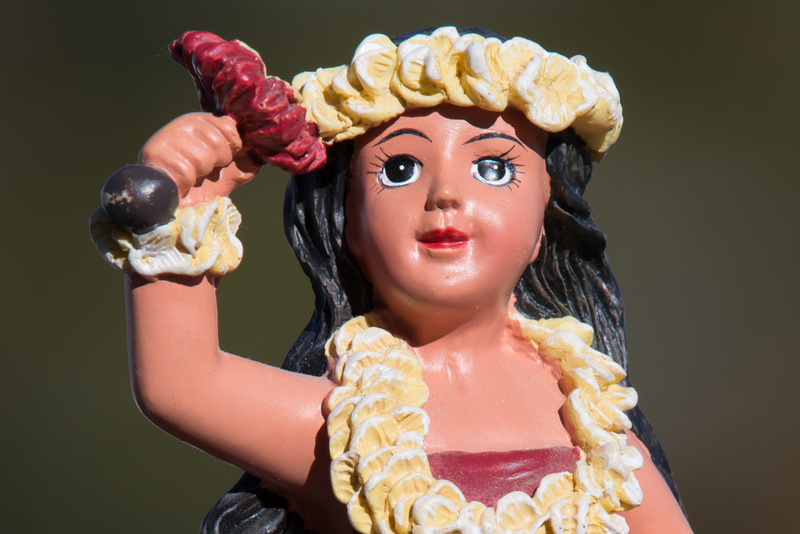 The image on the left was shot at f/2.8 and has a much shallower depth of field. The image on the right was shot at f/32 and shows much more of the field in focus. 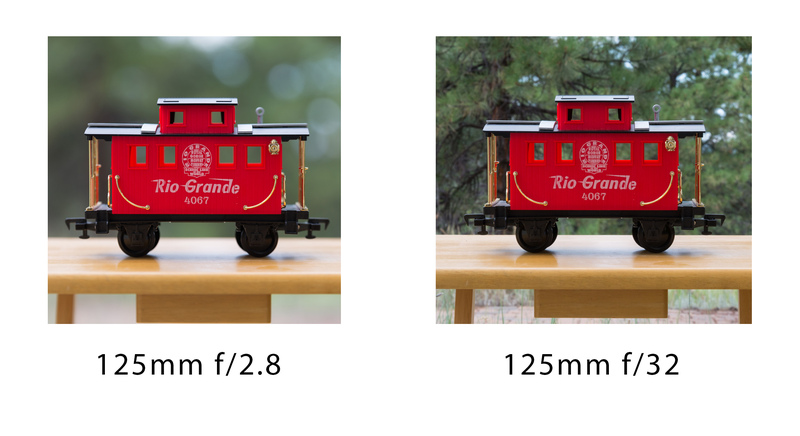 As mentioned, focal ratio also has an effect on depth of field. For any given focal length, increasing focal ratio (making the f-number larger) increases depth of field while decreasing focal ratio (making the f-number smaller) reduces depth of field. 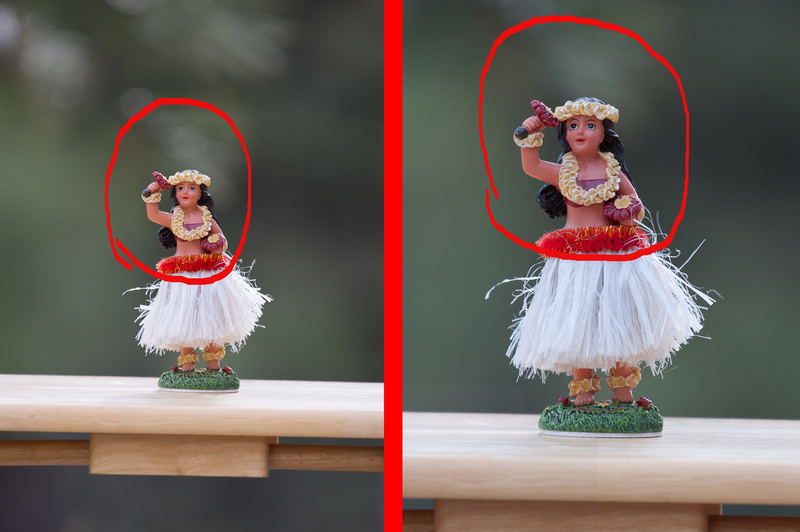 We’ve already discussed the cropping effect of shooting with a smaller sensor. 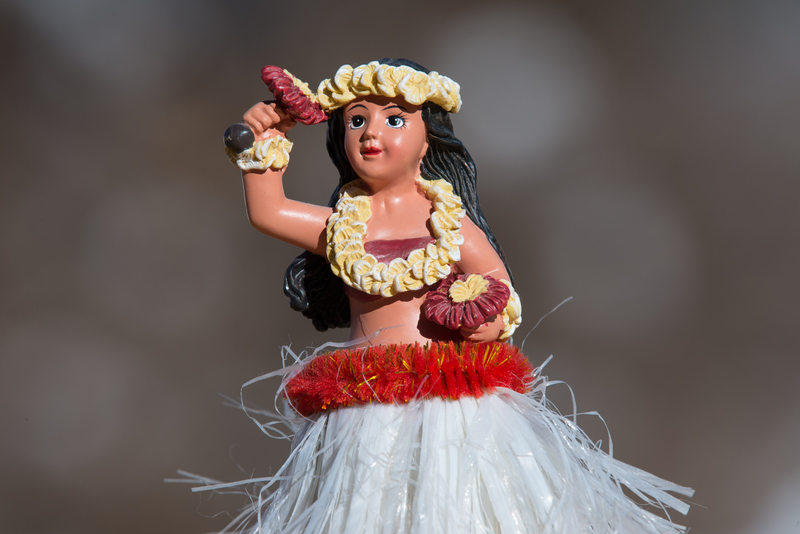 Stepping back to reproduce a desired angle of view increases depth of field. Zooming or changing lenses to shoot with a shorter focal length (to match the field of view provided by a full frame sensor body) increases depth of field. One can compensate for the increased depth of field which results from the adjustments commonly made to expand the angle of view delivered by a crop sensor camera by shooting with smaller f-numbers. For example, shooting with a 35mm lens at f/1.4 will allow an APS-C sensor body to produce photographs having the same framing and depth of field as images made from the same position using a 50mm f/2.0 lens on a full frame body. Let’s explore this in a bit more detail. Suppose you’re shooting with two cameras, one full frame and the other a crop sensor, and using the same 50mm lens with both. 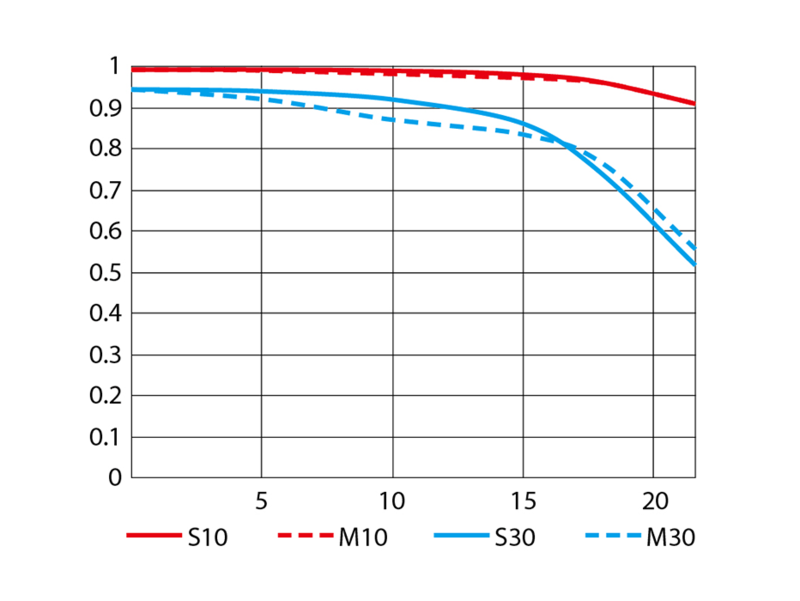 Its effective focal length (the focal length matching the angle of view delivered to the sensor) will be 50% longer or 75mm on the APS-C body. At f/4, the 50mm lens will have an aperture of 12.5mm. If we step back to compensate for the more narrow angle of view, the effective focal ratio (the focal ratio delivering an equivalent depth of field from the distance at which this lens matches the angle of view delivered to a full frame camera) will be f/6. Its effective 75mm focal length divided by the 12.5mm aperture equals six. Do you see the relationship? We’re using an f/4 lens on an APS-C body. When the goal is to match the angle of view and depth of field produced by a full frame camera, we can determine the effective focal ratio at which a crop sensor camera needs to operate by dividing the focal ratio of the lens by the crop factor. 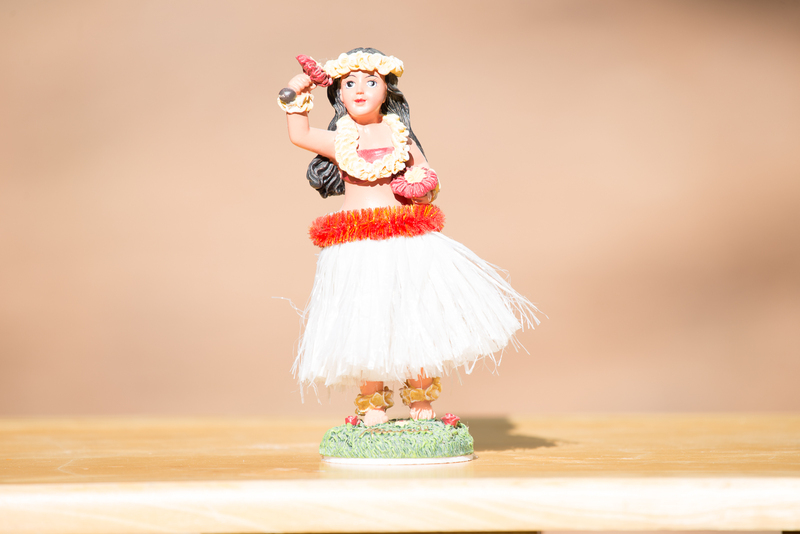 The crop factor is 1.5 and the effective focal ratio (for depth of field) is f/6. So, we’ve demonstrated that, in comparison with full frame cameras, crop sensor camera bodies produce images having narrower angles of view and, when adjustments are made to compensate for this, increased depth of field. We’ve also demonstrated that you can compensate for these performance factors. Either increase the distance between you and the subject or use a shorter focal length to increase the angle of view. 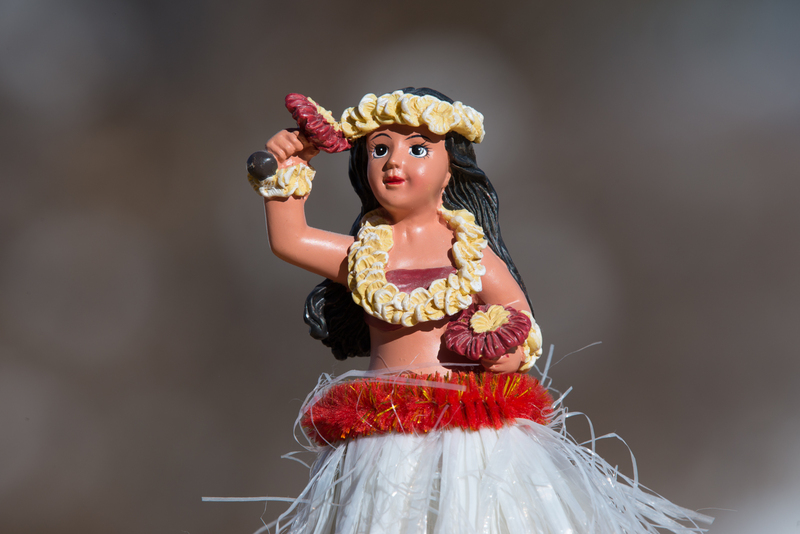 Shoot at a smaller focal ratio (f-number) to make the depth of field more shallow. Next, we’ll explore the relationship between sensor size and length of exposure. Here’s a heads up, the outcome may not be what you expect. I used my Nikon D610 (full frame) and Nikon D90 (APS-C) to take a series of exposures of a toy train engine. The toy steam engine was set up outside on a small tray table. The sky was overcast with nice, even lighting throughout the test. Both bodies used the same Tamron 70-200mm f/2.8 Di VC USD lens, which was set at 70mm. I selected ISO 200 on both cameras for all exposures. The zoom lens was set up on a tripod and the camera bodies were switched out without changing the position of the lens. I used each camera to make exposures at f/2.8, f/4, f/5.6, f/8, f/11, f/16, f/22 and f/32. I shot in aperture priority on both cameras and let their internal brains select the proper exposure. Below, are pairs of images showing the photographs made at the same settings with the two bodies, side-by-side. All are unedited JPEGs. Keep in mind that the sensor in the D90 body cropped the image to match the angle of view produced by a 105mm lens. Let’s talk more about this f-number thing. You’ll recall that focal ratio describes the ratio of the focal length of the lens to the aperture of the lens. 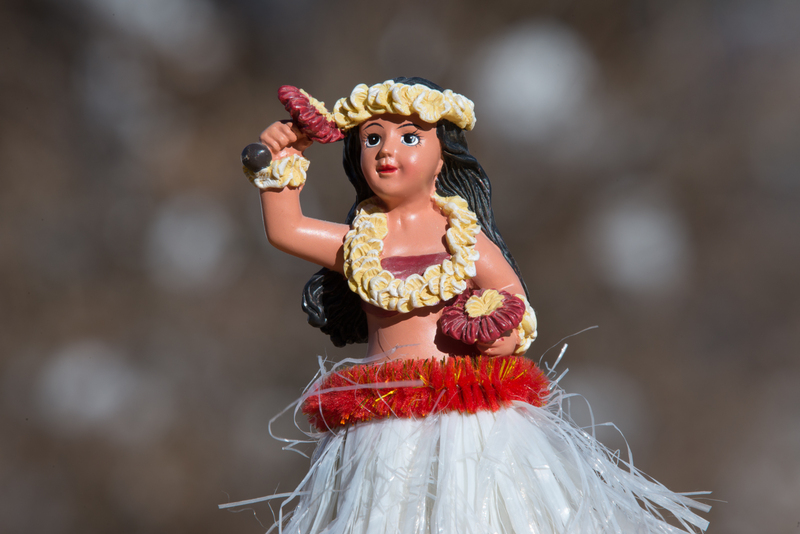 A 50mm lens at f/2.0 has a focal length that is 2-times its aperture. Therefore, the lens aperture at f/2.0 will be 25mm. At f/4.0, the aperture is 12.5mm; at f/8.0, 6.25mm and so on. The relationship between aperture and focal ratio is pretty straight forward: for any given focal length, decreasing aperture increases focal ratio and increasing aperture decreases focal ratio. Rarely, however, do photographers talk about the f-number as a focal ratio. More commonly, they talk about it as a lens aperture. They talk about an f/2.0 lens having a larger aperture than an f/4.0 lens. It’s an accurate statement, if we’re talking about the same lens at different focal ratios. But this is just one of many scenarios where focal ratios are compared. Let’s consider the scenario of discussing different lenses. Suppose we’re comparing a 50mm lens to a 100mm lens. Suppose the 50mm lens is being used at f/2 and the 100mm lens is set to f/4. 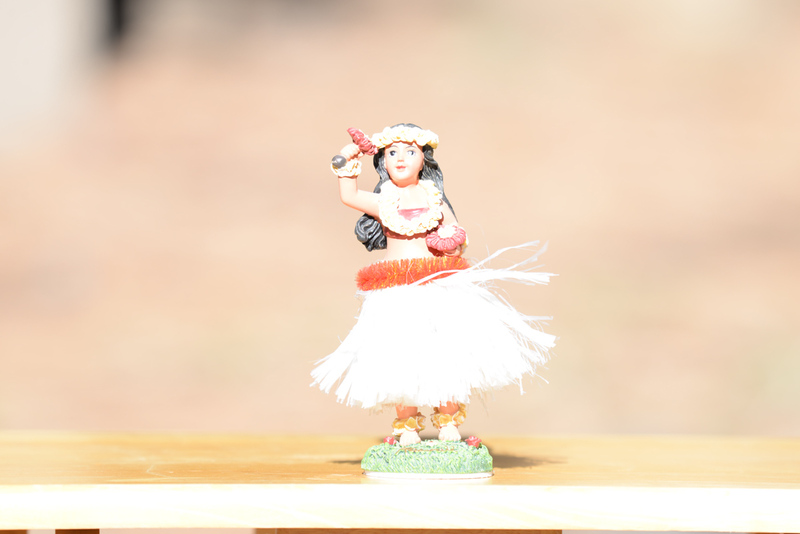 One might think the 50mm lens, by virtue of having a smaller f-number, will have a larger aperture. In fact, both lenses have identical 25mm apertures. It simply isn’t the case that every f/1.4 lens has a larger aperture than every f/8 lens. In reality, it is quite common for a lens operating at a large f-number to have a larger aperture than a lens working at a small f-number. I would wager to guess that there isn’t a focal ratio at which a 600mm lens doesn’t have a larger aperture than the fastest focal ratio smartphone. One quality that does translate across different lenses and cameras, is the speed of the imaging system. What does speed have to do with photography? To understand, it helps to think of a properly exposed photograph as one where a certain intensity of light needs to fall upon the sensor at the image plane. Think of light as water, the sensor as a container used to collect water (light) and the lens as the opening through which water is poured into the container. That said – and this next point is critical – a properly exposed image is not determined by the total quantity of light delivered to the sensor. The length of a proper exposure is determined by the average brightness of the image falling on the sensor. To better understand this, we’re going to introduce a new concept: surface brightness. Earlier, a correct exposure was described as one where a container (sensor) is filled to the correct depth (intensity) with water (light). It doesn’t matter if the container is large enough to hold one gallon or 100 gallons. As long as it’s filled to the proper depth, the exposure will be good. In this example, the depth of the water represents the average brightness of the image at the image plane. Another way to describe the average brightness or intensity of light, is to talk about image surface brightness. Surface brightness is defined as a brightness per unit area. In photography, we can define surface brightness as the brightness of light per square millimeter falling on the film or sensor. It is not a total volume or quantity of light. Rather, it is an average intensity of light. Surface brightness is strictly determined by the focal ratio of the optical system. The lens f-number determines the length of the exposure needed to deliver light of a certain intensity to the sensor. A full frame camera, crop sensor camera and smartphone camera focused on the same subject – and all operating at f/2.0 – will deliver the same light intensity per square millimeter (the same surface brightness) to their respective sensors during the same length exposure. 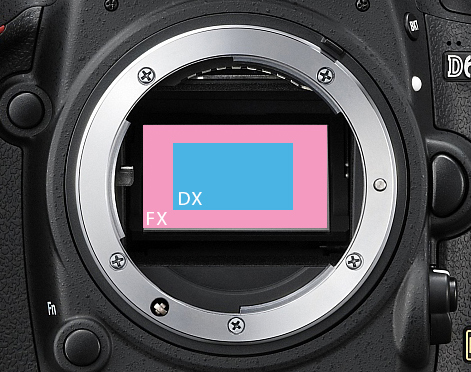 The relative sizes of full frame (pink) and APS-C (blue) sensors is illustrated above. The effects of a crop frame sensor include an increase in effective focal length and effective depth of field. Despite the fact that a crop sensor doesn’t collect as much total light during an exposure as a full frame sensor, the intensity or surface brightness of the images formed on both sensors will be the same. 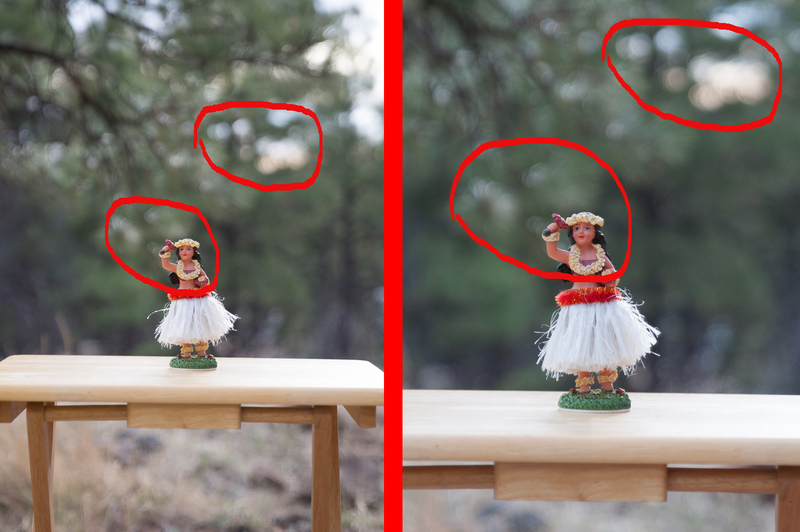 We saw this at work in the above illustrations comparing exposures made with the D610 and D90. Despite the fact that, during each set of exposures, the D90’s smaller sensor collected less total light than the full frame sensor of the D610, the image made by the D90 was still properly exposed. This is because the exposures made by both cameras produced images having identical surface brightness at the image plane. 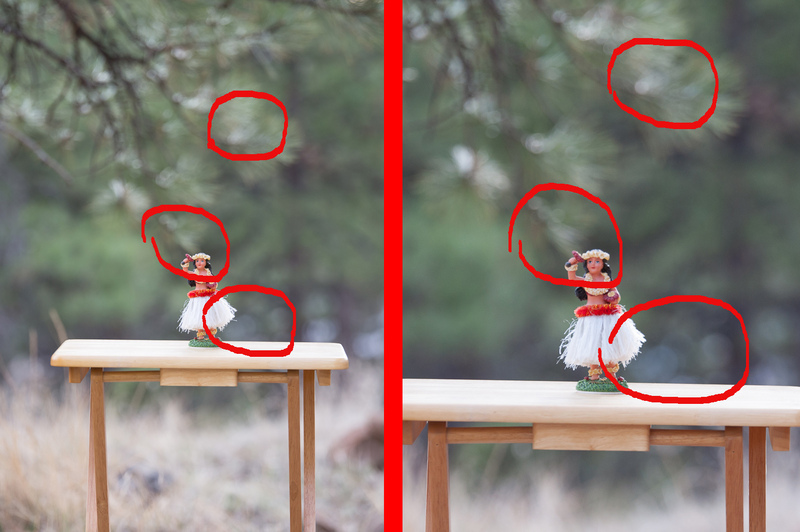 This set of images compares performance between crop sensor and full frame DSLR bodies. The images in the left column were made with a Nikon D90. Images in the right three columns were made with a Nikon D610. Both cameras used the same Tamron 70-200mm f/2.8 Di VC USD zoom lens, which was set up on a tripod to ensure it would not change position during the test. Both cameras used ISO 200, center point average metering and were operated in Aperture Priority. The subject in these photos is a scale model of the Lunar Excursion Module (LEM) from the Apollo program. The above illustration allows us to compare the performance of crop sensor and full frame cameras. The first column of D610 exposures matches the settings of the D90 images in the left-most column. Focal length and focal ratio are the same. In most cases, both cameras’ metering systems selected the same exposure. The most obvious difference between the D90 and first set of D610 images is the wider angle of view delivered by the full frame sensor. For the second set of D610 images, I zoomed in to match the effective focal length of the D90. The angles of view of these images closely match the corresponding D90 exposures. 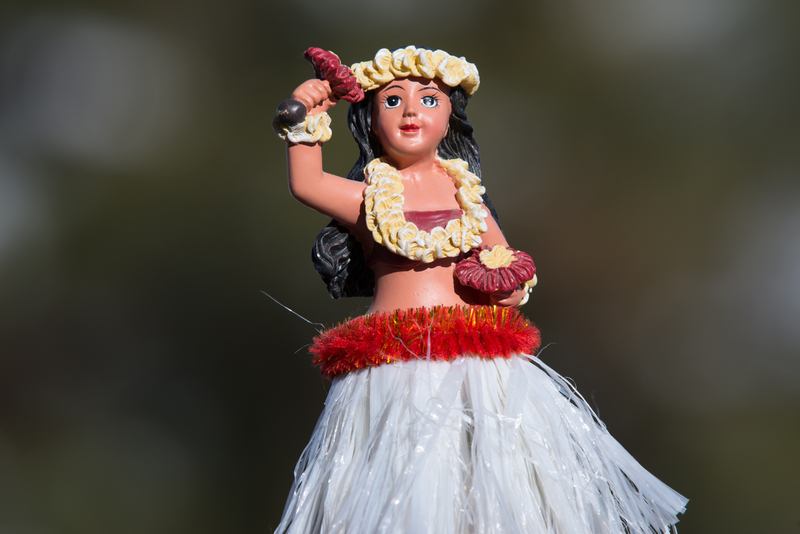 The second set of D610 images were shot at f/2.8 and clearly display a more shallow depth of field. 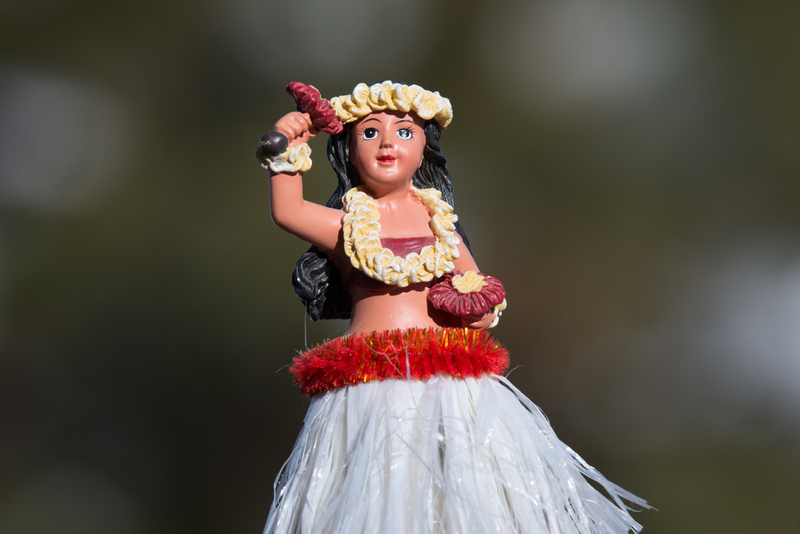 For the third set of D610 photographs, I changed the focal ratio to match the depth of field presented in the D90 images. Notice that the exposures for these images are all 1/800-second. They’re longer to compensate for the larger focal ratio. Focal Ratio is the key to understanding how different cameras, lenses and sensors are able to make good photographs using the same or similar length exposures. Focal ratio determines the length of time needed to collect enough light to make an image having the required surface brightness. For any two cameras operating at the same ISO and delivering the same angle of view, the exposure times will typically be the same. So, the next time you read or hear a photographer talking about an f/1.4 lens having a larger aperture than an f/2.0 lens, stop and give that statement some thought. If the lenses being compared are a 20mm f/1.4 and a 50mm f/2.0, the 50mm lens will be operating with a larger aperture. The 50mm lens will have a 25mm aperture at f/2.0 and the 20mm, f/1.4 lens aperture will be just over 14mm. However, due to its faster focal ratio, the 20mm lens will deliver more light per square millimeter to the sensor, faster. Because the f/1.4 lens produces a brighter image – an image having a higher surface brightness – the length of the exposure will be shorter. In photography, the objective is not to deliver the largest volume of light to the sensor. The objective is to deliver the needed intensity (surface brightness) of light to the sensor. Speed is everything and focal ratio is the key. This entry was posted in DSLR, Lenses and tagged angle of view, aps-c, bill ferris, billferris.photoshelter.com, camera, crop, d610, d90, depth of field, digital, dslr, dx, exposure, frame, full, FX, lens, micro 4/3, narrow, nikon, normal, photo, photography, sensor, shallow, telephoto, wide angle on 2015/08/15 by wdferris1@gmail.com. Last month, I did my 23rd overnight backpack in Grand Canyon National Park. The first was in 2006, an experience that forged a lifelong connection to the most spectacular of America’s national parks. During the years since, I have hiked nearly 1,160 miles and camped 109 nights below the rim. From Nankoweap to Crazy Jug north of the river and south from the Little Colorado to Bass, I’ve walked through every side canyon that empties into the mighty Colorado. What motivates these treks is two-fold. First, is the deeply spiritual experience of hiking in Grand Canyon. It is a feeling and place like no other. Second, is the opportunity and challenge of using my camera to capture the magnificence of this natural wonder. This recent trip confirmed my thinking about the equipment and techniques essential to making a successful photograph in a wilderness environment. In short, you need to get back to basics. Wilderness backpacking is an activity where success or failure rests on your ability to manage resources. The resources include the gear you bring, the food you eat and the water you drink. Successful management of these items rests on your ability to prioritize, to identify those things which are essential, of value or merely trivial. Water is essential, something you need to consume every day to maintain physical and mental well being. In a desert environment such as Grand Canyon, you had better have it or know with confidence where it can be found. Food is essential. Your pack, clothing, safety gear and first aid kit are essential. A camera and tripod, while of value, are not essential. Neither are critical to day-to-day survival. Neither is a tool that helps you get from point A to point B. Neither provides shelter from the elements or assistance during an emergency. For most backpackers, these would be considered trivial items. Most people would bring a smart phone as a resource for communication with family and friends, during an emergency. At other times, it can function as a camera. Some hikers would bring a point & shoot – something lightweight that fits nicely in a pocket – or perhaps a small tripod or Gorilla Pod. What did I do with those five pounds? Did I walk a bit lighter and quicker down the trail? Of course not. I reassigned it to photographic equipment. Instead of hiking with a crop format camera body, I now bring a full-frame sensor body. I also added a lightweight but full-size travel tripod to my kit. These items added a bit over four pounds to the weight of my pack. They also significantly increased the enjoyment I get from doing photography while backpacking. Almost any camera (smartphone, point & shoot, etc.) can make an excellent picture in the full light of day. The equipment I packed allowed me to make excellent photos in any lighting, even at night. The D610 is a top-5 ranked camera body when it comes to the combination of resolution, dynamic range and low light performance. That 24 megapixel Sony sensor is a beast. The 16-35mm zoom lens allows me to capture awe-inspiring wide angle views. An equivalent lens on a crop-frame body would have a focal length in the 10-11mm range. No smart phone or point & shoot comes close to delivering such a wide angle view. The tripod enabled me to capture quality exposures during the golden hour and at night. Without the tripod, I would have had to shoot with wide open apertures and high ISO’s to keep exposure times reasonable. With the tripod, I could use the base ISO, a small f/13 aperture and capture tack sharp landscapes during twilight. I could also make longer 1-second exposures of a waterfall to give the flowing water that silky smooth quality. Or, I could make 30-second exposures of the night sky at very high ISO to record a stunning image of the Milky Way rising over Grand Canyon. Equally important, was what I did not bring: no backup body; no second (or third) lens; no filter(s); no speedlight(s); no reflector. Under different circumstances, I would normally have brought all these items. However, in an environment where every ounce and each square inch of space matters, these accessories are non-essentials. I know a lot of landscape photography enthusiasts will question the decision not to bring even one filter. After all, filters are relatively small and light. Surely, I could have fit a neutral density filter, a graduated ND or a UV filter in my kit? Well, I could have. I also could have used that weight or space for more water, more food, rain gear, another clothing item or some other even more essential item. The bottom line reality is that much of what filters offer can be achieved in Adobe Lightroom. Shooting in RAW combined with good decision-making about what to photograph and judicious use of exposure compensation allows me to capture original exposures that can be edited in Lightroom to optimize exposure, details and highlights in any area of the final photograph. All this can be accomplished in a few minutes or less. Filters, while definitely of value, are non-essential. The 24 MP sensor combined with Lightroom’s single button click tools correcting lens distortion and chromatic aberration give me the option of shooting at 35mm in the field, then cropping to 50mm or even 75mm during post-production. In short, image processing offers the option of converting a wide angle image into a photograph captured with a standard focal length lens. Of course, the real fun during the hike was making images that take advantage of what a true wide angle lens offers. Of the more than 1,000 photographs I took during the eight-day trip, only a handful have been cropped more than about 10% during processing. Ninety percent or more have not been cropped, at all. Some may view shooting with just one lens for a week as limiting. I saw it as both a challenge and an opportunity. The opportunity was to make dramatic wide angle landscapes in a truly stunning natural environment. The challenge was to be creative with my use of the lens throughout the week. In hindsight, it wasn’t a challenge, at all. It was easy. Throughout the week, there was only one time when I missed not having a long telephoto lens in my pack. (We were standing at the edge of the Tonto Plateau looking into Vishnu Canyon and found the remnants of an old miner’s cabin. The ruins were about half-a-mile distant and, while plainly visible through a 10X monocular, were simply beyond the reach of a 35mm lens.) But for that, it was a genuinely enjoyable week of hiking in and making landscapes of Grand Canyon National Park. You don’t need to spend a week backpacking in a wilderness area to experience the joys of shooting with a minimal kit. You can do it, any time you wish. All it takes is the willingness to leave all but your most basic and necessary gear at home. This weekend, choose one camera, one lens, a tripod, a couple of spare batteries and media cards, and allow yourself to spend an entire day taking and making great photographs with just that essential equipment. Get back to the basics. Go ahead, get out there and shoot. This entry was posted in DSLR, Lenses, Techniques and tagged 16-35mm, backpack, backpacking, basic, benro, bill ferris, billferrisphoto.com, camera, d610, dslr, essential, exposure, gear, grand canyon, hike, hiking, landscape, long, national park, night sky, nikon, photo, photography, tripod, wide angle, wilderness, zoom on 2015/04/15 by wdferris1@gmail.com. 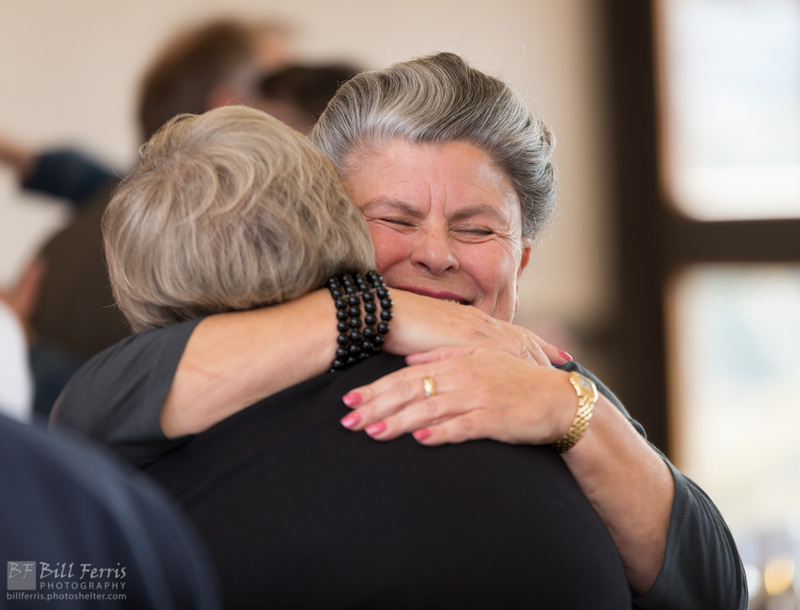 I recently had the opportunity to photograph and document a 2014 National Philanthropy Day celebration at Prescott Resort. 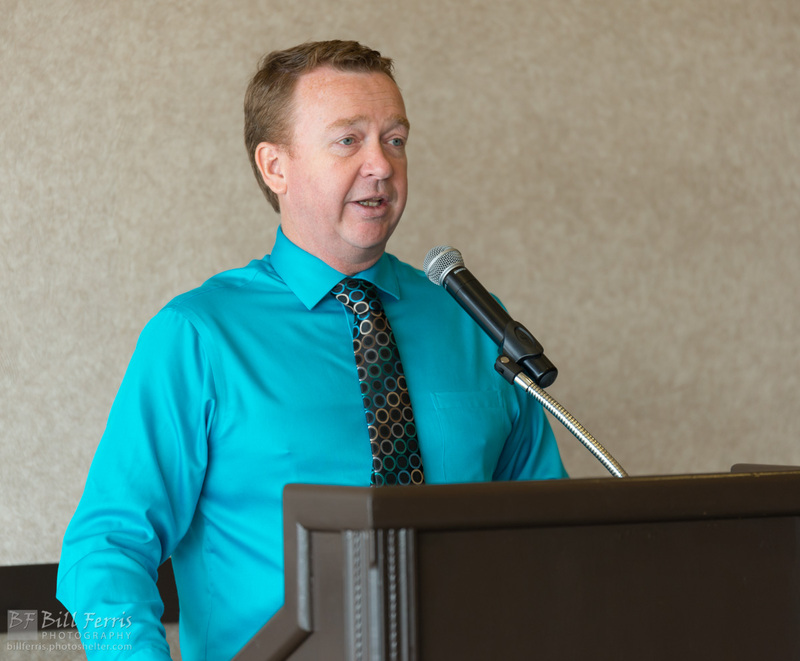 My wife, founding partner of GoalBusters Consulting and a long time fundraising professional, asked me to be the photographer for the event and I readily accepted. While my first love in photography is landscapes, I have been actively seeking opportunities to expand my horizons – and develop new skill sets – by doing portraiture, sports and event photography. Taking on this assignment would not only allow me to grow my event photography portfolio, it would be an opportunity to give back by volunteering my time and talent in support of people who make it their daily mission to improve the lives of others through the arts, charitable and other not-for-profit organizations. As you can see in the above photo, the conference room where the event was held features a panoramic wall of windows. With most clear skies on the day of the event, a wonderful, soft midday light filled the room. Seeing the award plaques displayed on a table at the front of the conference room, I started the morning by capturing a series of photos of the awards. I made at least one photo of each plaque, individually, and also of the awards as a group. After some introductory remarks by my wife and her business partner, the attendees settled in for a catered lunch. I took advantage of this break to make some photos of the attendees relaxing and chatting with each other. I also scouted the outside terrace patio for a location to use for the group photos. 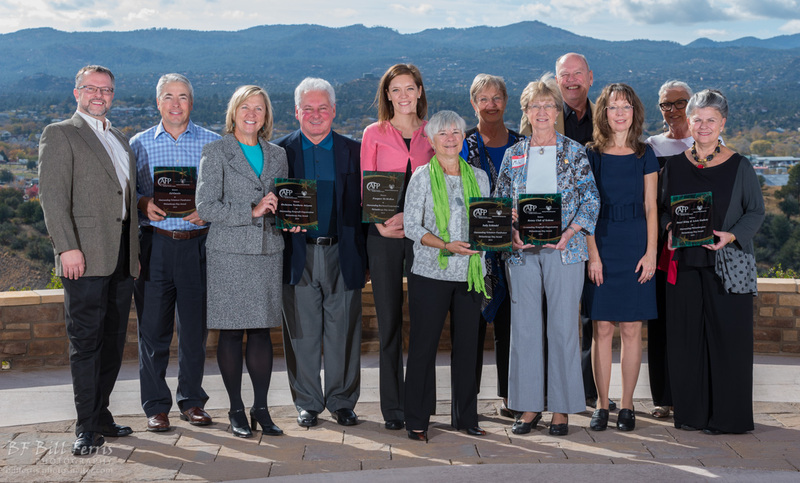 The patio outside the conference room overlooks the town of Prescott, Arizona to the west-northwest. Arranging the honorees with their backs to the terrace wall would position the sun behind and to their right. This would put their faces mostly in shadow so, I made a trip to my vehicle to retrieve the speedlight kit, light stands, umbrellas and modifiers. The photo immediately above shows how the ambient outdoor light served as a beautifully soft light source when filtered through the window wall. I would have continued to shoot the event from this vantage point with my back to the windows, if not for two significant issues. With most attendees seated directly in front of or to the left of the podium, speakers tended to look straight ahead or to their left to make eye contact with the audience. Rarely, would they look in my direction. As a result, there were few opportunities to see their eyes. The other and more significant issue was that honorees would approach the podium from the speaker’s left to receive their plaque. In hindsight, this is something I could have anticipated given that the awards were arranged on a table along the wall behind and to the left of the speaker. When the first honoree approached the front of the room, she quite naturally stood to the left of the podium. This placed the podium between me, the honoree and her presenter, which made for an unflattering composition. I walked around the back of the room to the other side to get a better angle on the presentation. While standing with the podium to my left gave me an unobstructed view of the award presentations, it also meant that I was more or less facing the window wall. A proper exposure for the half of a person’s face illuminated by that gorgeous ambient light would leave the other half of the face darkened by shadow. A proper exposure for anything in shadow would leave the rest of the shot blown out. Earlier after retrieving my speedlight kit from the car, I had made the above photograph of the attendees enjoying lunch in the conference room. Wanting both the view through the windows and the interior of the room to be properly exposed in a single shot, I had set up four speedlights to illuminate the room interior during the exposure. Two were Yongnuo YN-560 III’s, which have built-in radio receivers. The other two were Nikon SB-700’s, which were mounted on Vello FreeWave Fusion radio receivers. With a Yongnuo 603 NII radio transmitter attached to my Nikon D610 hot shoe and a Vello radio trigger mounted atop the 603 NII, I experimented with shutter speed and flash intensity until I was happy with the result. While making my trek to the other side of the room to a vantage point with an unobstructed view of the honorees, I powered up and the speedlights (they were still set up and in position) and switched on the radio triggers on the D610. After a couple test shots to adjust settings, I was back in business. My only concern with this set up was that the speedlights, when firing, would be something of a distraction for the attendees. However, I can safely say very few people even noticed I was using flash to illuminate the room. There was one gentleman who asked me about my lighting after the awards ceremony. Rather than finding it a distraction, he wanted to know more about the radio triggers and receivers. While processing the RAW exposures, I noticed that the depth of field at f/5.6 was not quite enough to guarantee crisp focus on the eyes of both people. While the images are acceptable (in my opinion), I would probably shoot at f/7.1 or f/8 in the future to ensure sharp focus on both sets of eyes. After the ceremony, I went outside with the honorees and presenters to take the group photos. I made an exposure of the full group without using speedlights and, as expected, the faces were in shadow. After retrieving the Nikon SB-700’s, I recruited a couple of lighting assistants to hold the speedlights, one to the left and the other to the right of the group. I then made an exposure firing the SB-700’s at full power. This photo looked overexposed so, I reset the flash intensity to 1/2-power on each unit and retook the group photo. The resulting image is presented, above. While the speedlights definitely help this photograph, I should have done a better job of arranging the group so nobody would be in shadow. Also, I had to do a fair bit of processing in Adobe Lightroom to recover highlights and reduce the overall exposure. Shooting in RAW compensates for a multitude of sins. I reduced the exposure by 1.10 stop without losing any detail in the final image. So, what did I learn from this experience? First, it is critical to be equipped for any lighting situation. The speedlights gave me more shooting options. When the ambient, natural light was at my back, I could simply switch off the radio triggers. When shooting toward the window wall and into the light, I could switch on the triggers and use the speedlights to illuminate my subject. 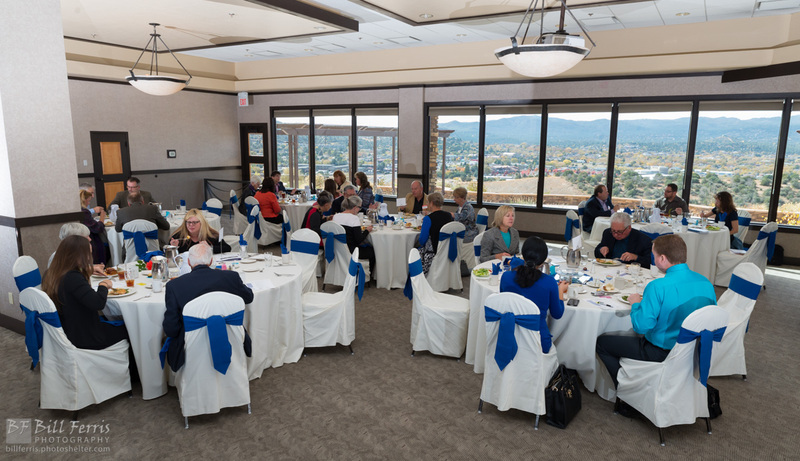 Second, using down time (I chose to forego lunch) to make the wide angle photo of the luncheon paid huge dividends. With the speedlights already set up, it only took me a minute to power them back on and adjust their intensity. As a result, I was able to very quickly adapt to a new shooting location and a different lighting environment. I only missed photographing one award presentation during the ceremony and was able to make that up as soon as the ceremony ended. Finally, I should have taken the time to better arrange the group shot and do test exposures on the outdoor terrace. This would have taken only a few minutes, but would have resulted in better images and saved some worry on the drive home. Shooting in RAW allowed me to recover all the detail that was lost in the original, overexposed photographs. If I had taken the time to properly arrange the group photo and to adjust my exposure settings, those original RAW files would have been better exposed and nobody would have been in shadow. I was also reminded of the joy of giving. As each presenter shared the story of their respective honoree, I was so impressed by the generosity and compassion of the human spirit. 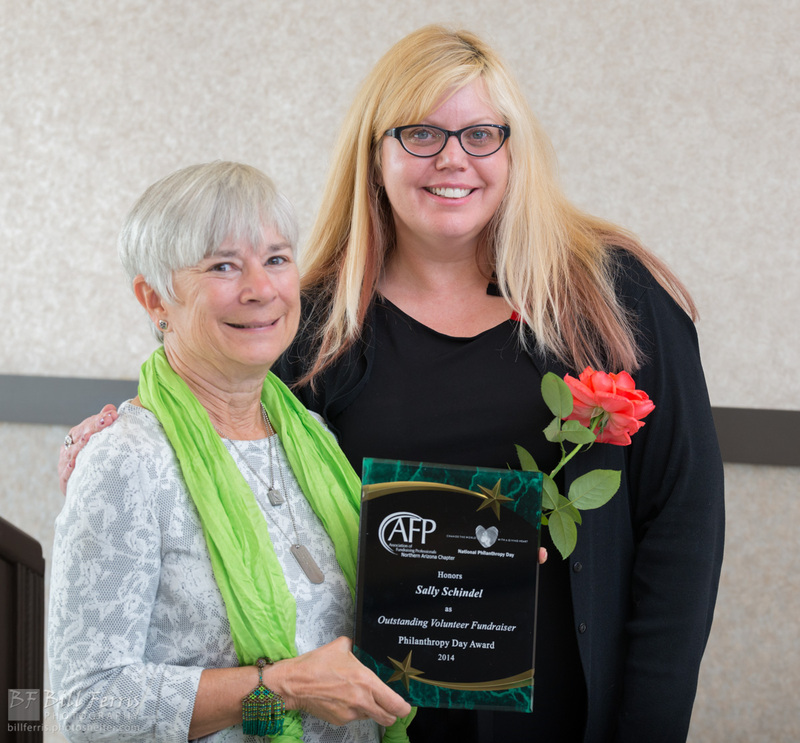 Each award recipient had generously given their time, talent or treasure in support of a non-profit organization or cause. Attending this event and hearing these stories, I was reminded that the simple act of giving often delivers the greatest personal rewards. Now, get out there and shoot. This entry was posted in DSLR, Lenses, Techniques and tagged 24-70, 70-200, AFP, arizona, Association of Fundraising Professionals, award, bill ferris, bill ferris photography, billferris.photoshelter.com, ceremony, d610, event, f/2.8, flash, honoree, lens, light, National Philanthropy Day, natural, nikon, NPD, philanthropy, plaque, Prescott, presenter, radio, receiver, resort, speedlight, sunlight, tamron, trigger, vc, vello, Yongnuo, zoom on 2014/11/15 by wdferris1@gmail.com.